So what have we been up to for the past few days? 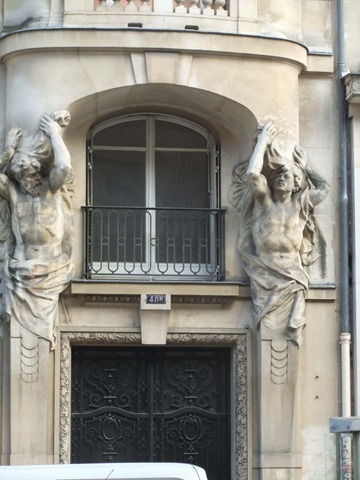 Enjoying Paris of course. 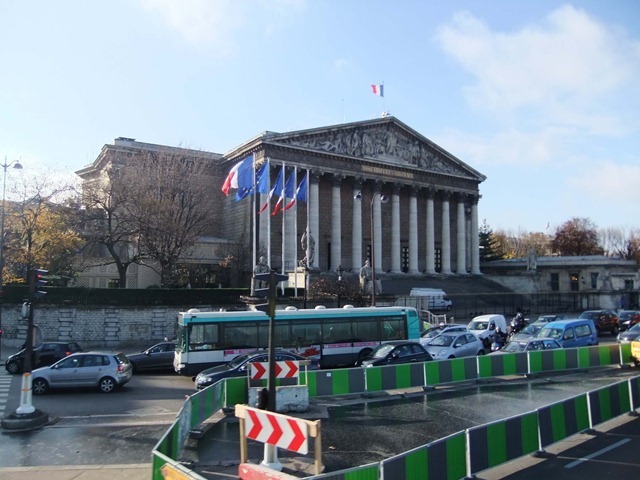 We are staying here for another couple of days as it seems everywhere is covered with snow so best we make use of the Metro and well and truly see the sights of Paris. A full report will come tomorrow, or the next day! We woke this morning to this…. Bernice at the bus stop!!! And yes, I am wearing a thermal, a shirt and TWO possum merino jerseys!! 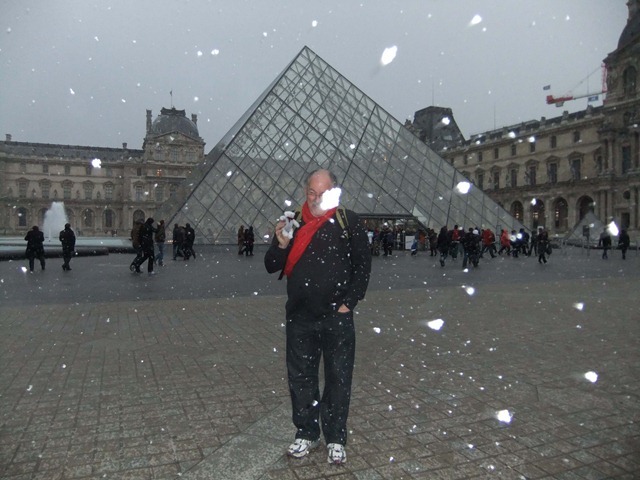 In the meantime here are some shots of Snow enjoying himself in Paris despite the snow. 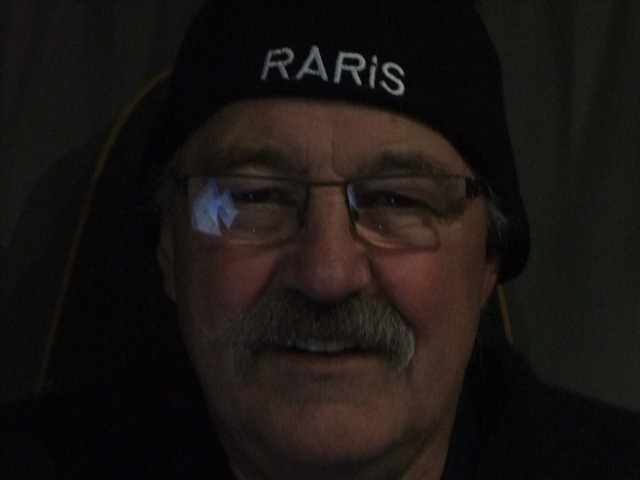 It was so chilly that Roy decided he needed a hat, last time that he is allowed to shop for items by himself as he came back with this hat. And no, he had not spotted the spelling mistake either! However quick work by Bernice soon rectified the situation. No wonder it was so easy to drive a bargain!!! Oh and the temperature did get up to 1C today, but it is forecast to get to minus 10! We woke to white crisp frost this morning, are we ever pleased we have lots and lots of heating! 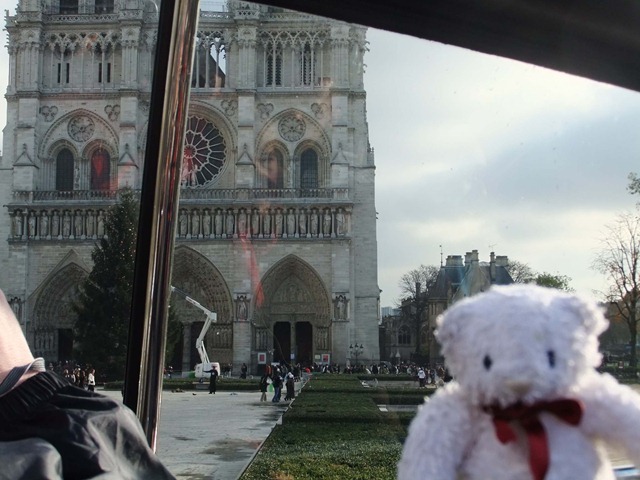 Off into Paris this morning, first catch the bus and then the Metro, we managed to do this without any hitches and we were soon in central Paris. Oh, what a beautiful city! Although it was VERY chilly, we were well rugged up or so we thought. We were both wishing that we had our winter coats and scarves that we had left behind in England with Hilda and Ken. Oh well. 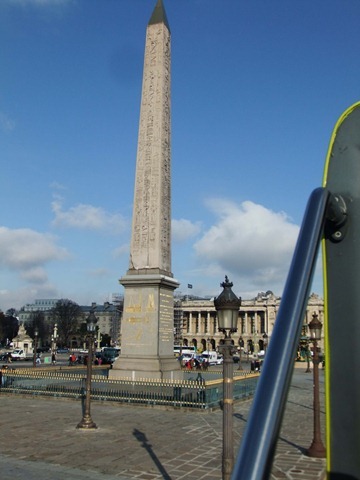 Off to find a Hop on Hop off bus tour which would give us a good overview of Paris. 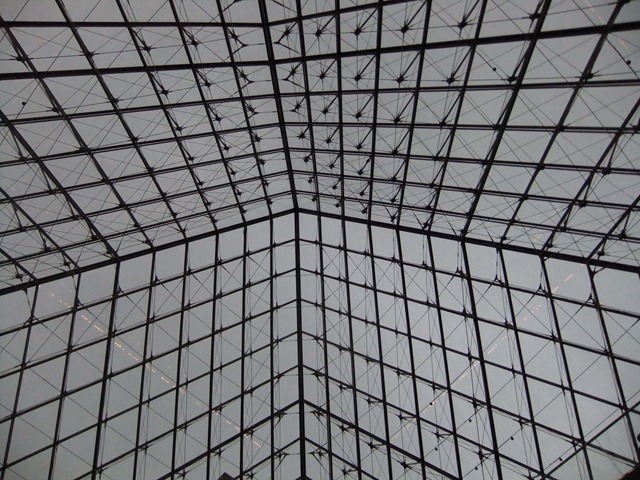 After much asking of questions we were directed to the metro again with instructions to go to the stop after the Louvre. 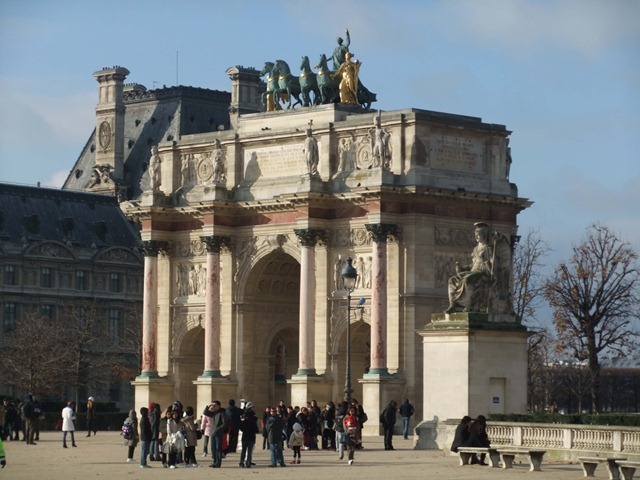 So, being good independent Kiwis we decided that getting off at the Louvre would be a better bet as any decent Hoho bus service would have to come through past the Louvre. 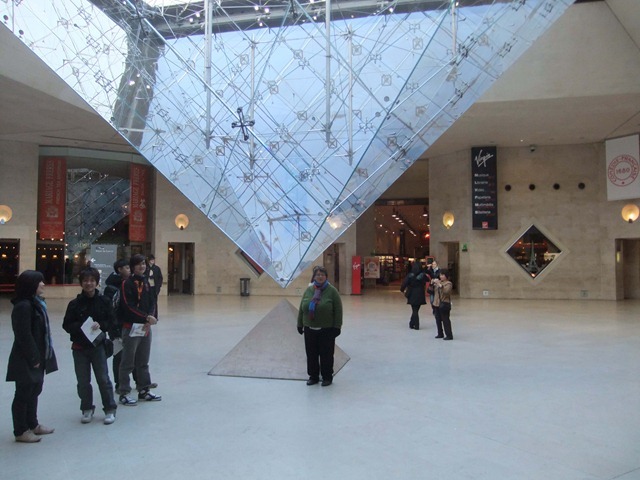 We thought this was the bottom end of the pyramid entry to the Louvre. No, it turns out to be the centre point of the Carousel of the Louvre a very up market shopping area outside the Louvre. Found our way out and,sure enough, there was the Hoho bus stop. 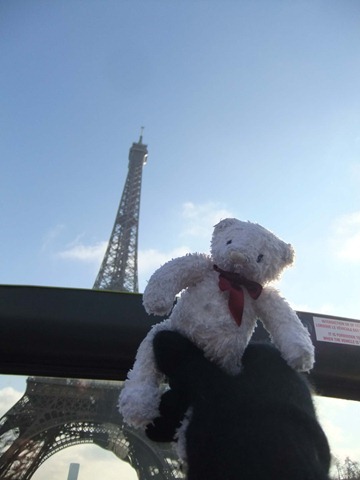 We spent the next couple of hours on the top of an open top bus seeing the stunning sights of Paris. The photos tell it all. 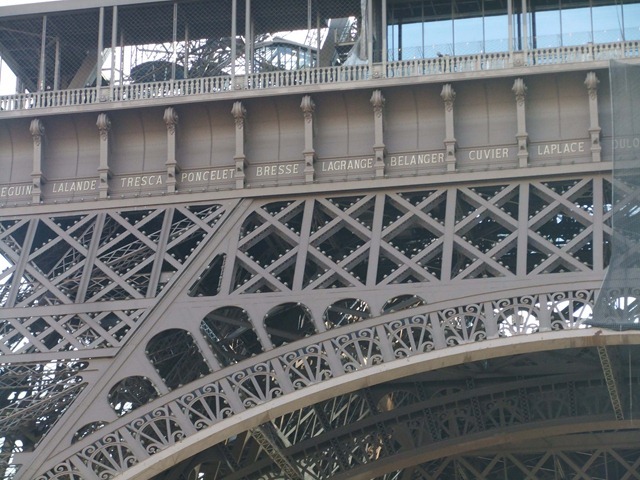 I did not know that the names of famous French scientists were inscribed on the Eiffel tower. Will have to look at all the sides tomorrow. By the end of the trip we were both freezing cold. So it was off to find a hot meal and drink. 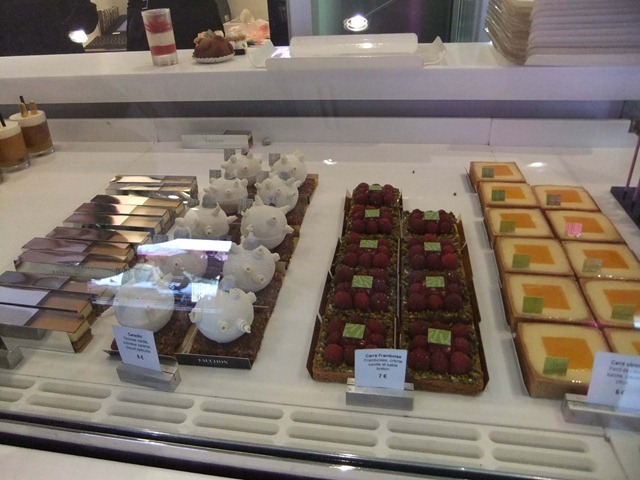 We were delayed somewhat when we found a likely looking boulangerie named Fauchon. 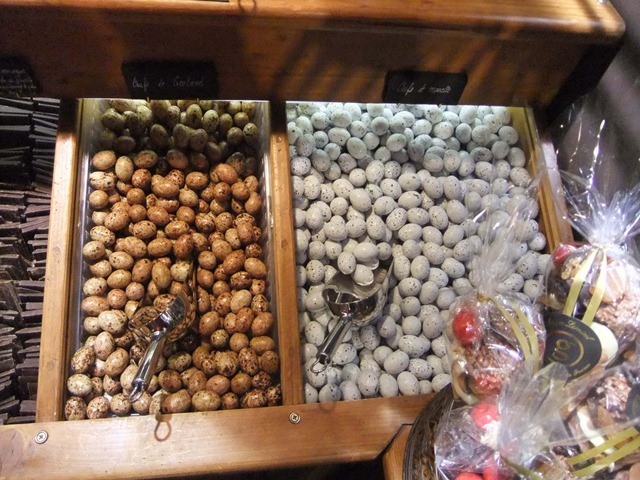 Little did we know we had stumbled across one of the premier food shops in Paris. 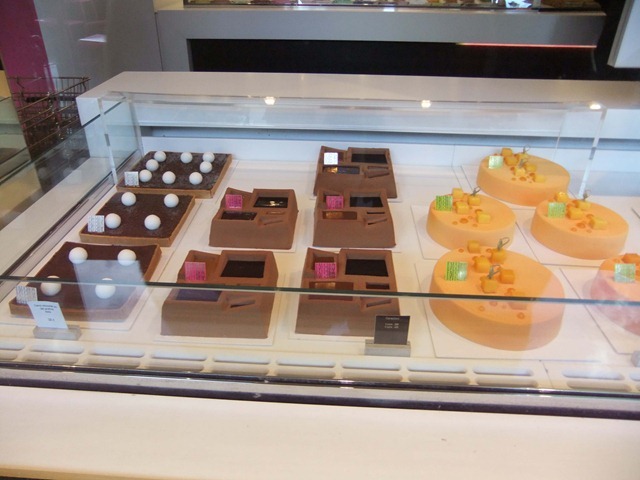 The selection was extensive covering all types of specialty items. 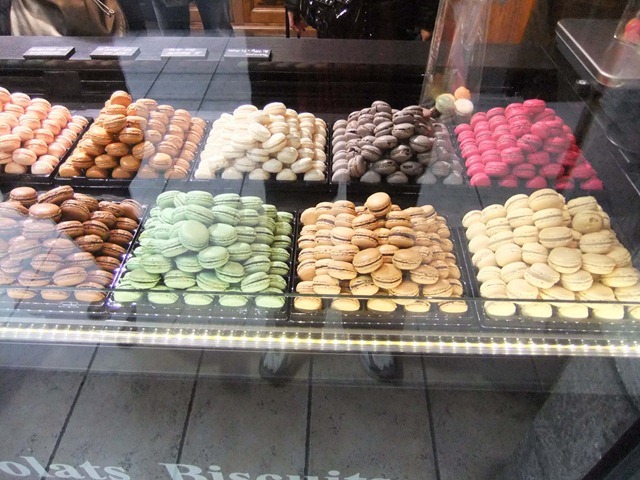 But the prices were also extensive, 4 Euro each for small biscuits. However it was nice to wander and see what they offering in two different buildings across a number of floors. 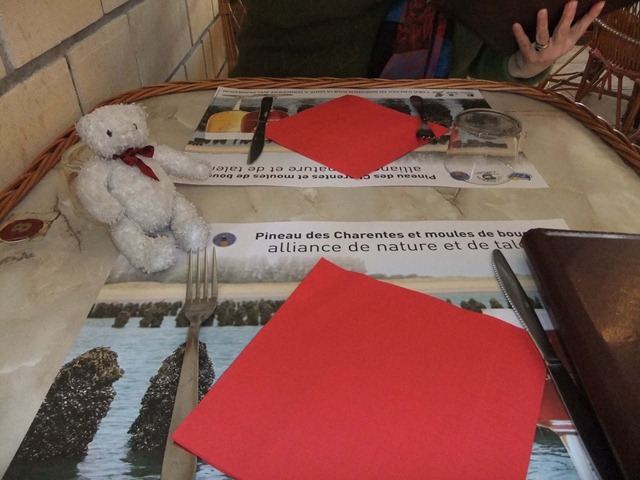 However we found both hot food and hot drinks in a small brasserie somewhere (nothing like wandering around until you find what you want and then figuring out where you are and how to get where you want to go). 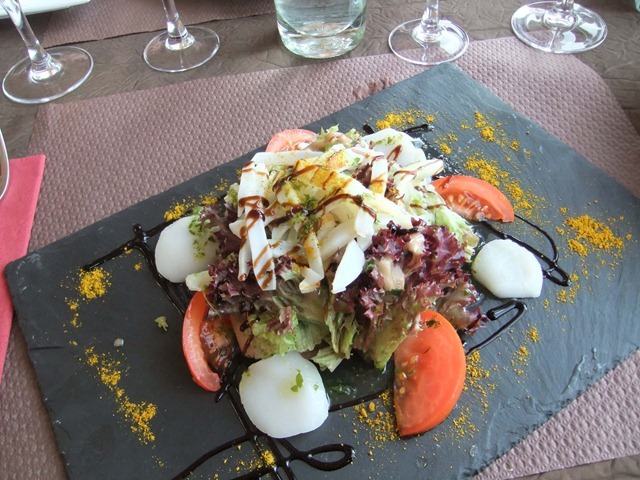 Very good service, good food and restored to normal temperature. 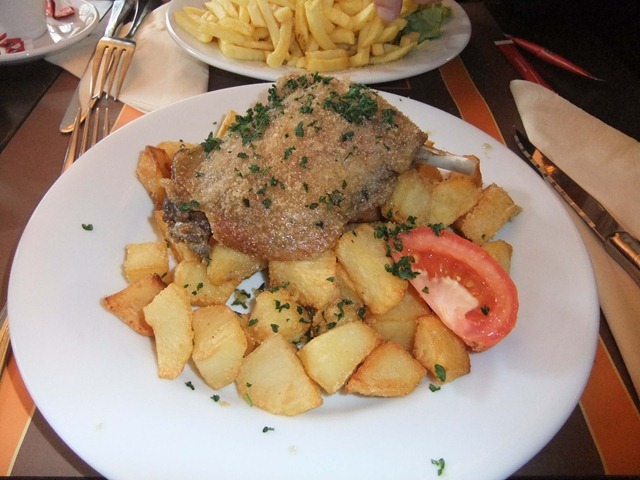 DUck confit with garlic roasted potatoes. 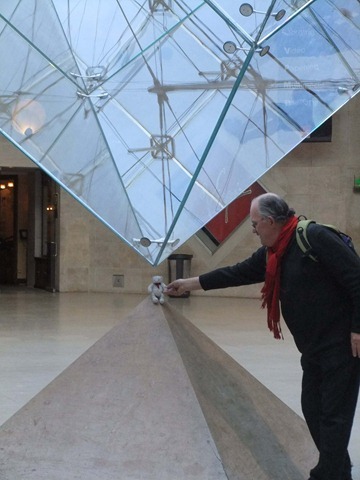 It was getting rather late in the day by the time we finished so we decided to head back to the Louvre. On the way we spotted a nice looking cafe with an attractive coffee and extras menu. What a disaster!! Ordering was OK, delivery of the coffee and hot chocolate was OK. The coffee was terrible, the hot chocolate tasted of coconut (probably palm oil), the whole experience was a disaster. 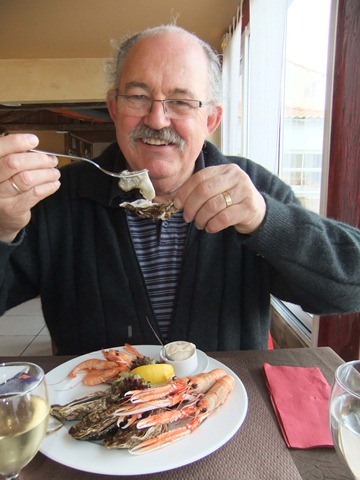 Then we tried to attract the waiter to pay with absolutely no success (they were too busy chatting) and even when we approached them with the money and bill they were very off hand. 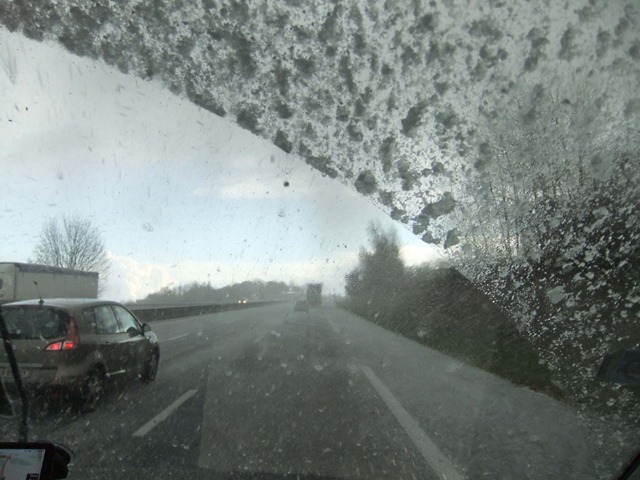 Then to top it all off it started to snow as we exited the premises. 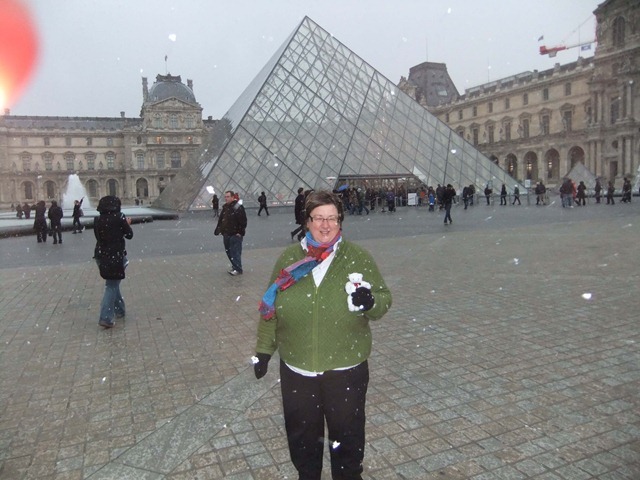 We made our way to the Louvre and decided it was too late to go in, so we were off to the Metro and bus to get home. Not too difficult, that is until we got off the Metro and tried to exit the station by the right exit. Oops, neither of us could remember the name of the street where we had entered the station, we were disoriented and came up to ground level in a convention centre. Oh dear, after questioning a few people, wandering in rather a random pattern we finally found our bus stop. Onto the bus and off we went. 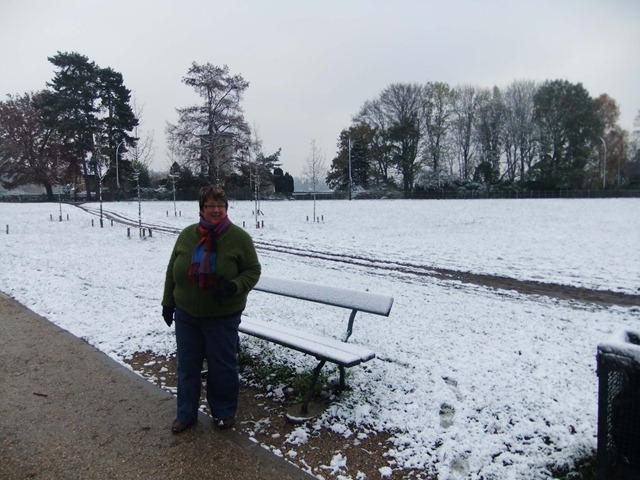 The snow started again but fortunately very little by the time we got off and walked the 200 metres home. Then after collecting our laundry, we decided to walk to the other side of the river to find McD’s for our internet fix. Off we set with clear instructions on how to get there, which after about 25minutes or so, we eventually found it. 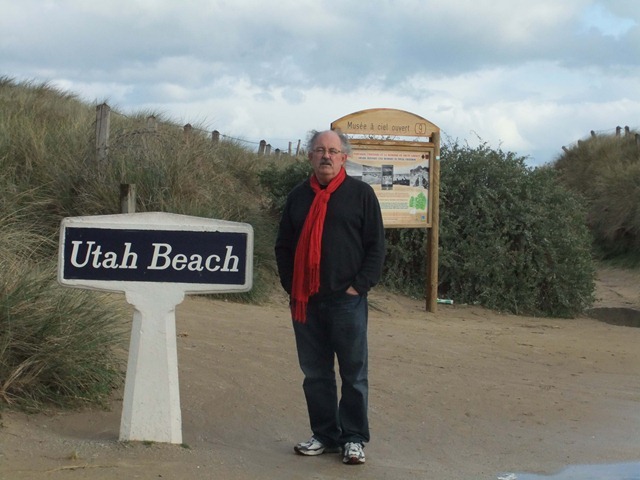 Settled in to update the blog, catch up with emails et al, and then discovered that our friends in Oamaru had gathered at Pen-y-bryn to celebrate US Thanksgiving with the Jameses. Thanksgiving just so happened to coincide with Bernice’s Birthday. The following is a link to a short video of the amazing Birthday cake that Anne, Paul and Bridgette organised and had made for Bernice in absentia http://www.youtube.com/watch?v=f7ZW_tzGPPM. Wow, what can we say except thanks guys, very humbling and emotional to watch from this side of the world. Snug as bugs in rugs we, we settled in for the night. Bernice was woken this morning by a birthday phone call from Antony, which was a very nice surprise. Roy was out doing his usual early morning wandering so by the time he was back, the car park surrounding the van was starting to fill up, so it was decided to beat a hasty retreat to save us from getting blocked in. 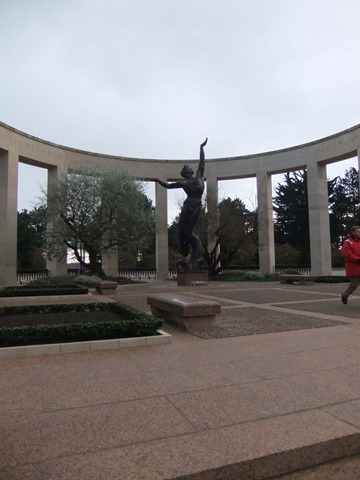 That done, we had our breakfast and then set Heidi to take us to the British war cemetery in Bayeux…this time we programmed her so that our setting was as a truck so we would not be taken through the VERY narrow back streets of Bayeux. Oh how wrong we were. 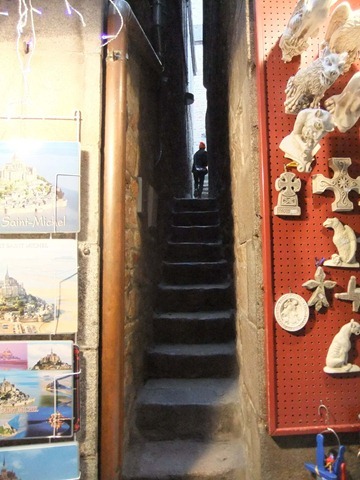 We were in fact taken through probably one of the narrowest streets of the city, getting stuck on one corner as a delivery van had parked right on the corner making it near impossible for us to get around. 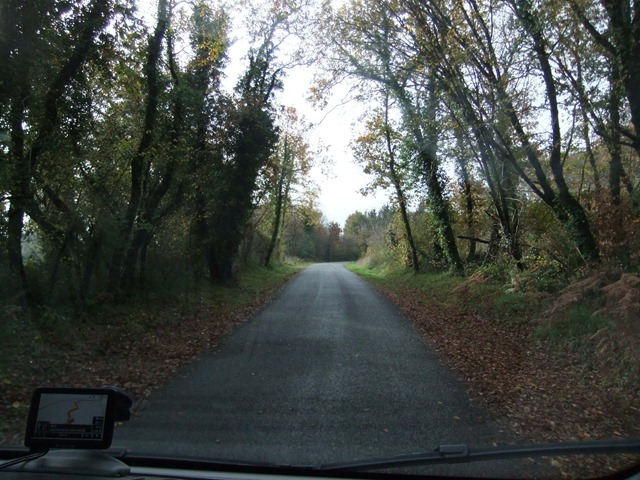 The vans driver was nowhere to be found, oh, and Alex happened to ring just at this moment, but with some skilful driving and manoeuvring by Roy and some excellent guidance by Bernice, we eventually made it around the corner. We made our way along the one way street straddling the street and footpath. We arrived at the cemetery (which was on a main road, we still have no idea why Heidi took us through this narrow back route) and spent the next while wandering through the grave markers. This cemetery was very different to the American one, in that anyone could wander around at will as is usual with most cemeteries. The only people we met there were gardeners who were tending to the flower beds, each marker has different flowers planted at their base. 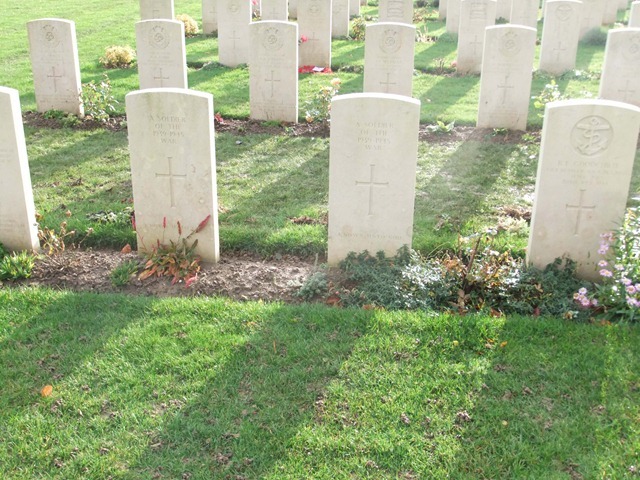 There are 8 New Zealanders commemorated at this site, however, we could not find their graves. Again, it was extremely poignant and very moving. So many many young men/boys lost their lives. 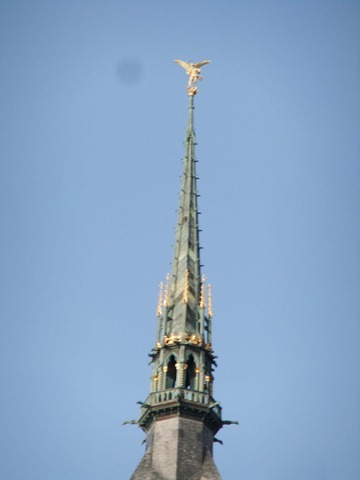 Note the inscription over the top. Soon it was time for us to get on our way to Paris. 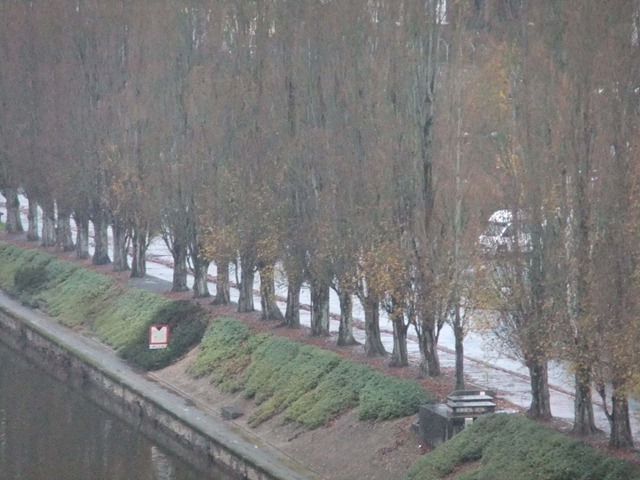 It had also turned very cold and icy, and started to snow!! So back into the warm van and on our way. 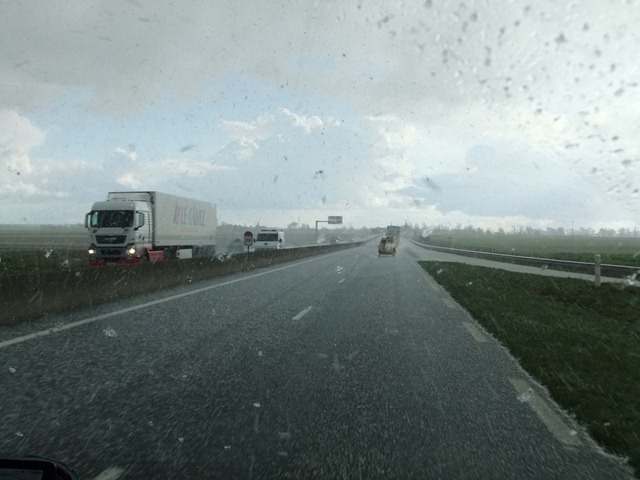 We seemed to encounter all sorts of weather along the way including some very heavy snowfall, hail, rain and sunshine. 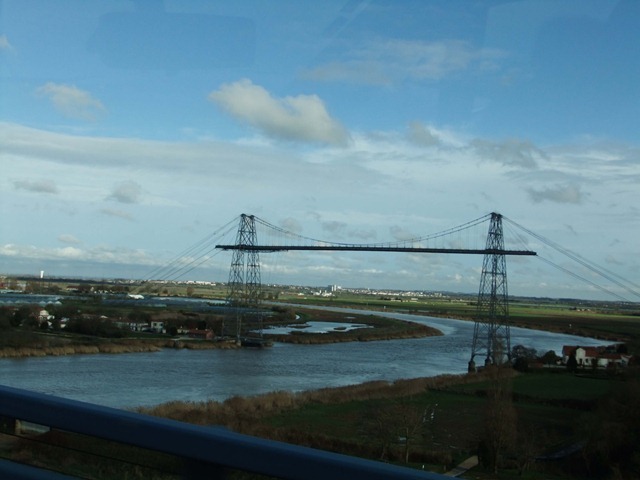 The following five photos were taken in this sequence over a stretch of 220 kilometres. 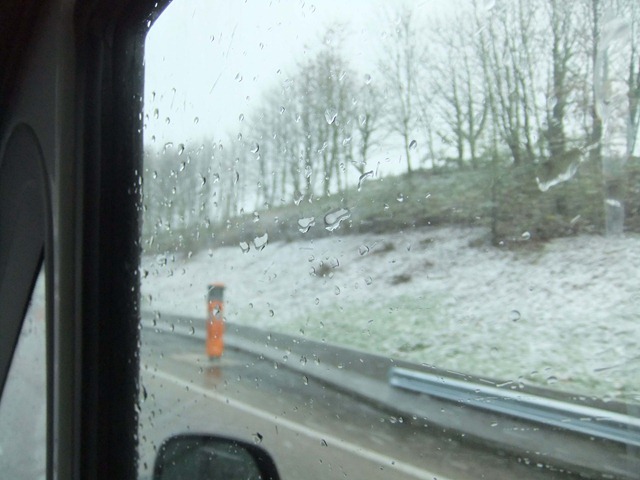 Our drive into Paris was uneventful (apart from the snow), and we got to the camp ground with no problems. 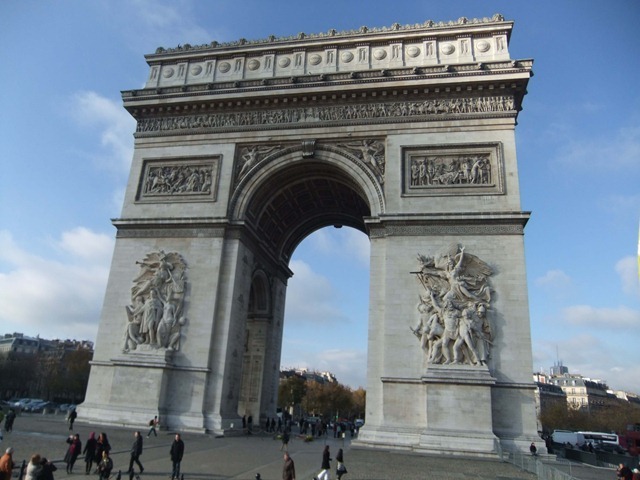 We are right in Paris, parked up in the camp alongside the River Seine and just short bus/train ride into the hub of the city. As it was bitterly cold when we arrived (and snowing again), we needed to get some more gas for the heating as we did not want to run out. However, next problem, the French it seems have different connectors for their gas bottles to the rest of Europe and although we have converters for Italian/Spanish etc gas bottles it seemed as though we were unable to get anything in France. So for the last hour or so of dusk, in the freezing cold, Roy managed to eventually sort out the problem and we now have plenty of gas to keep us toasty warm in our van. We celebrated Bernice’s birthday in the van, having decided to stay in, keep warm and get an early start on Paris tomorrow. 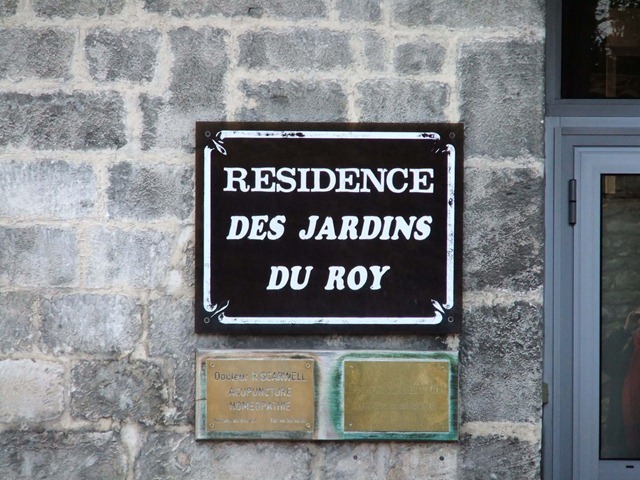 Dinner was a delicious risotto of champignons, bacon and zucchini all washed down with Pineau followed by some wonderful hand made chocolates Roy had found in Bayeux. 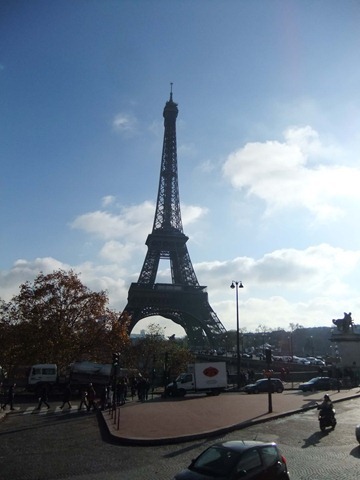 The next few days in Paris we will be doing all the usual touristy things, plus a few surprises no doubt as well. 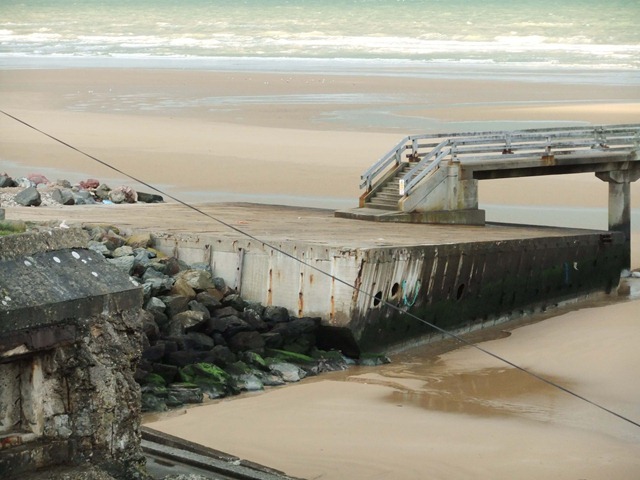 The early morning riser in the team was out and about getting shots of the remains of the ‘Mulberry’ harbour at Arromanches. This one was named Port Winstone. 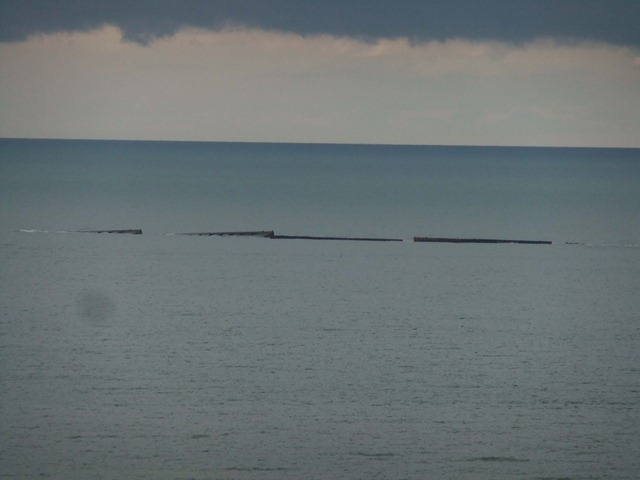 The remains were a number of caissons stranded on the beach, and an arch of concrete barriers that had formed the original breakwater at the seaward side of the Mulberry. 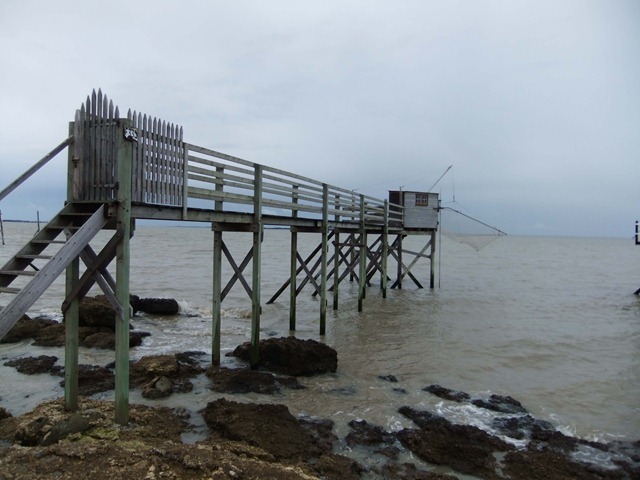 This is one of the pier sections. 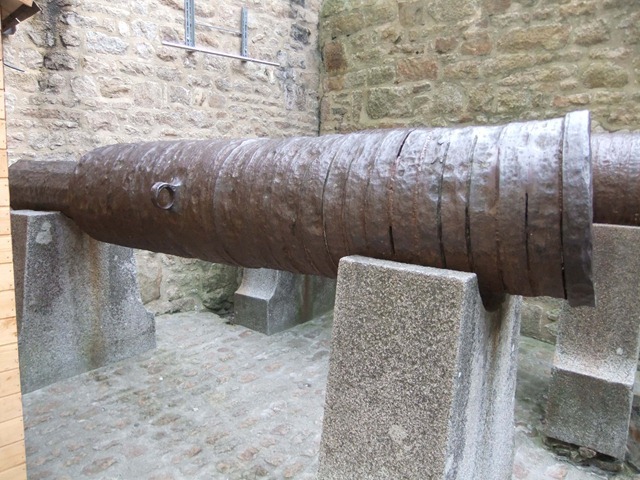 This would have been mounted across the caissons to form the roadway from shore to the ships. 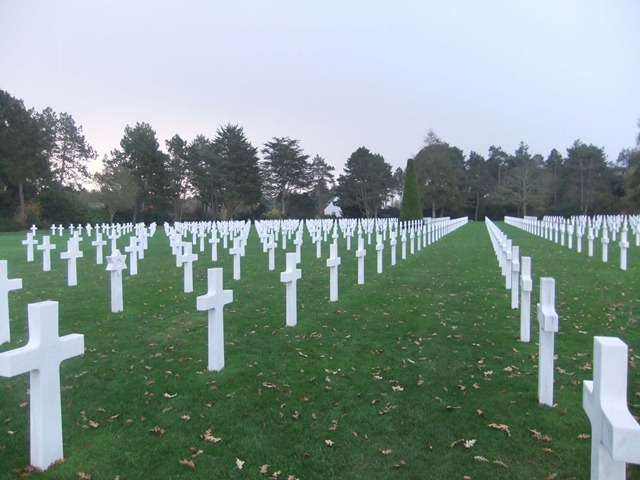 It was action in reverse this morning, as we reversed our track from the previous day to head back towards Utah Beach to visit the US Military Grave site. 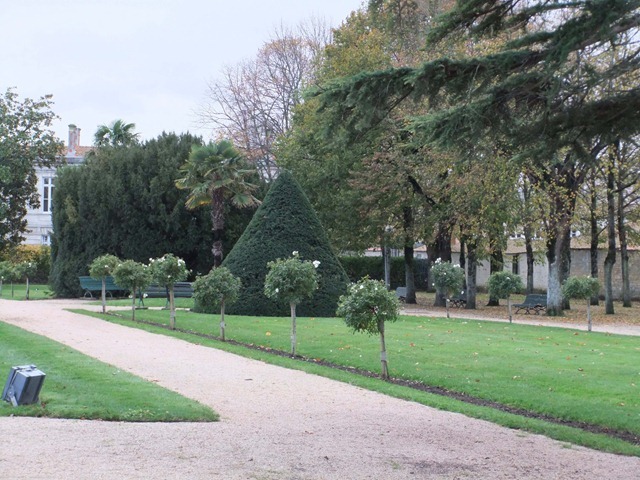 This site covers contains over 9,000 graves. The site itself is very impressive, as you first arrive through manicured lawns (not a weed in site), perfectly trimmed trees and shrubs, dignified…… until we reached the entrance, when in typical over-the-top American way, you have to empty pockets, remove jackets/cardigans/scarves, and go through metal detectors and scanners. 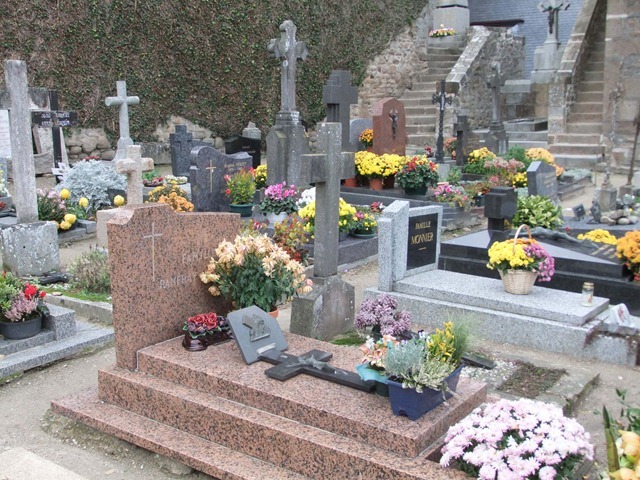 More security here at a cemetery of all places, than we have encountered at any airport or border on our travels. Anyway, on through the building which is a museum of sorts complete with sight and sound show through to the cemetery itself. Quiet and solemn is how best to describe it. 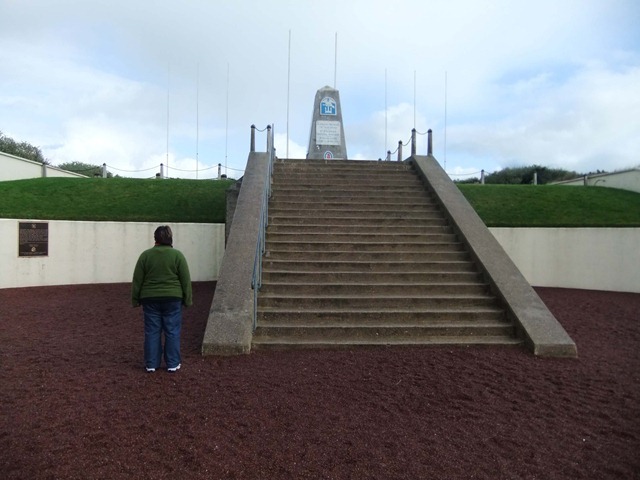 Quiet walkway and contemplative seating below the cemetery, between it and Omaha beach at the base. As we were leaving the cemetery, it seemed fitting that out of the dark, rain filled clouds, burst an air force jet completing a flyover. The noise sent shivers down your spine, one could only imagine what it would have been like on D Day 66 years ago. 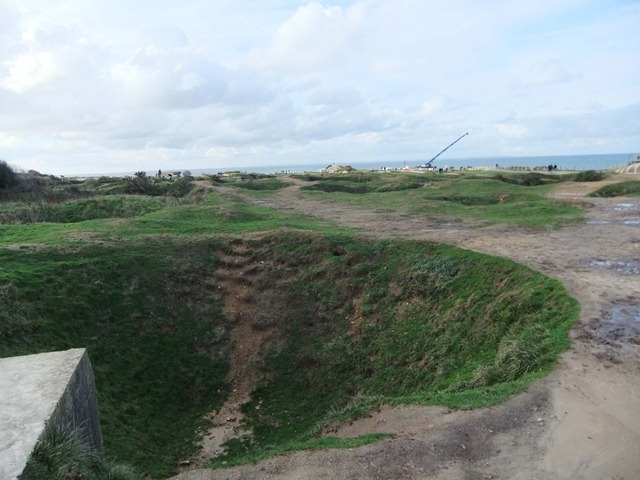 From there it was back to Arromanches as we wanted to go to a 360 degree cinema which shows a film dedicated to the D Day landings and subsequent fighting but is interspersed with scenes from today. It was extremely well done and very different from anything else we had seen. 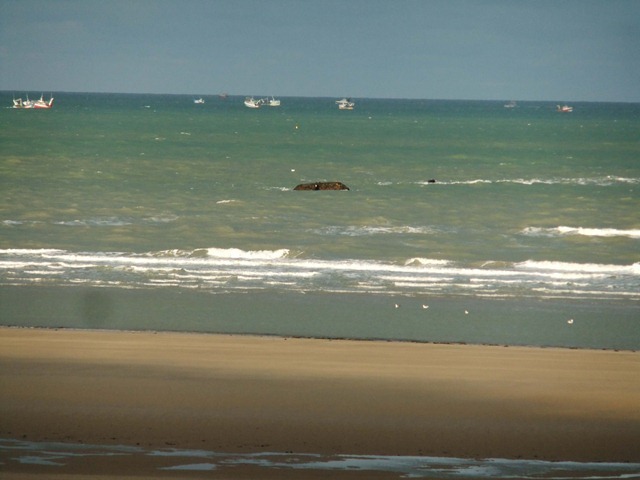 From there we had great views over the beach and what remains of the Mulberry harbour. 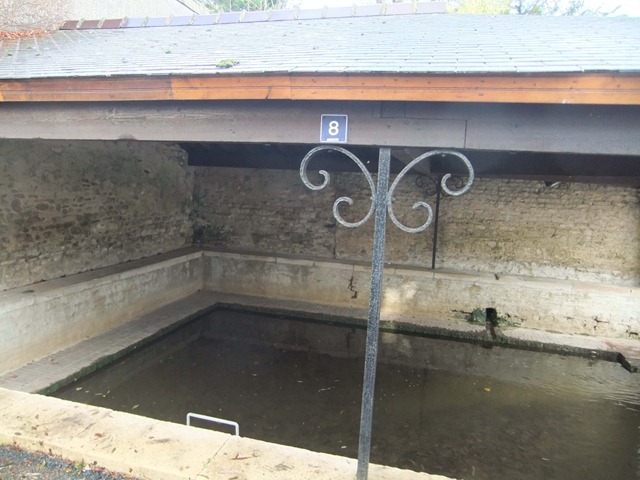 On the road between the American Cemetery and Arromanches we spotted a number of these bath/pond like structures beside the road. They were at random intervals and are an going puzzle, anyone that knows what they are please let us know. From there it was on to Bernaville and Granville which is where the Pegasus Museum is located. 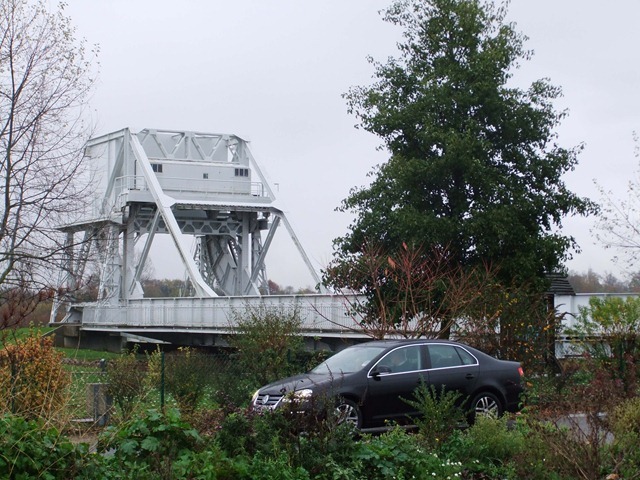 We arrived at the current Pegasus bridge and had to wait in the long line of traffic whilst the bridge was lowered. 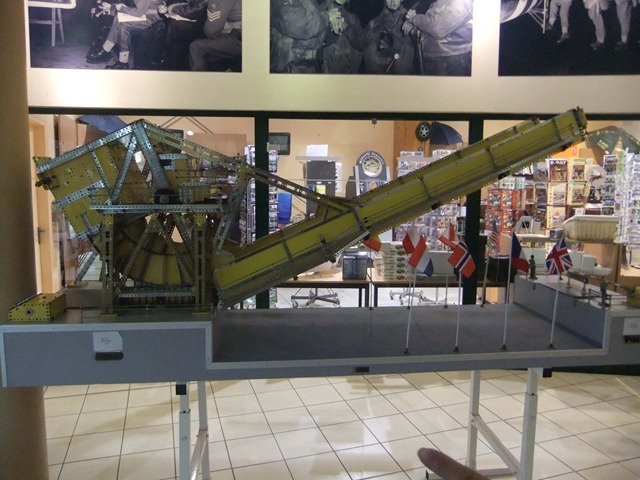 Pegasus Bridge was one of the strategic points that was to be captured by British Paratroopers and troops landed in Horsa gliders. 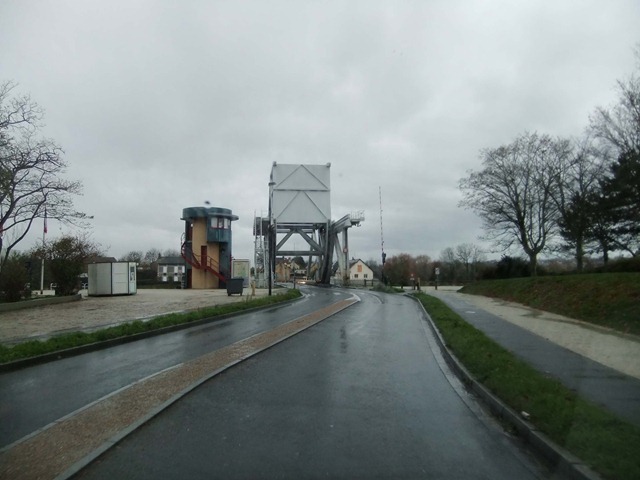 They were to destroy crossings of the Orne river but capture and preserve the crossing now known as Pegasus Bridge. The exhibition was on of the best seen with a lot of models, a short film including some of the participants, and much supporting material. 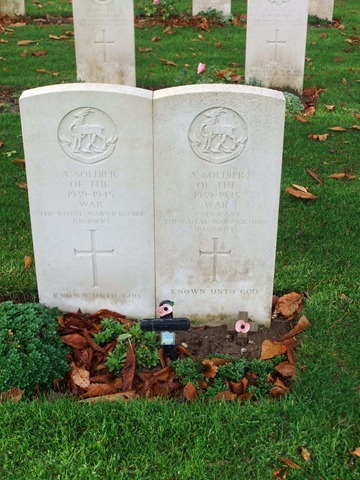 The movie, which showed the planning, execution and aftermath of the capture of the bridge, was very well done, but extremely moving especially towards the end of the movie there was a shot of old soldiers at the British cemetery and showed a memorial cross of one of their fellow Paratroopers who was only 16 years old! It brought it home. One interesting aside was that the film The Longest Day featured the capture of the bridge and that two of the major participants in the action in 1944 played themselves in the film as well as giving direction as to accuracy of events. 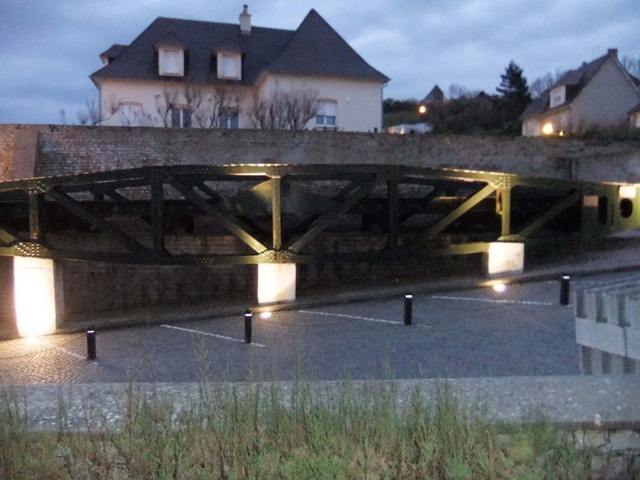 The original bridge is now mounted outside the museum. Detail of the rotating end that lifts the bridge. 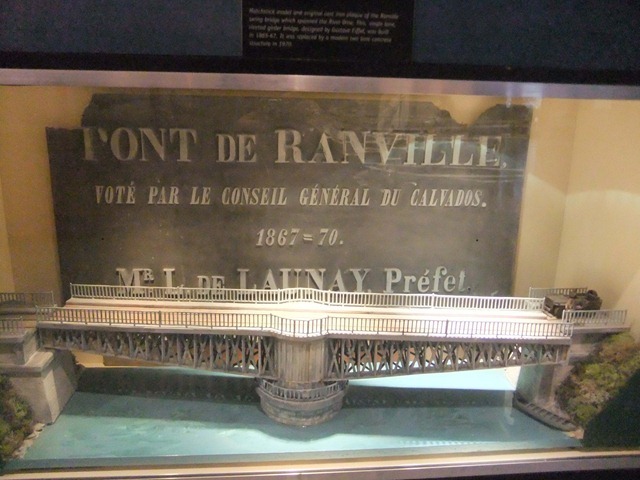 Model of the Ranville bridge which was one of those to be destroyed. Finally we drove away from the museum over the new bridge. 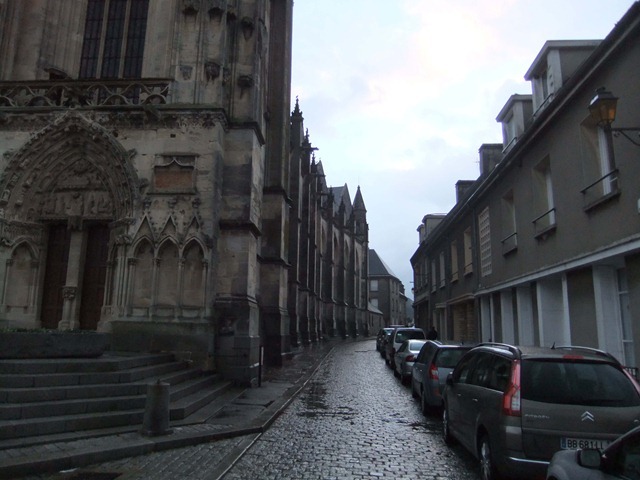 After that visit we set Heidi to take us to Bayeux. Although this was again heading back in the direction we had come from. 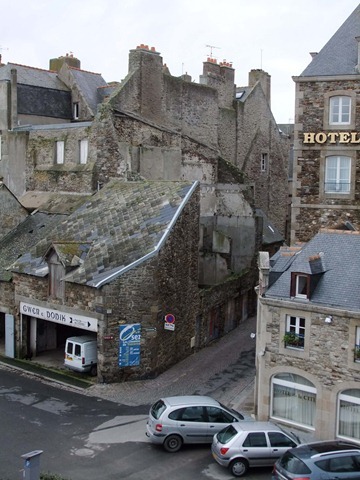 We were quickly into Bayeux, and found a bus parking spot just a short walk to the museum which houses the Tapestry. 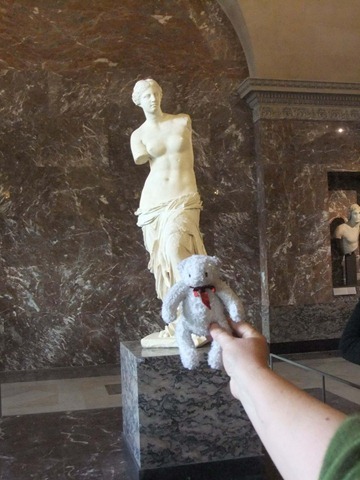 It was off to see the tapestry. We were given an audio guides to help explain the story and pictures of this 70metres long, 11th Century comic strip. 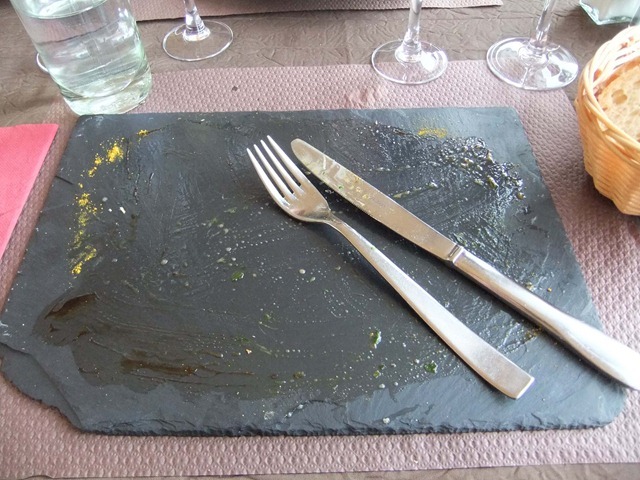 It was really very, very, good and very well done. 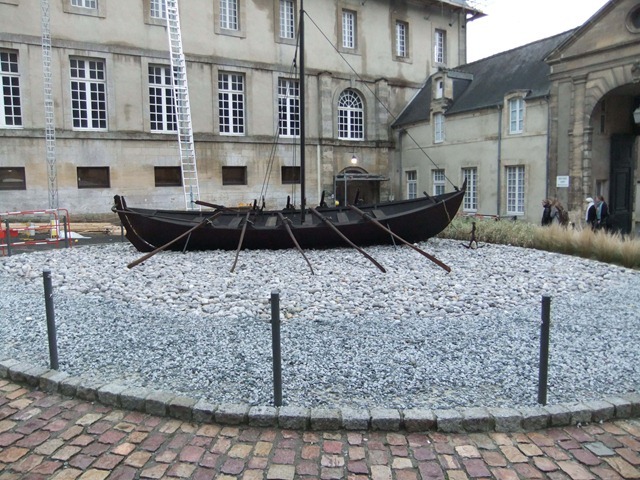 Norman boat outside the Bayeux Tapestry museum. And yes it does look like a Viking ship and this is no coincidence. 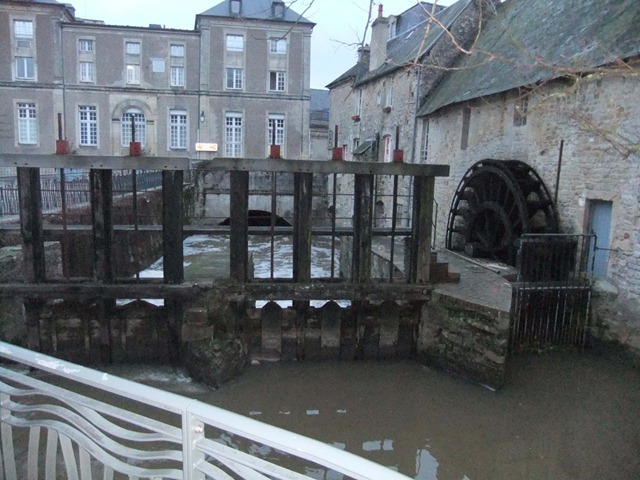 Working waterwheel seen in the middle of Bayeux close to the Tapestry site. From there it was off to see if we could find the parking spot for the night, which was not too difficult. Another parking area right in the centre of town, just along from the Cathedral. We had just parked along from a couple of other vans, when a van turned up behind us. It was a couple from the UK. We said hello and soon got chatting. Then it was time for a bite to eat, so we invited Lyn and Neil to join us after dinner for a drink and a chat. They duly joined us, bringing with them some yummy dessert offerings for Bernice’s birthday. It was great chatting with them, and it turns out that they have also done something similar to us, as in selling everything or packing it away and living in their campervan. 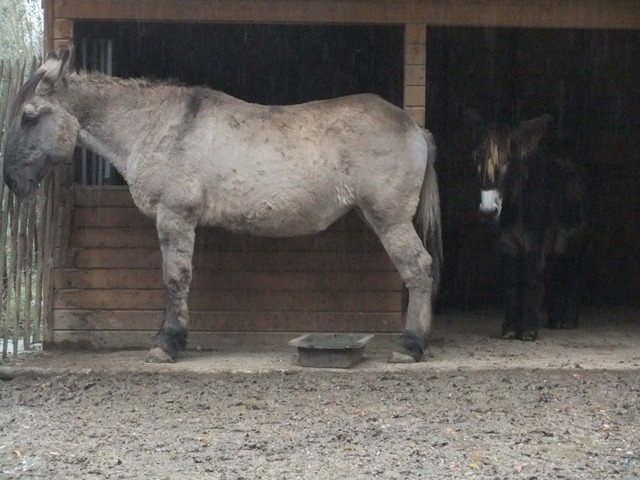 They have been living in theirs for over a year now in the UK and are now travelling through France and on to Spain and Portugal. We hope that they get the opportunity to visit NZ sometime soon as we will keep in touch. 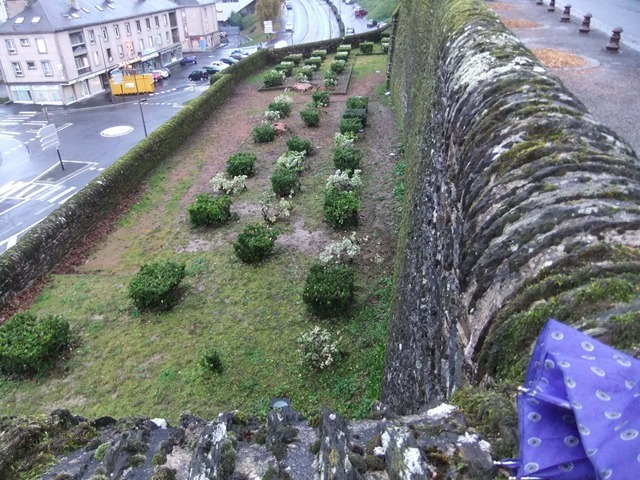 Roy went off this morning to explore the ramparts of Saint-Lo, while Bernice had a bit of a lie in (she wanted to finish her book). Looking across to where we spent the night, alongside the river on the right hand side behind the trees. 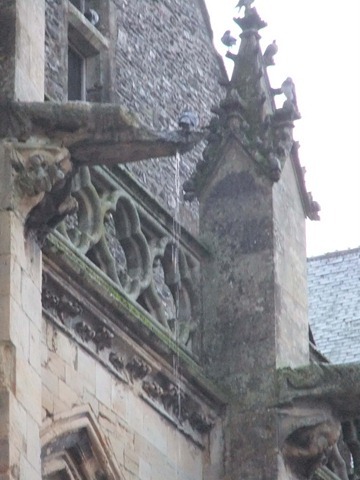 Finally a gargoyle at work!!!! 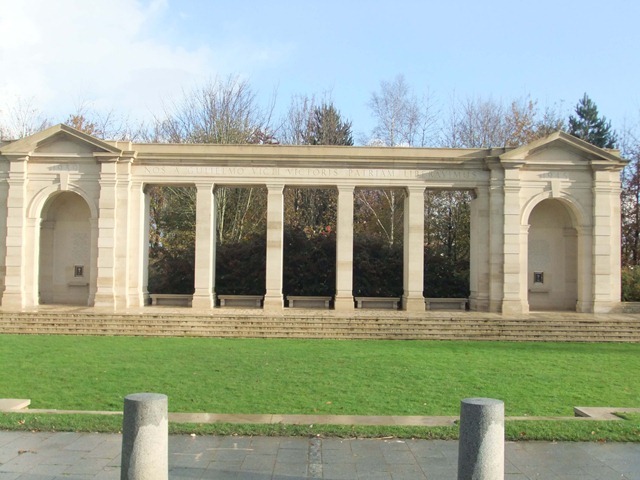 Memorial to French Maquis and civilians killed or deported by the Nazis. 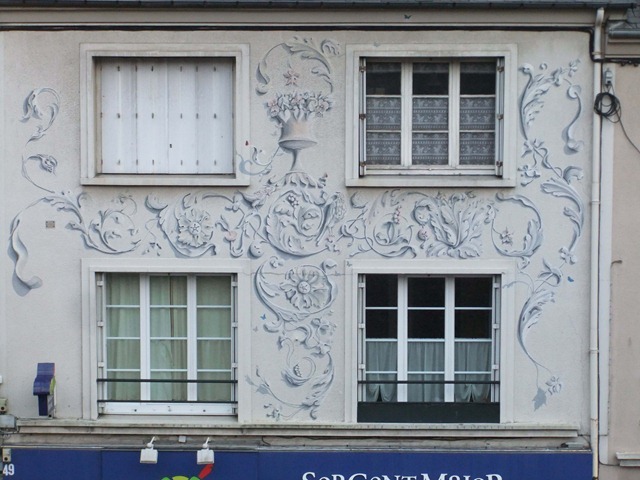 Painted decoration of a building. 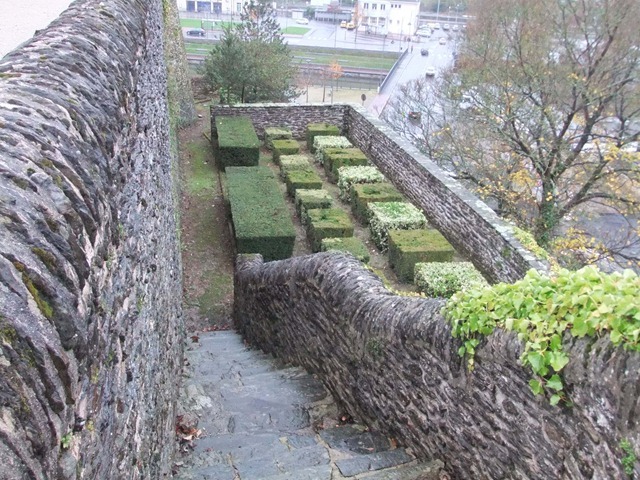 and this is almost chessboard like in it’s pattern. 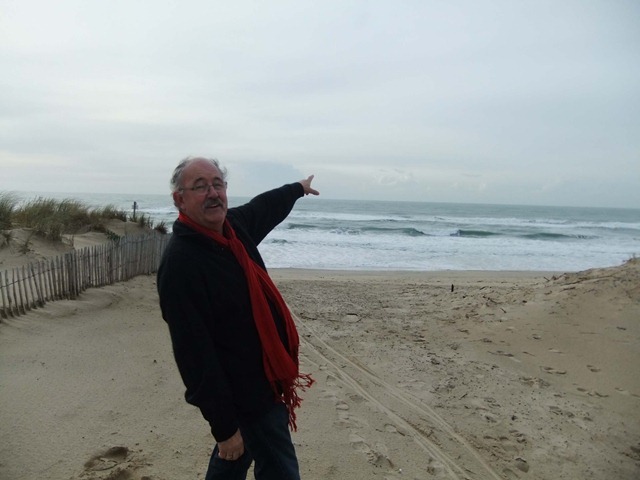 Then we were off to the Normandy Beaches. 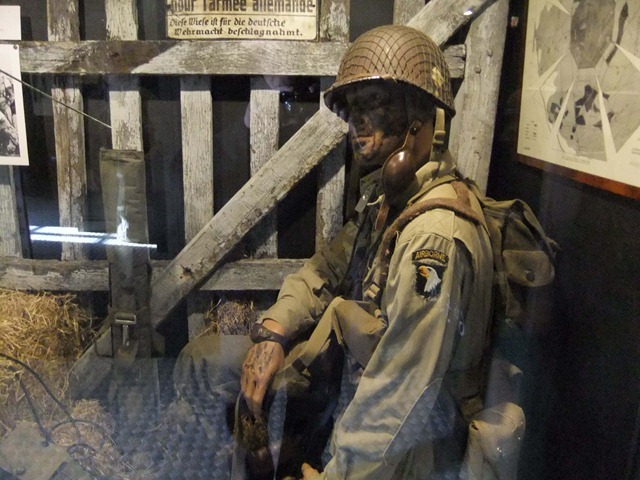 First stop was to be Saint Marie-du-Mont and the museum before heading out to Utah Beach. 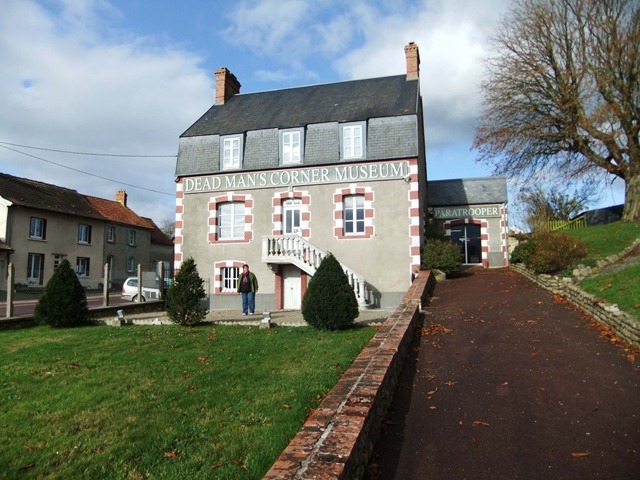 As usual along the way we were side tracked when we spotted the Museum at Dead Man’s Corner. 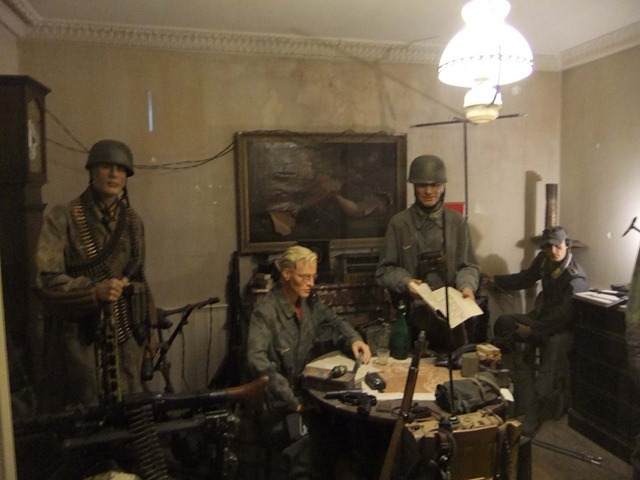 This house was a strategic Command Post for the German Paratroopers, then was taken by the 101st American Paratroop Regiment and used as their headquarters during the attack on Caretan. 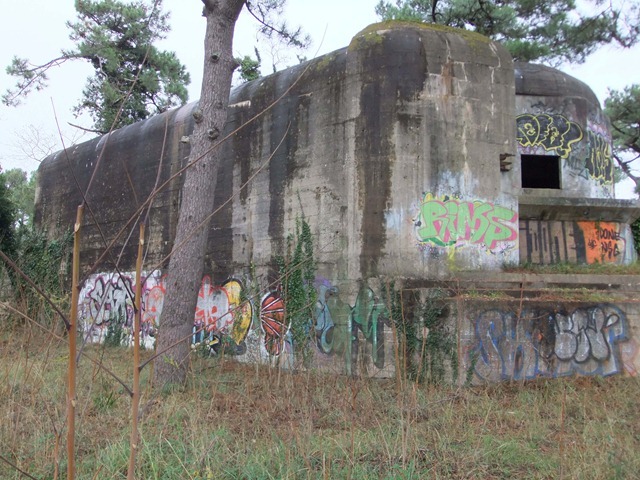 It was named by the fact that there was an American tank destroyed at the cross roads where the house was situated and the tank commander was still in the tank turret for some days. 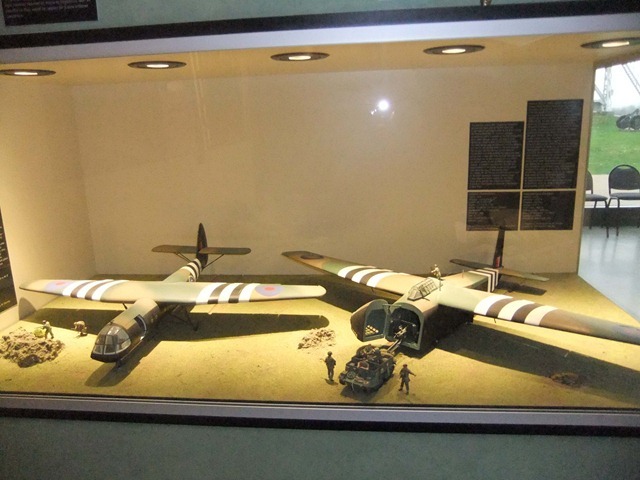 The museum is dedicated to the 101st Paratroop Regiment and their German Paratroop and SS opposition. 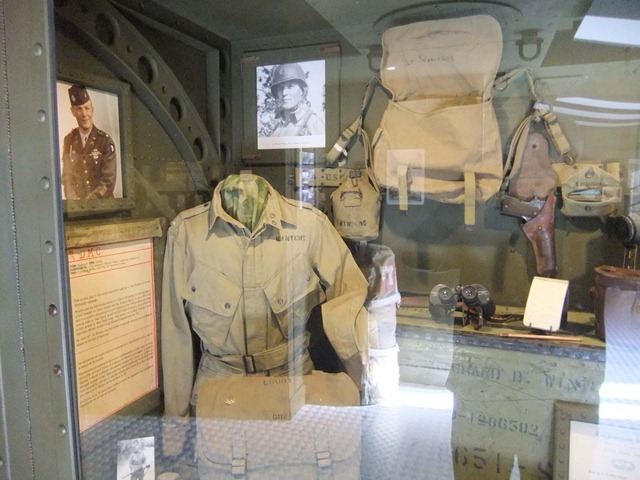 It was a very very good museum, with amazing original pieces such as maps, uniforms, equipment, dog tags etc. A very moving and well set out museum within the original house. For those of you familiar with Band of Brothers this is one of Richard Winters original uniform shirts. They also have notebooks and other items from other members of the Band of Brothers group. 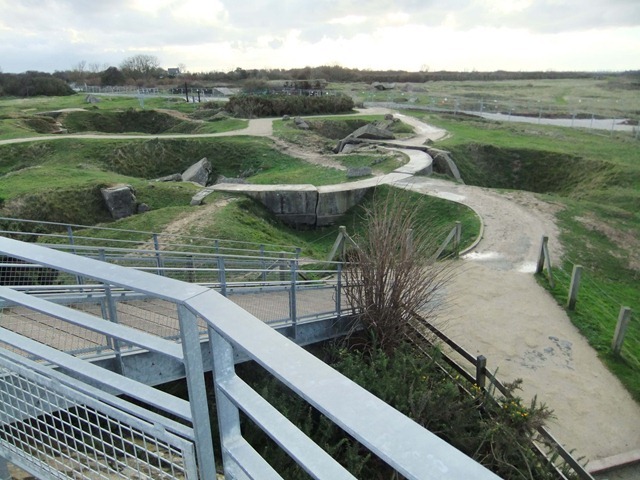 From there it was on to Utah Beach, unfortunately the museum at Saint Marie was closed for the season so it was onto the beach. 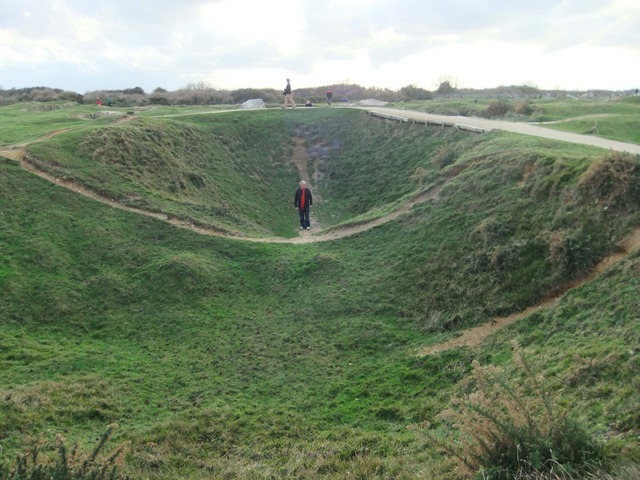 Then on to Omaha Beach, however along the way we got side tracked, again, stopping at La Pointe du Hoc. 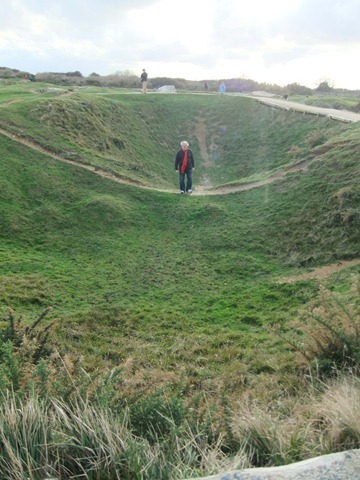 This was the location of the landing of the 2nd Ranger Group who scaled the cliffs and destroyed the gun emplacements at the top which were able to enfilade both Utah and Omaha beaches. We paused for lunch, it being 2:30 before approaching the site. After another simple but delicious lunch we headed off for a walk to find out all about this beach area. The area was very heavily shelled by the navy before the Rangers landed. Not withstanding the bombardment the Germans were able to effect a very intense defence as the landing were delayed by twenty minutes after the end of the barrage. 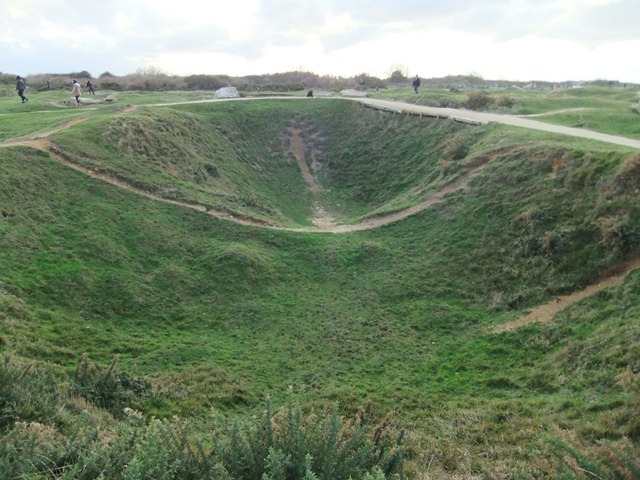 There were an extreme number of crater holes from the shelling and it was hard to perceive how any defence could have been mounted. 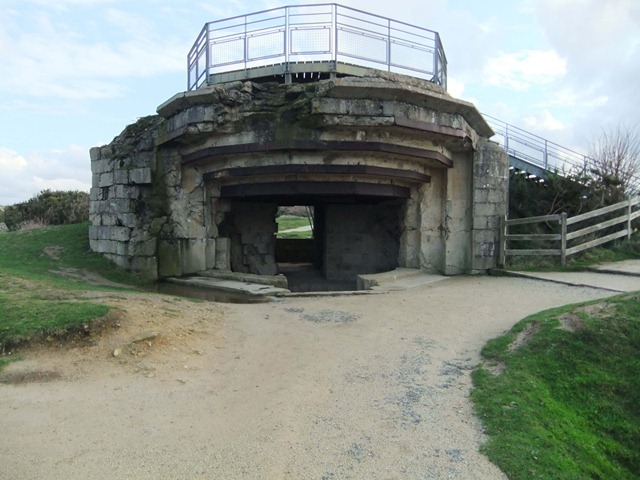 German gun emplacement still reasonably whole even after the barrage and the intense fighting that followed. 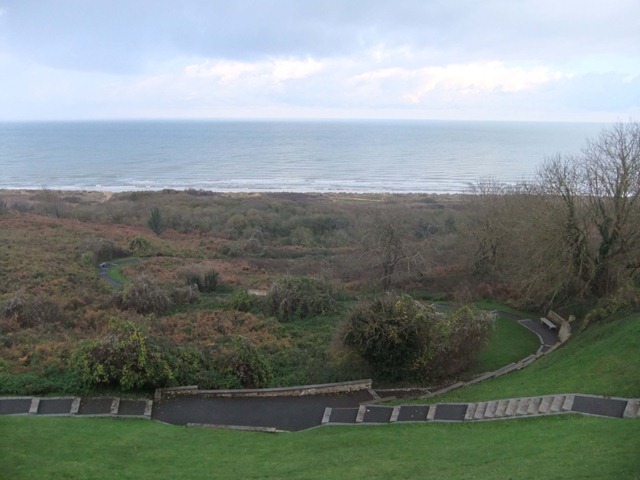 From here it was onto Omaha Beach. Again a huge flat expanse of beach, and it just so happened that as we were there, a large flotilla of local fishing boats were just offshore. 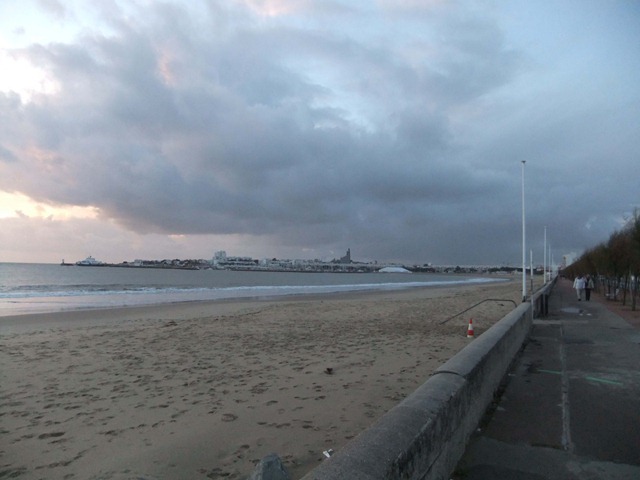 What with the dark ominous clouds overhead, one could only imagine what it would have been like on D-Day. 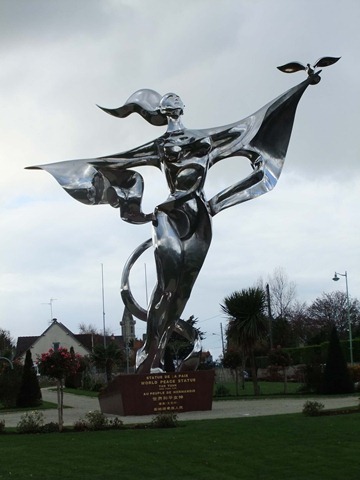 This Peace Memorial statue was erected on the approach road to Omaha Beach. 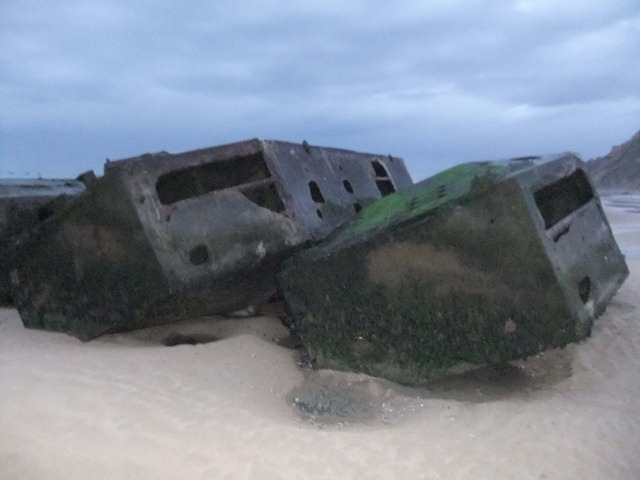 Omaha beach was the site of one of the artificial harbours created to allow Allied men and equipment to be landed following the initial assault. 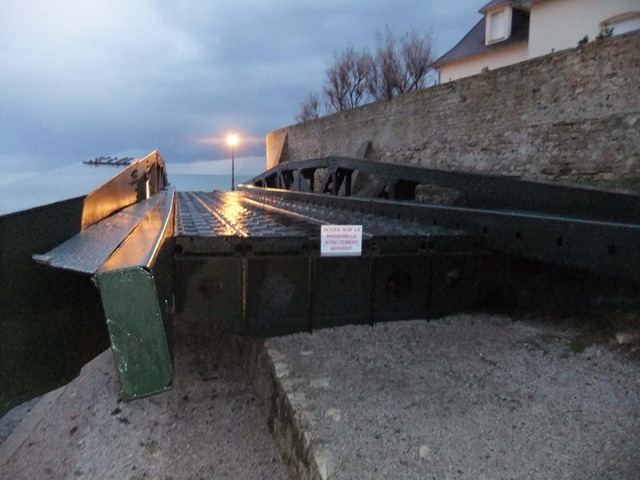 This remnant of a Mulberry harbour was mounted just before the beach. Somewhat like a Bailey bridge this section was supported on caisons and concrete laden sunken ships. 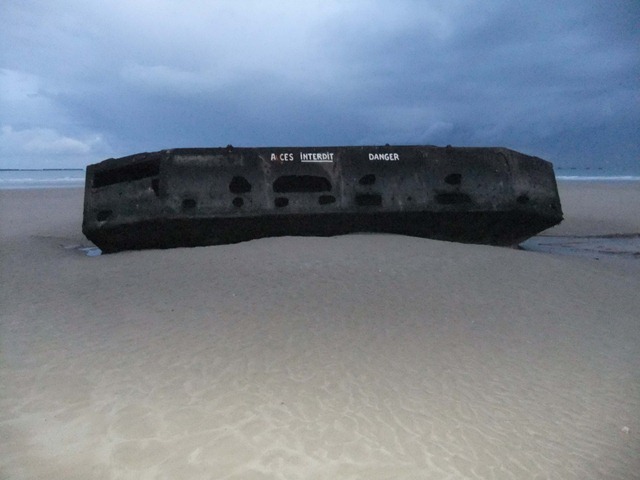 The remnants of a concrete hulk with the fishing fleet in the background. Now it was decision time as to where to head to stay for the night. 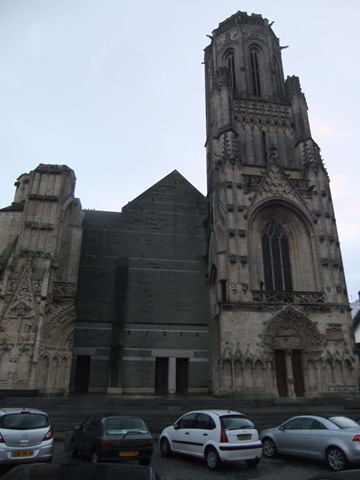 According to our trusty books, Bayeux did not have a camp ground open, and its camper parking area had no power facilities. 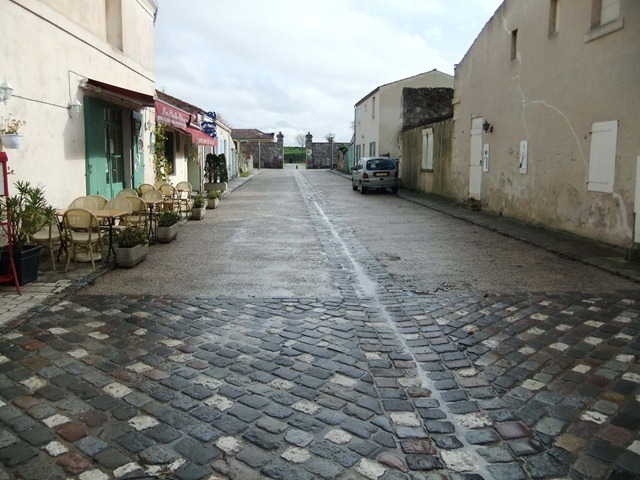 So it was a choice between Arromanches or further along to Benouville if that one did not take our fancy, as they both supposedly had power. Arromanches proved to be suitable as it had the usual parking facility and we could connect to the power for 2Euro for 60 minutes worth of power. At least one, if not two lots of power would do us for the night and give us a chance to recharge all the equipment. Today we awoke to the sound of rain and lack of diesel. After a few adventures we managed to get rid of both problems. 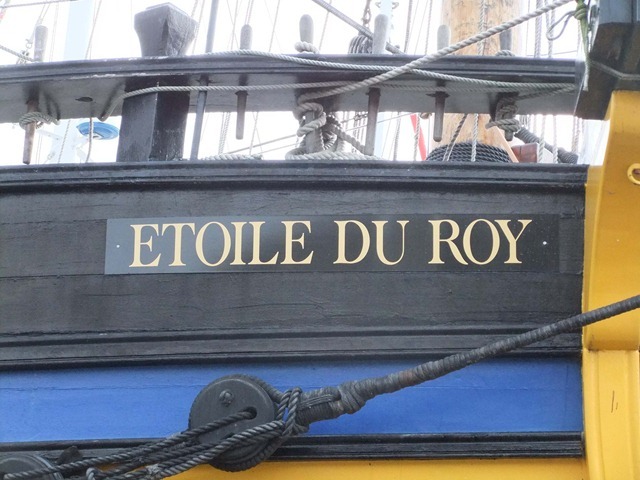 We were then underway to Saint-Malo. Arrived after Heidi had, against our wishes, directed us through narrow country lanes and back streets. However found a good campground with good facilities. Tomorrow is another day. Ha, I bet you all wished that every blog was so short and concise!! No such luck for today. 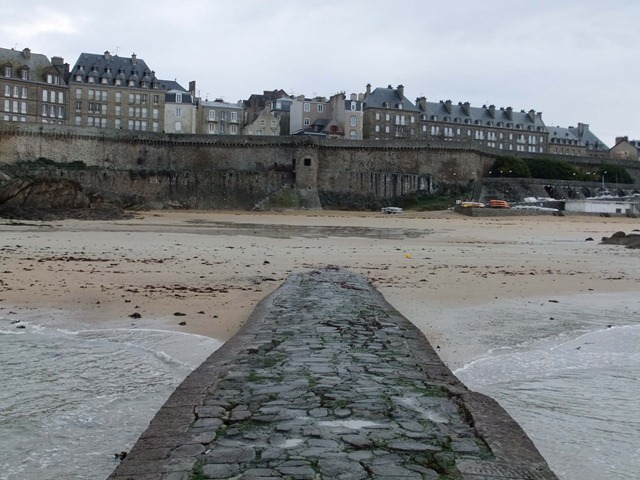 Today we went into Saint-Malo for a quick look around, but of course, it was not quick. 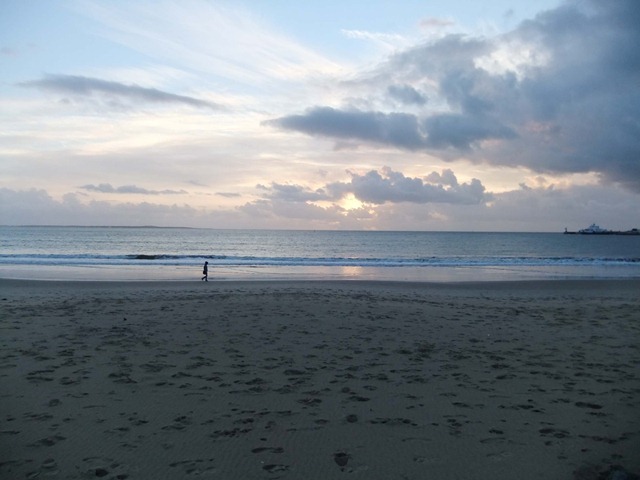 What a beautiful town, and it was just so lovely to be at a sandy beach, with hardly anyone else around and hearing the sea lapping at the shore. Bliss. 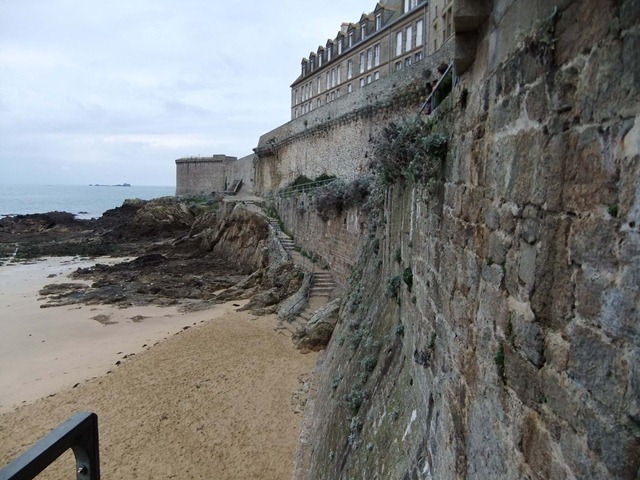 Saint-Malo was an important port particularly during the 17th and 18th centuries but it was extensively damaged during WWII with the ancient ramparts being nearly all that remained. 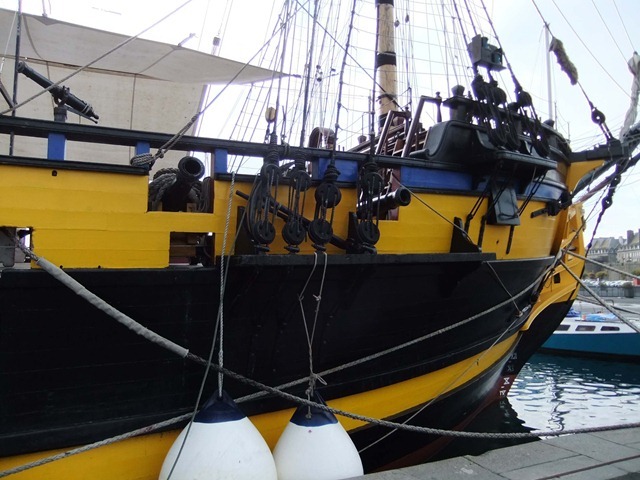 We wandered along the port and came across a few old fashioned ships that you can hire. One even advertising that you could run out a gun and fire it!! Pride of place was this much larger ship. With and appropriate name of course. 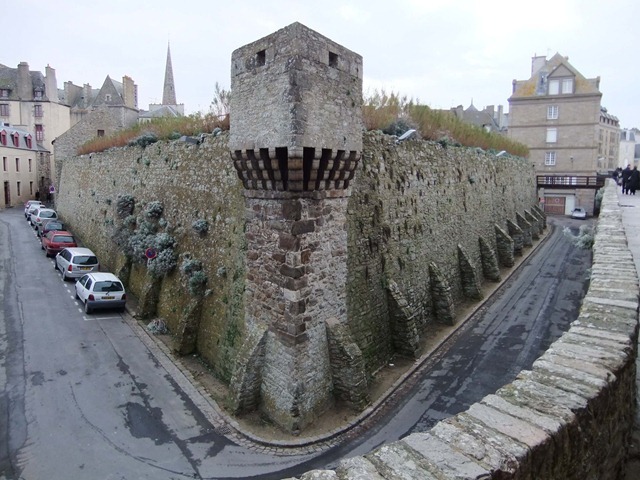 We then proceeded into the old walled part of the town. 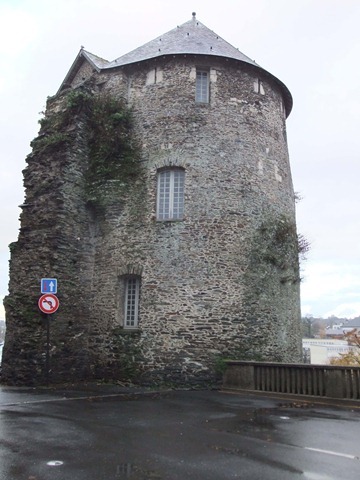 The buildings within the walls have, almost all, been rebuilt as a result of the war, but they have been kept in character with the nature of the original city. 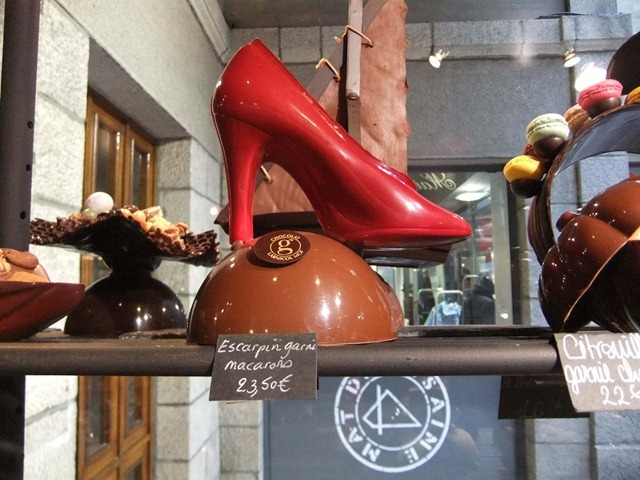 We had not been in the town long before we came across a chocolatier…..the following pictures tell that story. And yes, samples were purchased, all for the sake of research of course! 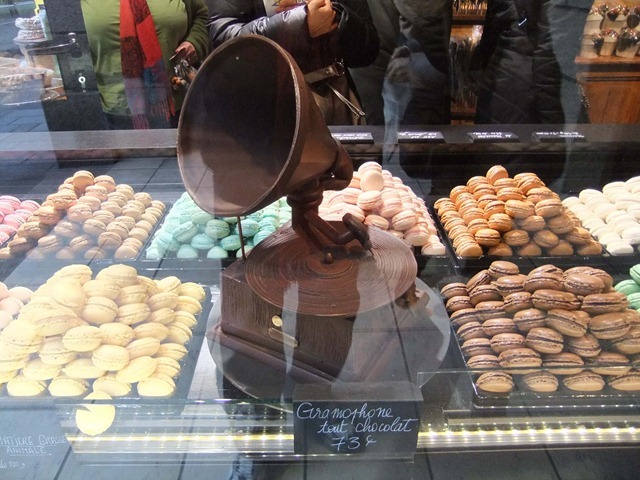 This one for Mike, a solid chocolate gramophone ..
And this one for Anita, two favourites in one, entirely chocolate.. A pair of these would only cost 47 Euros, but I doubt would last as long as other pairs. 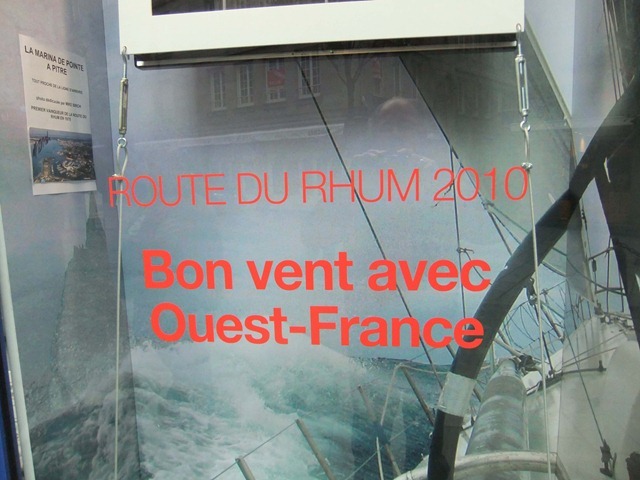 Walked a little further when we came across a place advertising the Sailing Rhum Races….Roy thought he was back in Auckland for the Friday night rum races down the Waitemata harbour! From there we walked around the old ramparts and onto the beach where there was a walkway to another fort just off shore. There were a few more forts out into the bay, all very picturesque and beautiful especially on this very calm day. Beach at the front of the wall. 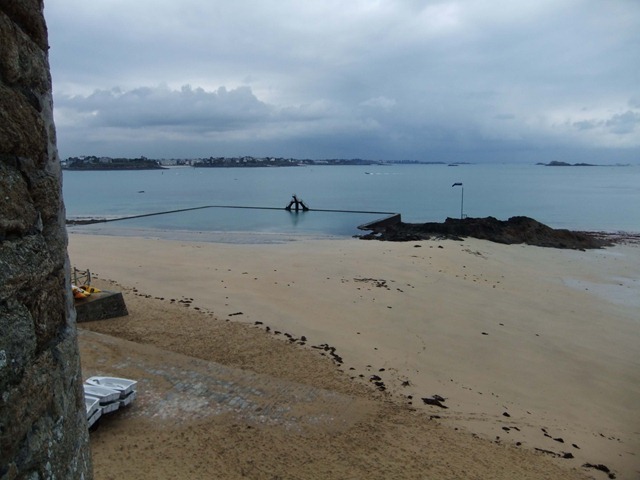 Note the swimming pool actually built in the sea. I guess they check it for live stock after each tide! 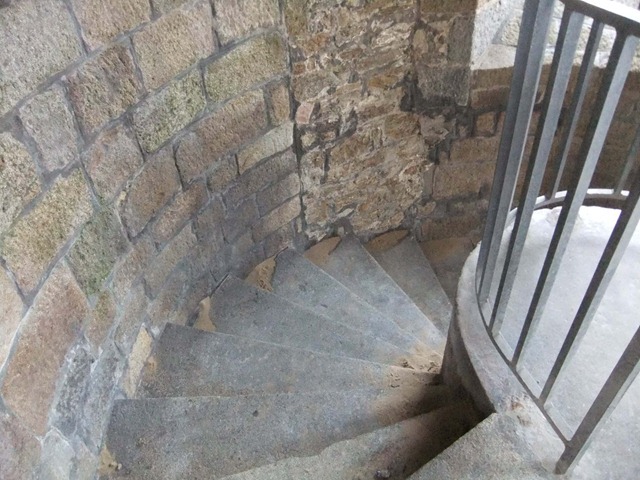 The spiral staircase that leads down to the beach.. 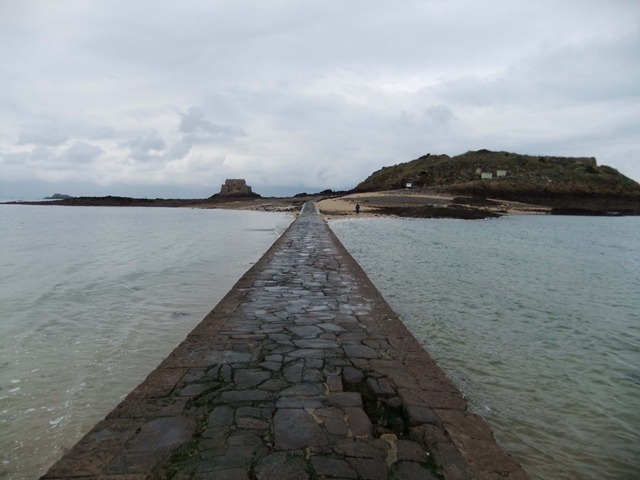 The causeway out to the fort. 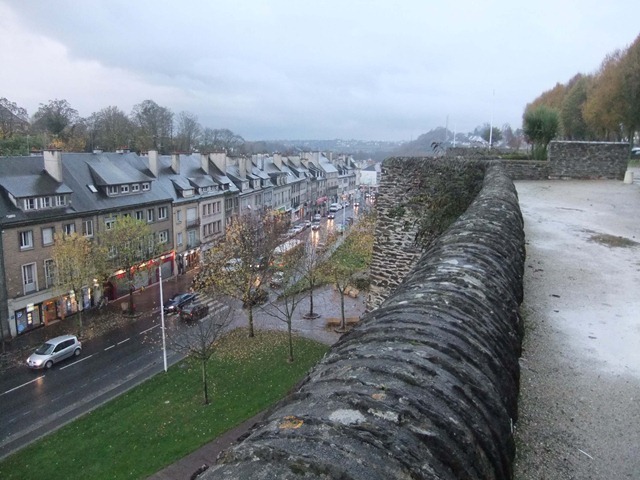 Looking back at the town from the causeway. 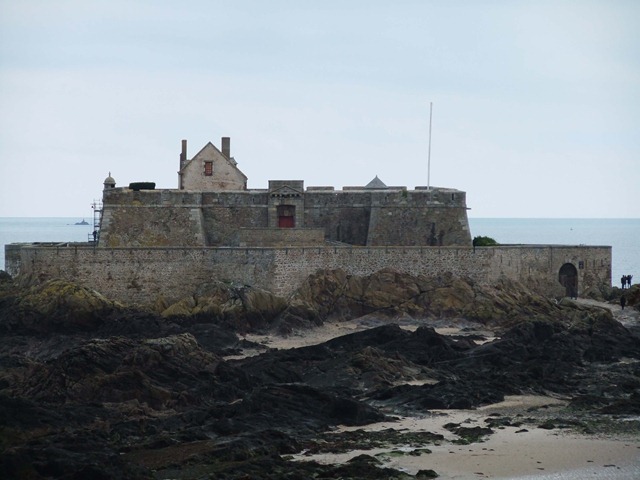 Another fort around the side of the town again reached at low tide by walking across rocks and sand. 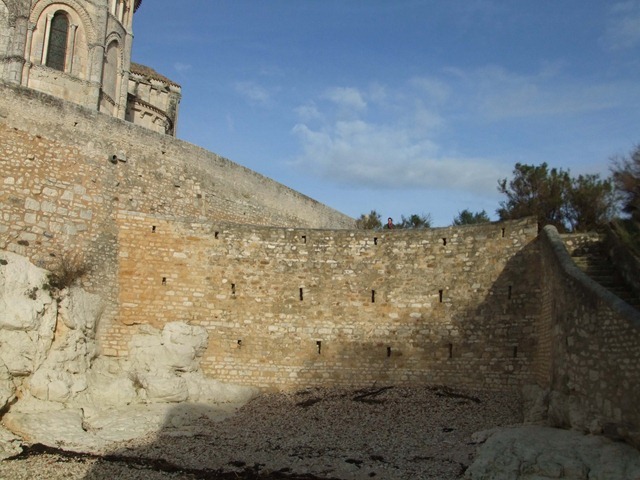 A wall within the walls. 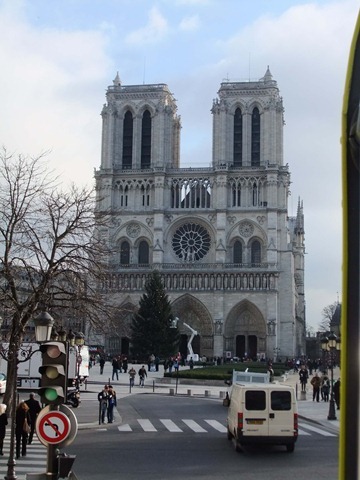 The only damage seen that could be attributed to the war. Note the roof lines on the wall in the centre. 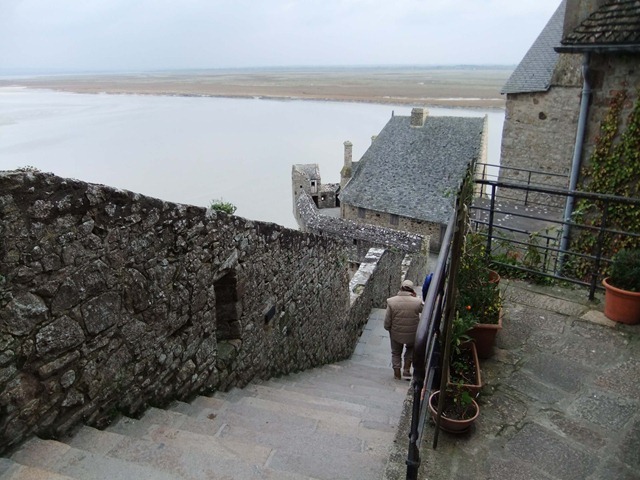 It was then back to the van to program Heidi to take us to Le Mont Saint Michel. Along our route we stopped to restock the larder, oh and guess what was found on the shelves? Vegemite! Bernice was in seventh heaven as the last jar (which was schlepped all the way from NZ) was finished a few weeks ago, ably assisted by Alex I might add. Opposite side of the road. These two appeared at a seemingly random spot on the motorway with no opportunity to stop and look!! 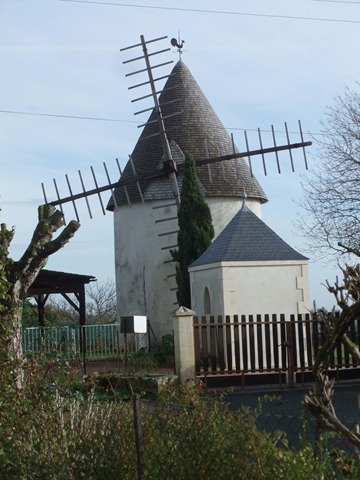 Another windmill alongside on of the secondary, or was it tertiary roads we were on. There there was a sign and an opportunity to turn off and have a guided tour of the windmill. Before long we were at the Mont. What an amazing sight. First surprise was that both of us were under the impression that one walked along a causeway to an island. 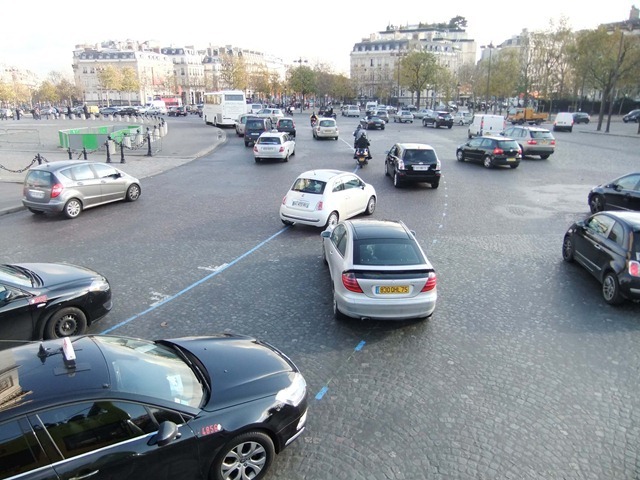 This is not the case, there is a very large causeway with a huge parking area immediately in front of the foot of the Mont. We parked in the allotted specific park for campervans and decided to have our lunch first. Again, another gourmet delight of some yummy bread, cheeses, pickles, pates…we wonder why our lunches taste so delicious? 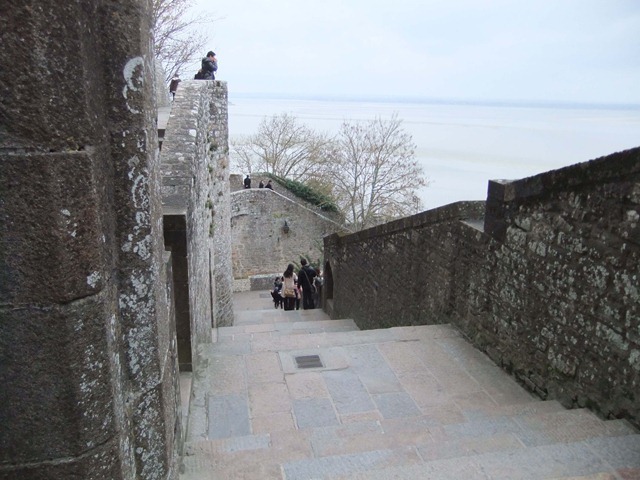 Off to Mont St Michel. 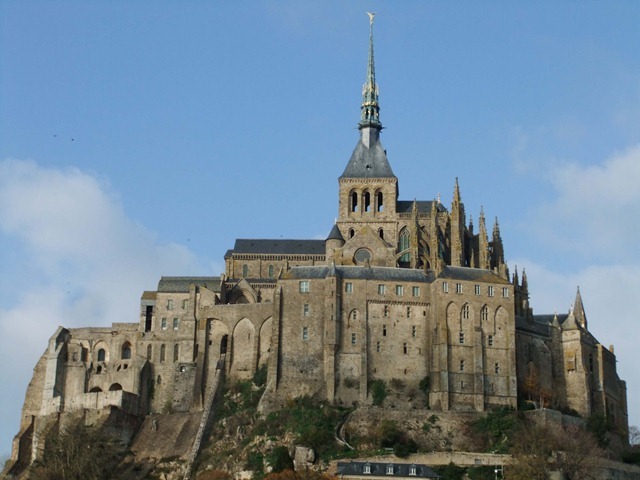 As we said before an impressive sight, it is an extraordinary feat of medieval engineering, as the abbey was built above rather than on top of the mount, resting on four giant pillars. 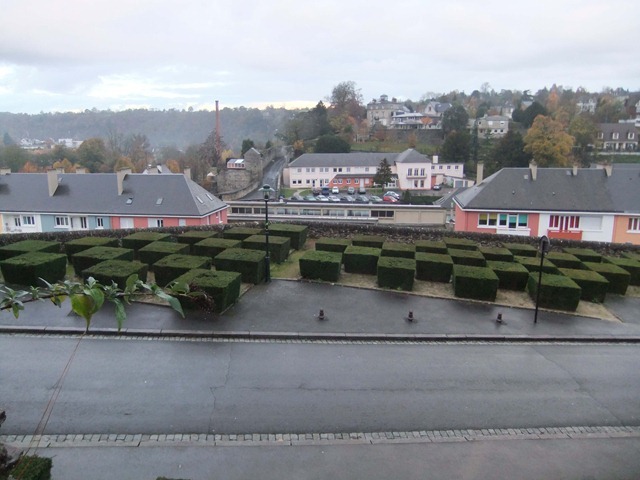 Other buildings were added around it to form an intricate labyrinth. 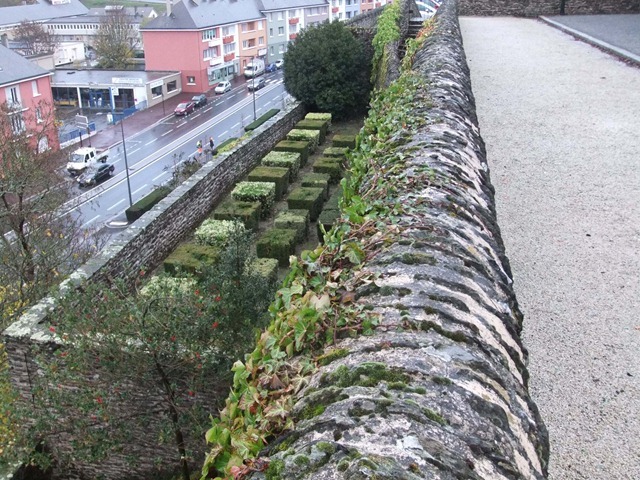 We wandered through its narrow streets and up along its ramparts and up to the abbey. Mandatory photo of the whole structure, original Abbey and the surrounding buildings. 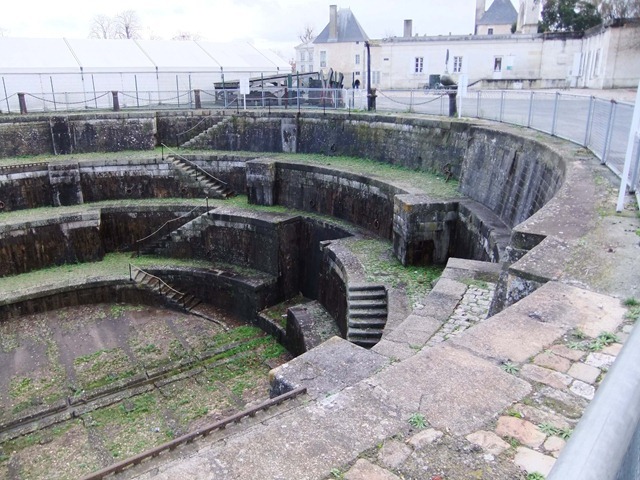 Immediately on entering the fortified walls there were two old cannons. 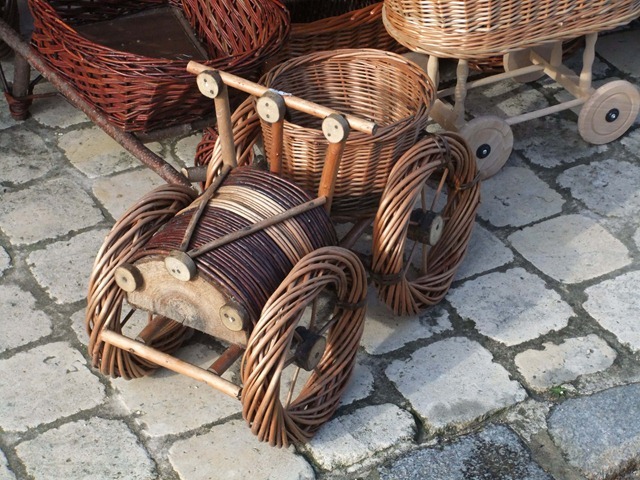 The unusual feature was that they were both constructed of hoops of iron, effectively welded together. Then read the plaque. The things are over 570 years old!!! … which went on forever. And this is a view of the Causeway. 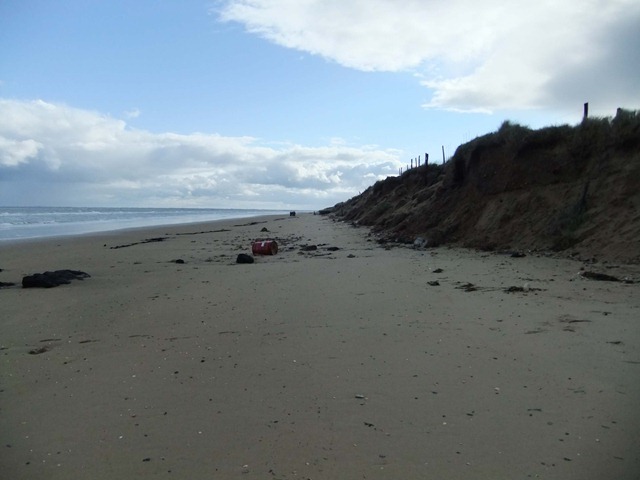 Interesting that there were signs in the carparks on the left warning that certain tides would inundate these at various times. There was a sign that said which ones would be inundated and when and advising that one moved ones car before that time!! Most helpful. To get material to the top levels there was this original sled which was pulled up to the top using a windlass. Its modern equivalent is this flying fox. 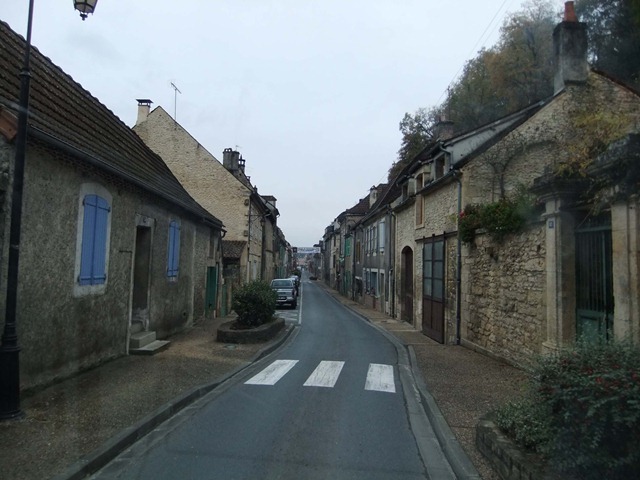 In fact there are streets in the lower part of the town but the only vehicles are narrow electric forklifts and the like. Found this cemetery in the middle of the island. Again the profusion of flowers was striking. 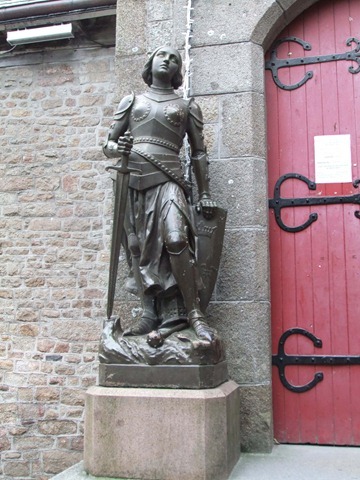 Also spotted Joan of Arc standing guard outside on of the churches. 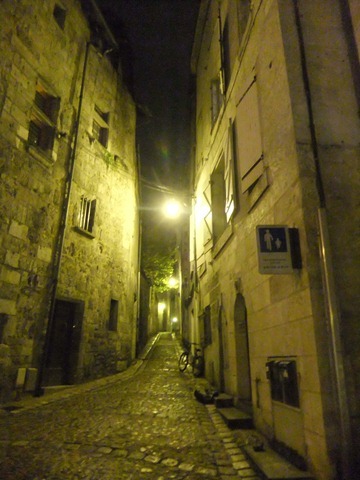 And found the narrowest road in Europe so far, and I don’t think we will find one narrower. Back to the van and program Heidi to take us to Saint Lo, along the Route de la Voie de la Liberte. Parking spot duly found, thanks, not only to Heidi but, to excellent and frequent clear signage. 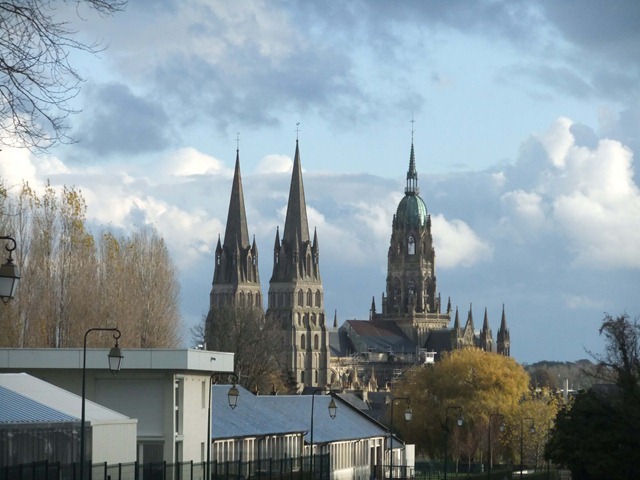 Tomorrow an explore through the town before heading off to the Normandy Beaches and/or Bayeux. With fond farewells to our new friends at the camp ground in Royan, we were on the road ready to spend the day visiting sights. First stop was Brouage. 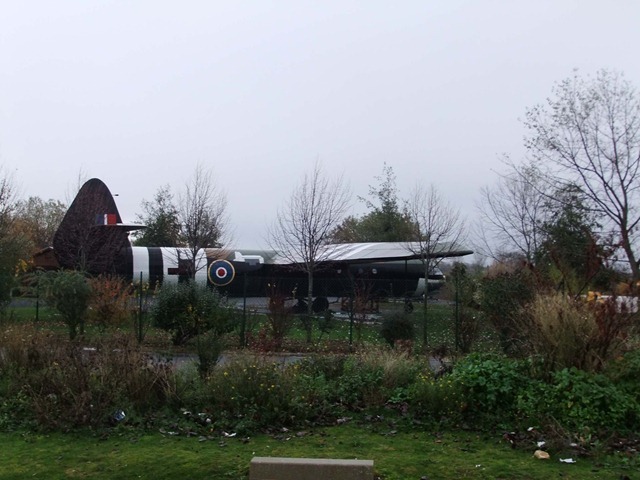 But of course we could not go there directly, on the way we had a few stops, first was to get a postcard or two for the grandchildren (we hope they are appreciating them! 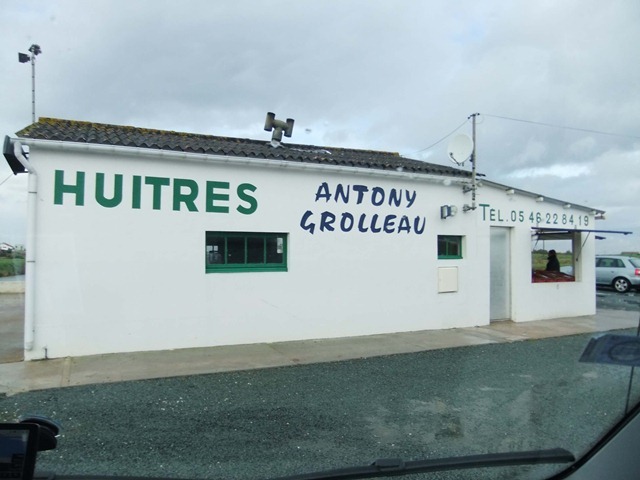 ), then to find a Boulangerie for bread, then we started to pass oyster farm after oyster farm… you don’t have to get out the crystal ball to figure out where the next stop was. 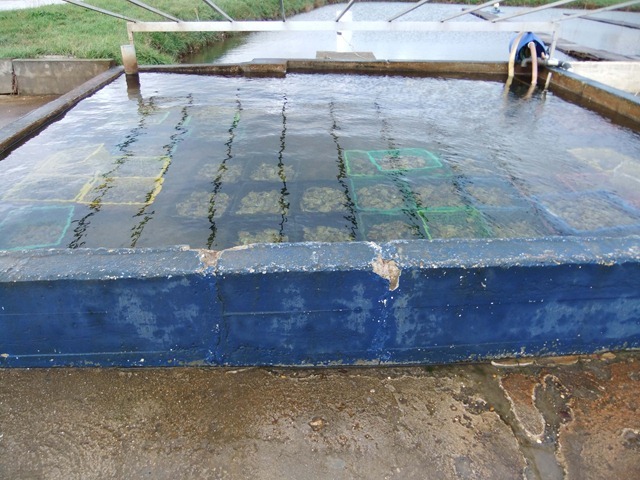 Beside the shed was this holding tank with oysters in crates. This one could hold about 96 crates in a single layer. 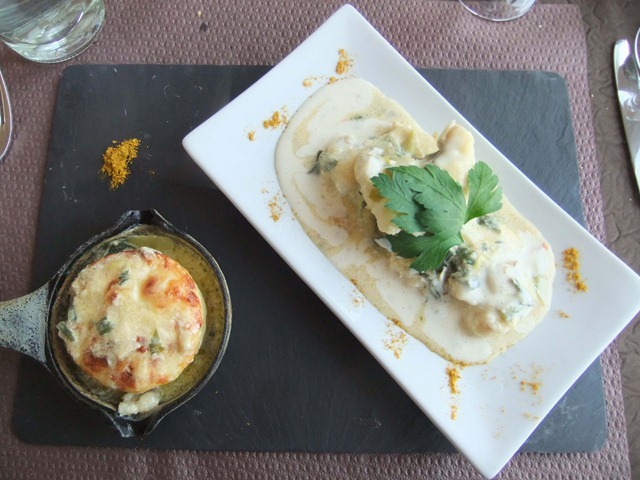 Oysters and Palourdes, a type of small clam. 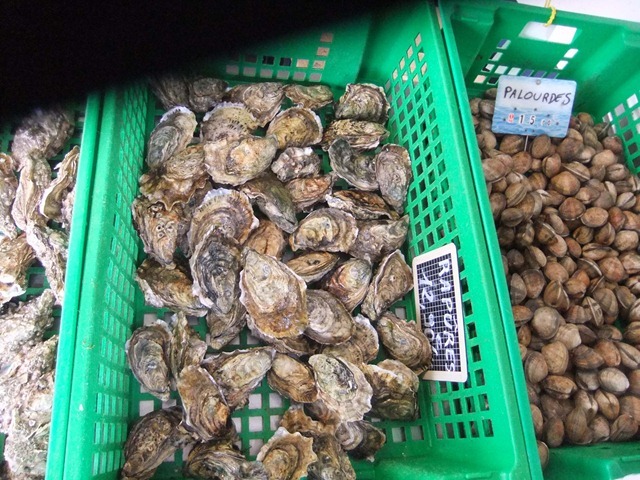 The oysters are sold by weight and graded by size and quality. Thus sufficiently loaded with fresh oysters for Roy’s dinner tonight, we were on our way to Brouage. 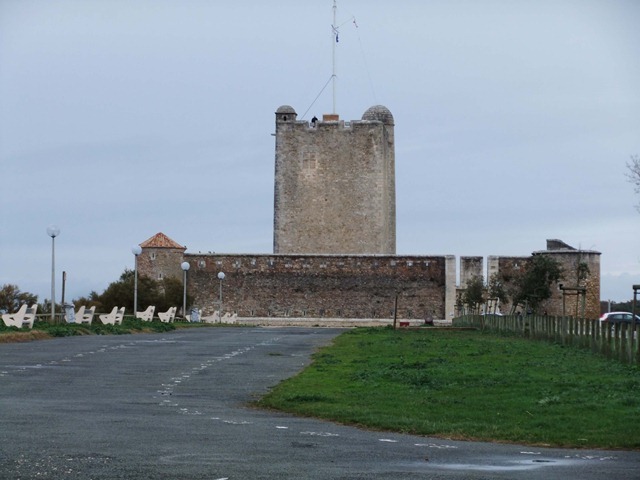 When Brouage was founded in 1555 it stood on the sea and was an important place of commerce and trade, thus it was heavily fortified. 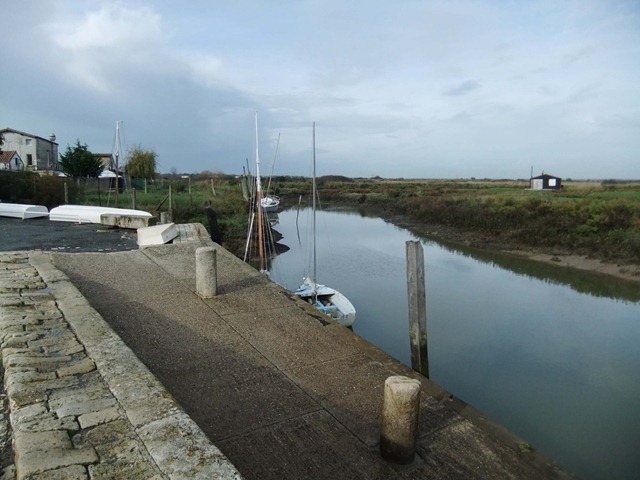 Now the sea is some miles away as a result of the marshes being reclaimed during the 18th Century. We parked outside one of the main entrances and walked in through the 10metre deep entrance. 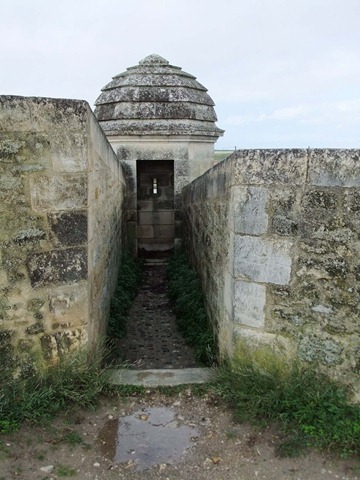 The fortress is shaped as a hexagon with a three pointed star at each of the corners. This provides cross fire defence all round. 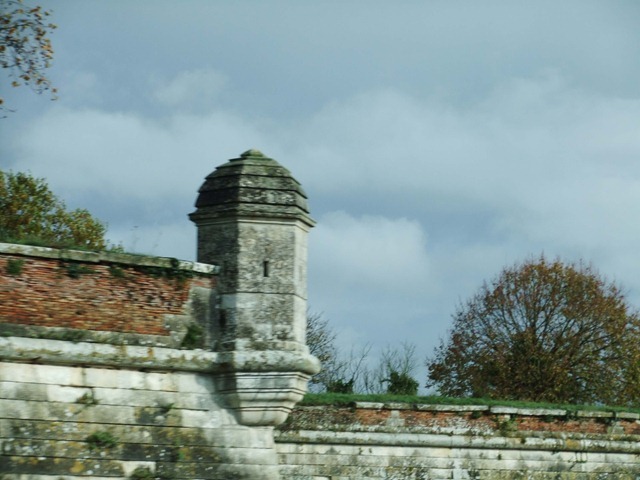 The walls are remarkably well preserved as are the small “beehive” like turrets at each of the points of the stars. 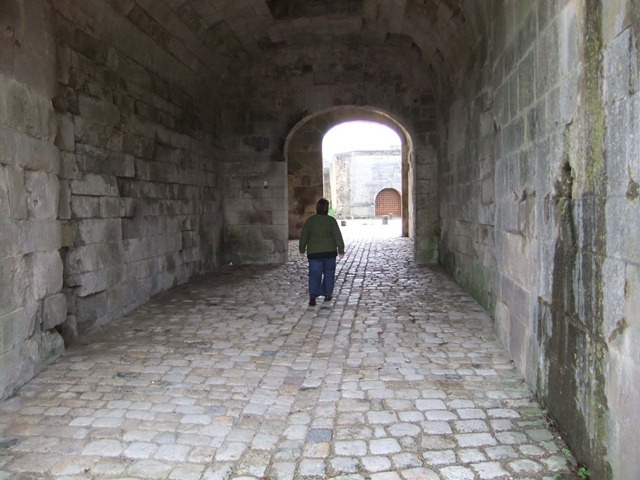 The entrance gate over 10 metres deep with three portcullis gates within it . 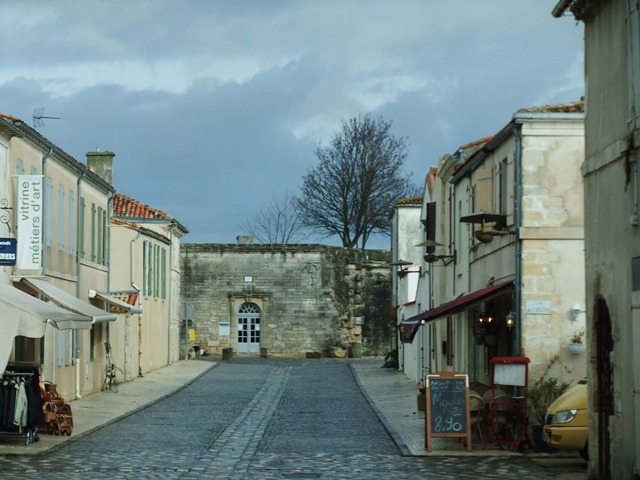 Main street within the walls, obviously quiet at lunch time, on Saturday during winter. 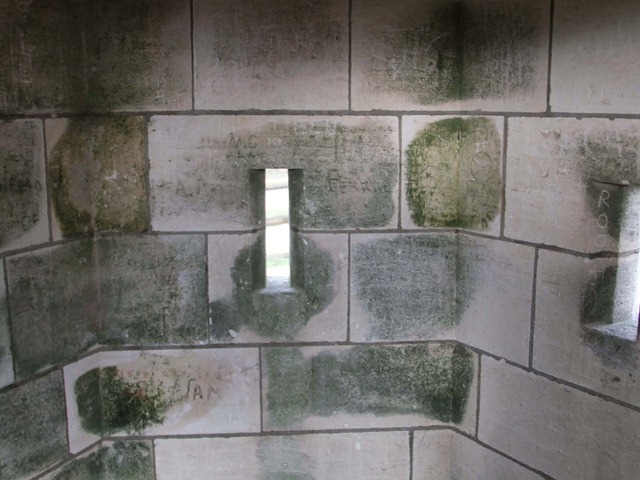 View from the firing slit in the “Beehive”. 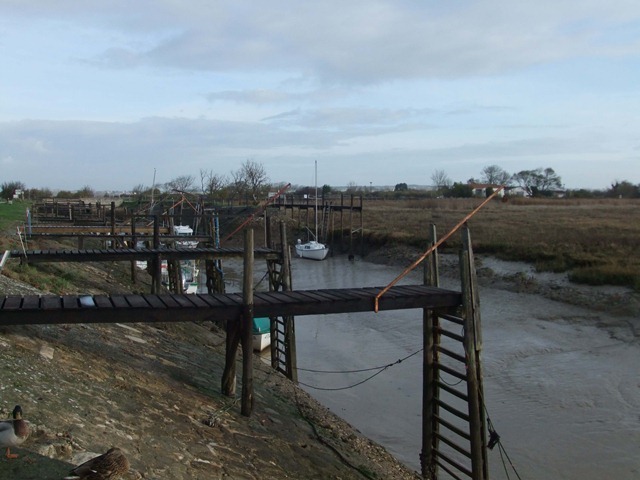 The area below is now used by oyster and mussel farmers. This was once the thriving harbour. The sea is now in the far distance. Inside, the village is just beautiful, in the summer it must be a thriving little town. We wandered through enjoying looking around, buying a postcard or two plus an oyster opening knife for Roy’s dinner tonight. It was apparent that the town claimed a Canadian connection. Finally found this monument to Champlain, a resident, who founded Quebec. Of course we realised that by now it is lunchtime (yes, shops were shutting!). So off to have some lunch. 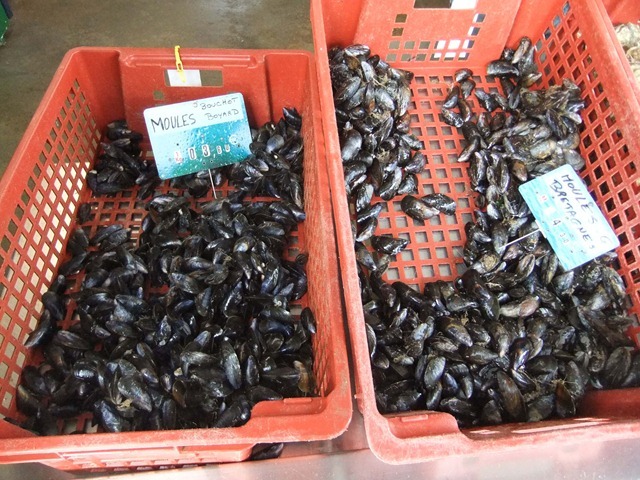 And today’s speciality was of course Moules or Mussels. 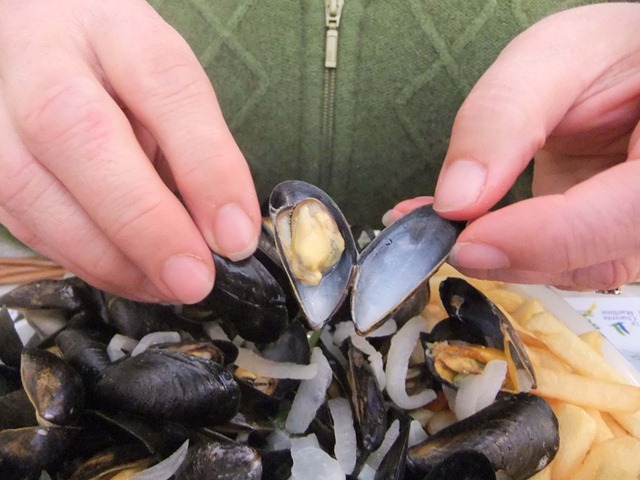 They are totally unlike NZ mussels, for one they are black, and they are tiny, not much bigger than the first two joints of Bernice’s little finger, but oh my goodness are they ever sweet and tender. 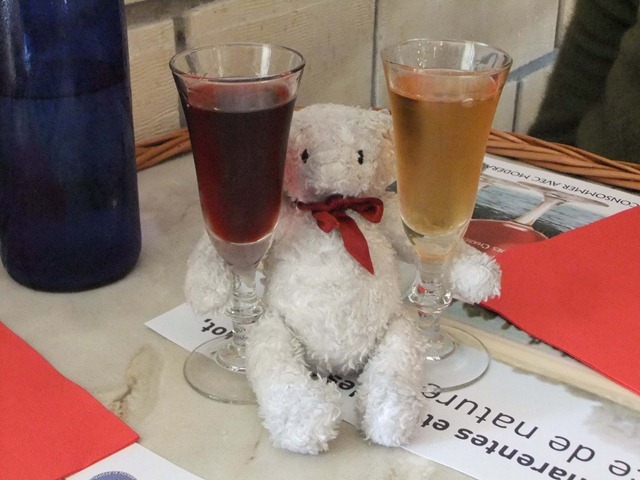 To wash down the moules, we had a glass each of the local Pineau, blanc and rouge. Delicious. 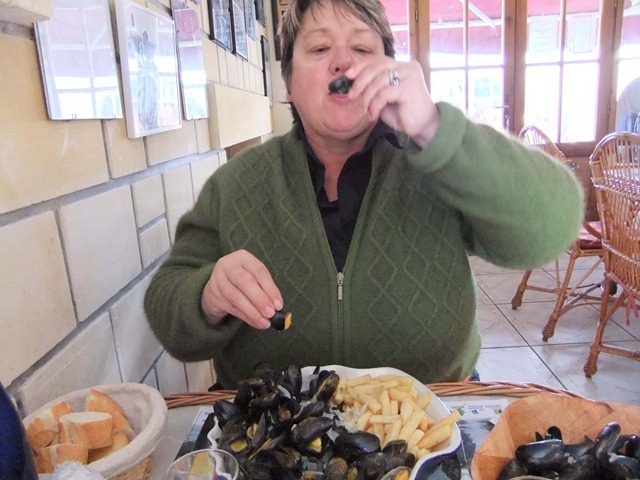 Bernice enjoying Moules and Frites. 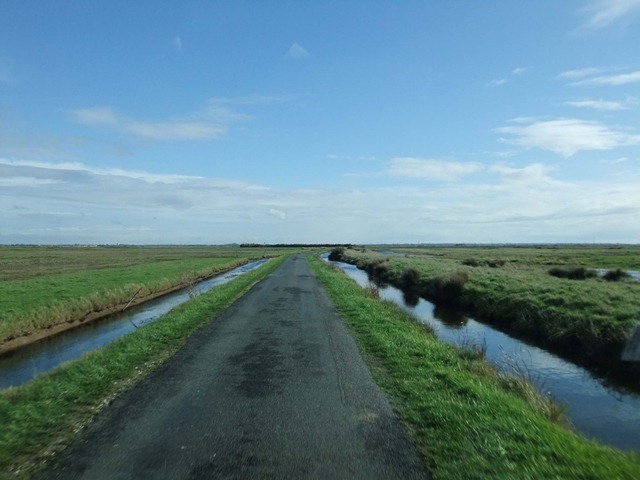 The road out of Brouage along a narrow strip between tidal drains with lots of ponds on either side. 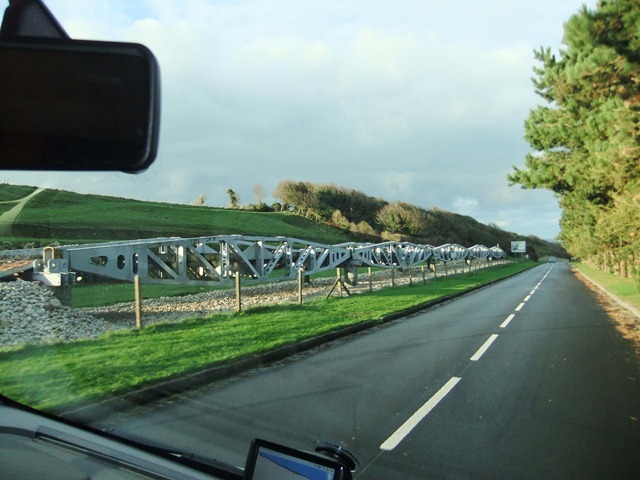 Also spotted on this road was an interesting type of gate. This was completely different and I guess is the local equivalent to a Taranaki gate. 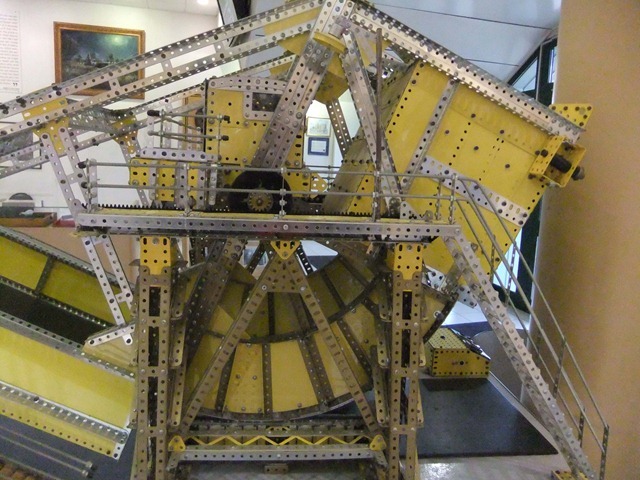 It consists of three poles, each attached at the hinge end to a to an eye bolt using a large ring screw. 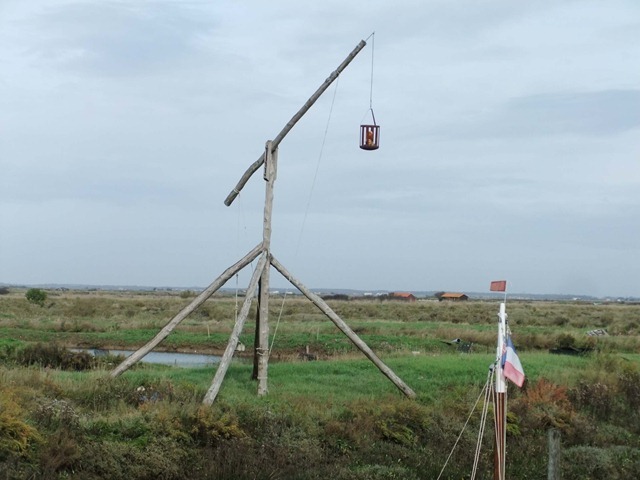 This allows lifting and swinging of the pole. 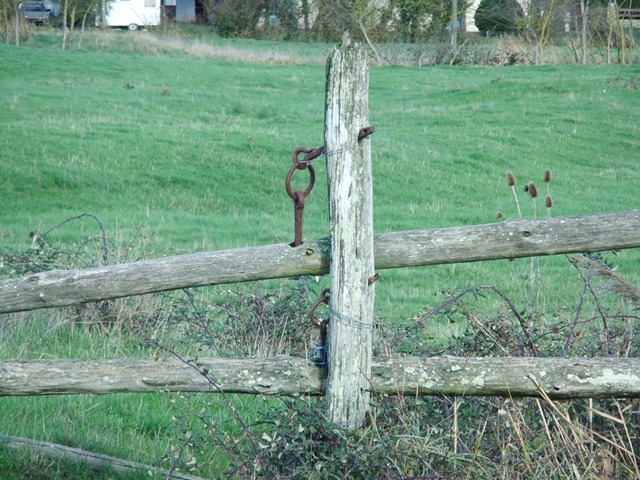 At the closing end there are three metal rests on which the poles sit when closed. Each of these rests ends with an eye through which is threaded a locking pin. Whilst looking as old as the hills they are still being used. Pole rests and locking pin. Note that this pole has no fence on the other side. 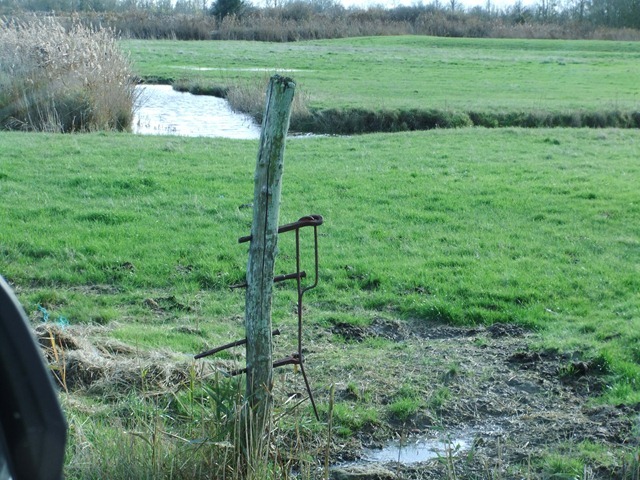 It is situated across a land bridge between two paddocks and as the paddock is bounded by deep drains there is no need for fencing just gates. 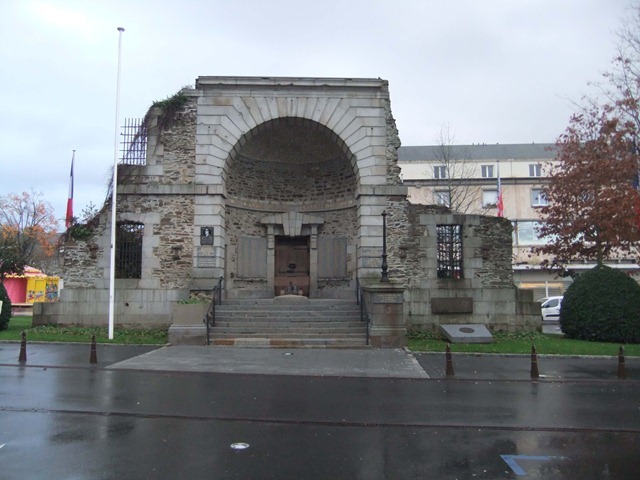 On to Rochefort to check out the maritime arsenal there constructed in 1666. 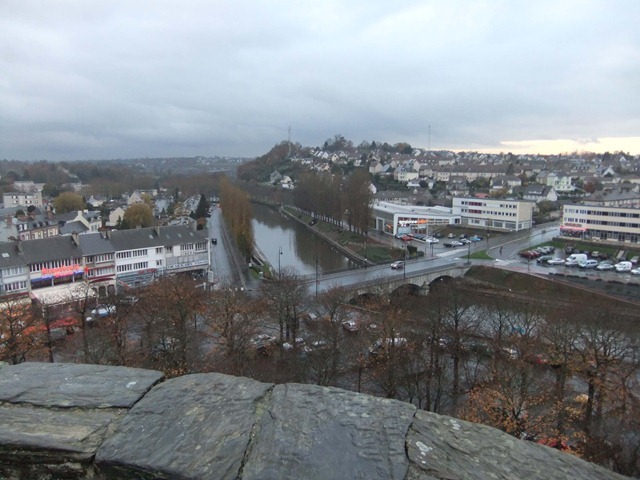 On the approach to Rochefort we came across these two bridges. The more modern one we had to cross. The second viewed from it was further along the river. 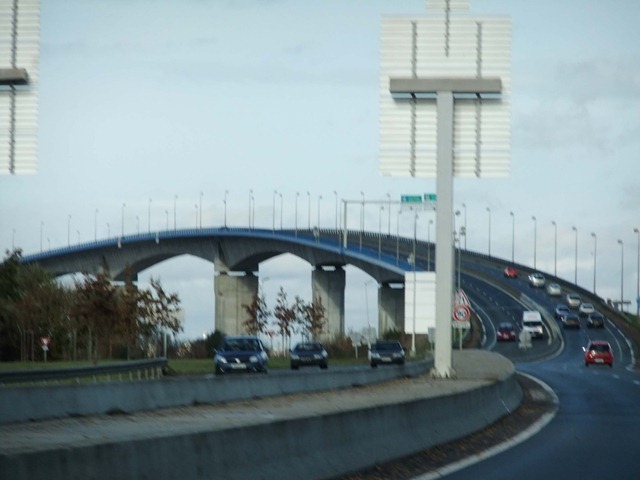 This bridge operated by having a carriage (a section of road) suspended from the upper gantry. 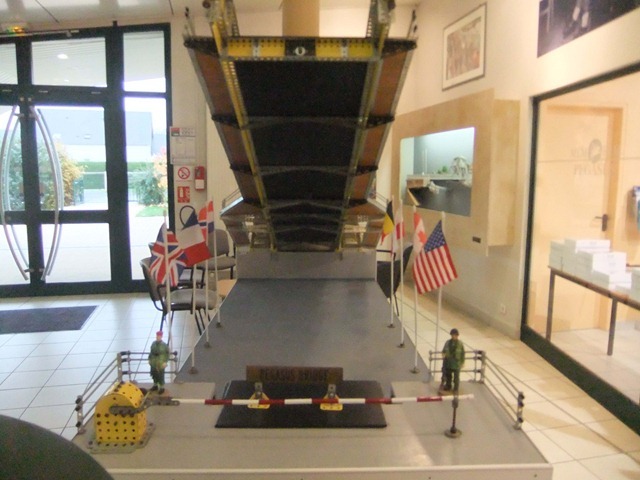 Vehicles are driven onto the carriage and then the carriage is moved by the gantry across the river. Onto the arsenal, where we then proceeded to find the dry dock and rope walk. 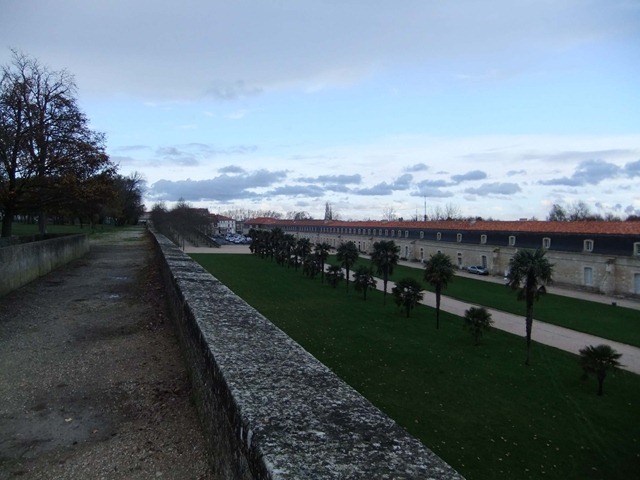 The main buildings were used up until the early 1920’s and since then the site has been restored along the banks of the Charente River. 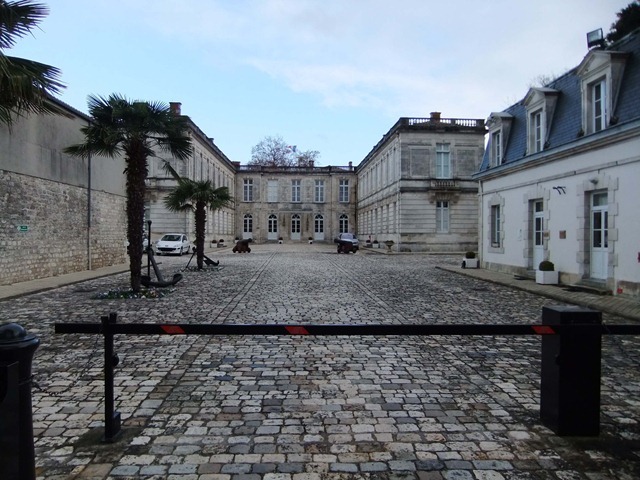 The main building is the Corderie Royale, the royal rope making works. 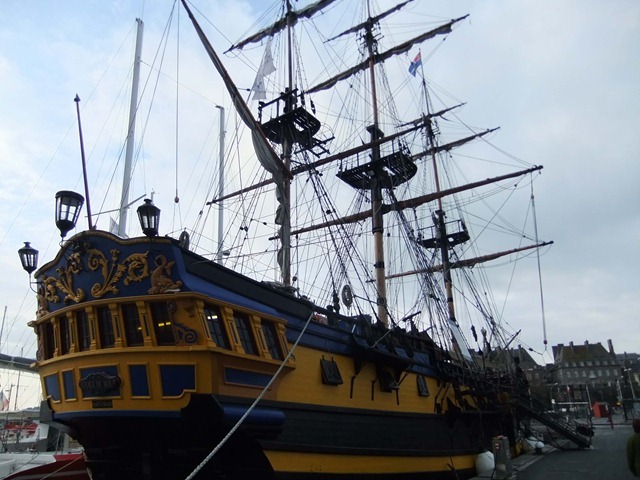 Next to it are two massive dry docks, one of which is currently being used to construct a replica of the Hermione an 18th century wooden frigate, according to the original plans. Sorry Dad, we did not get in to see it as they wanted to charge us 15 Euro each for the pleasure. 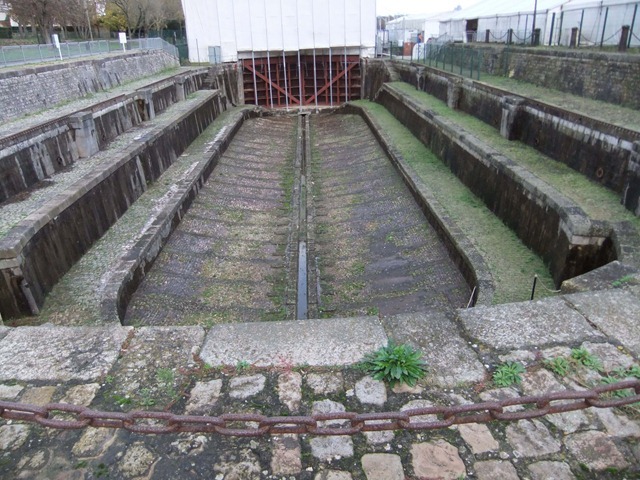 The opening lock, the covered area to the right side is the second dry dock within which they are building the replica. They are using techniques and tools that would have been used originally. 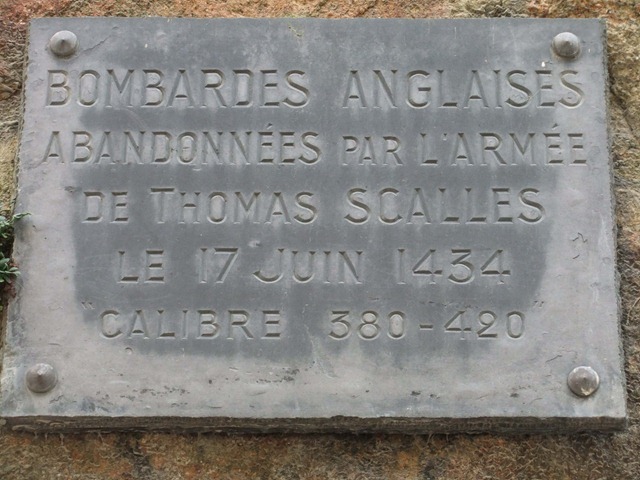 Then found this plaque. 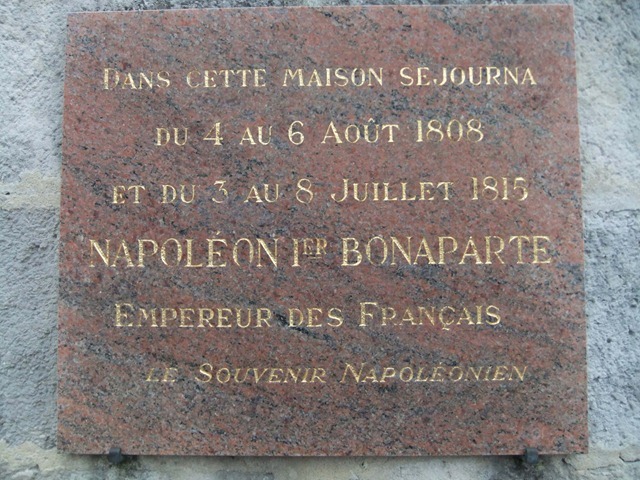 Wherever Napoleon went in France there is at least a plaque and often a preserved structure. 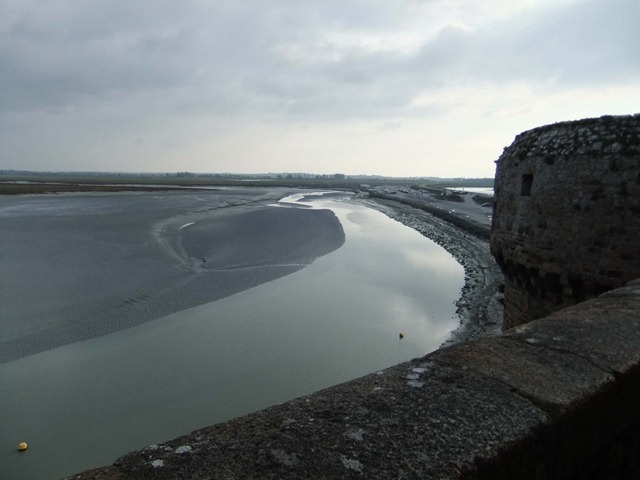 From here it was on to Fouras, located on the sea and the site of a large fort. 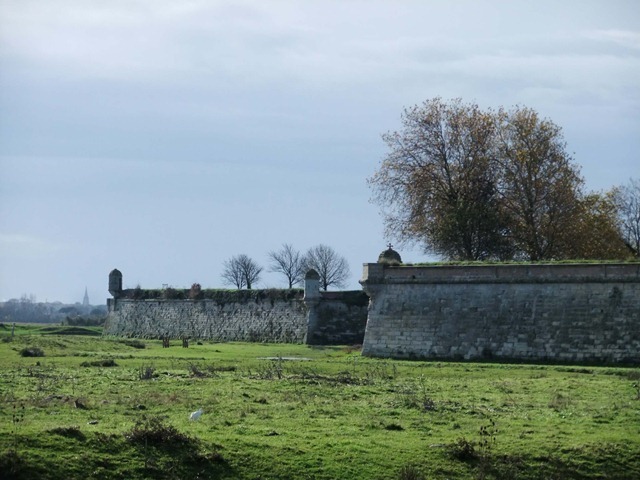 Fort Vauban at Fouras. This is the land end of a series of forts across the estuary mouth. 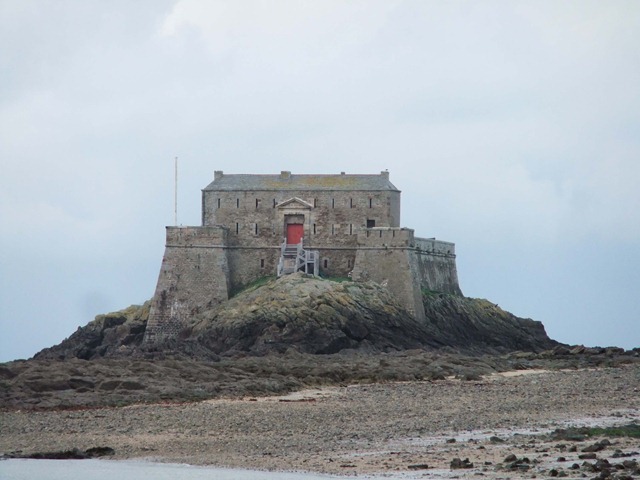 There are two others one on an island and the other in the sea built on foundations created for the fort. That one was hard to see as there was rain all around and strong wind whipping up spray. Further along spotted people out at the end of a breakwater fishing. Then noticed a couple were not using rods. 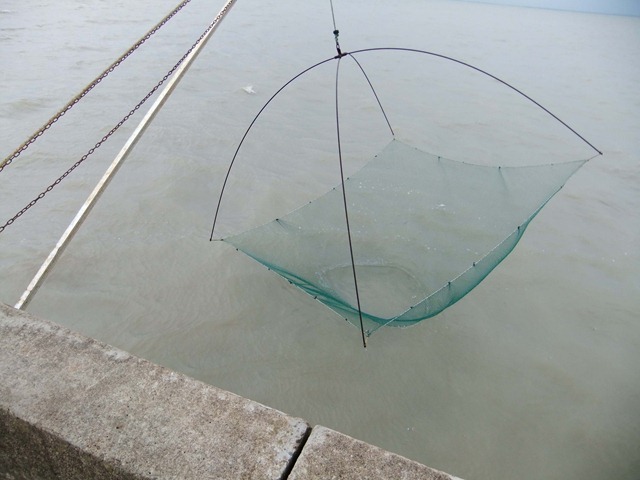 And then were able to reel the net up to check it. This they did about every five minutes so they got plenty of exercise. In the twenty or so minutes I watched they caught one tiny fish about four centimetres long!! 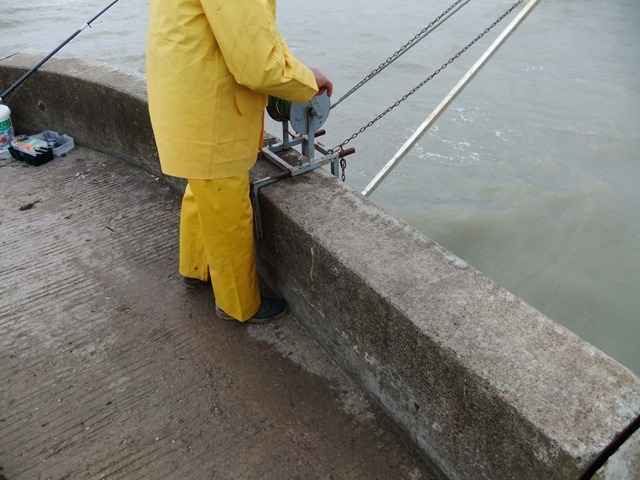 The line fishermen were having more luck catching sprats up to 20cm. 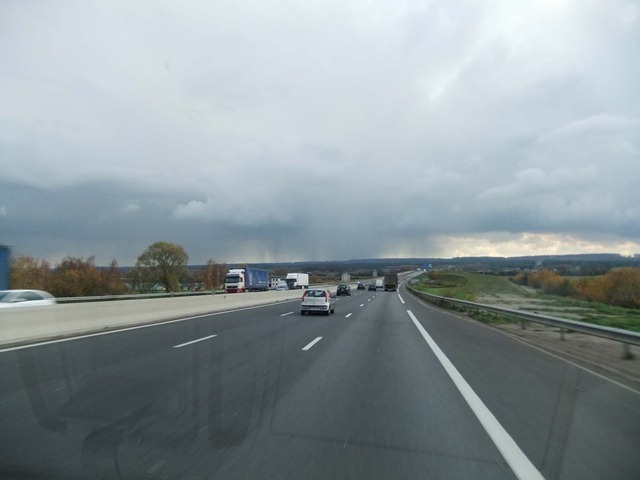 By this time the weather had packed in with the rain starting to be a real pest so it was off to La Rochelle and to find a camp site. 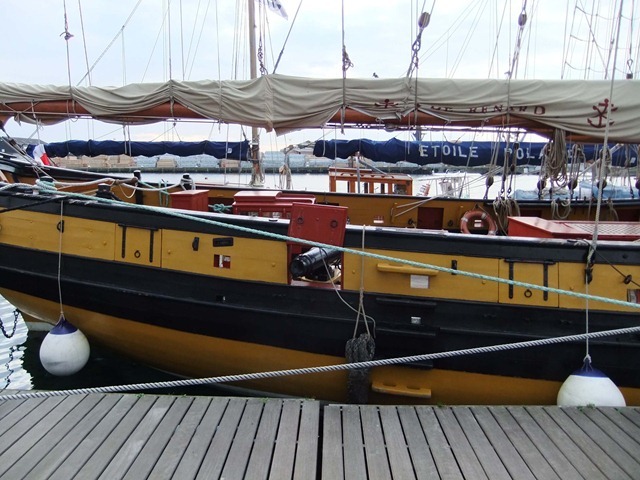 La Rochelle was one of France’s foremost seaports from the 14th to the 17th centuries. It now has one of France’s largest marinas so we will be heading to the Vieux Port for a tour in the morning. 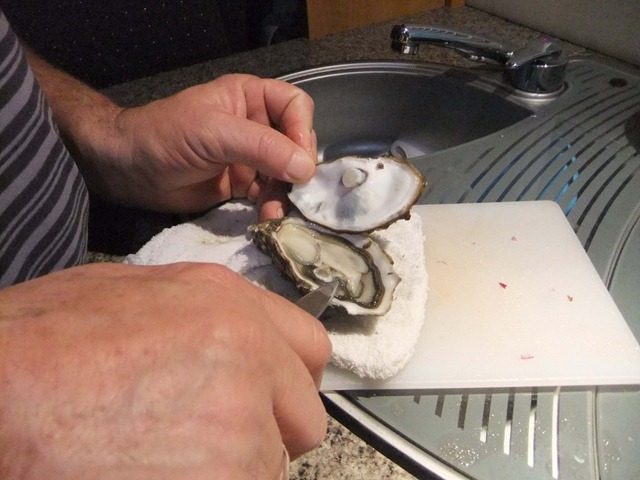 Oh and what happened to those Oysters? …they formed part of a delicious dinner. 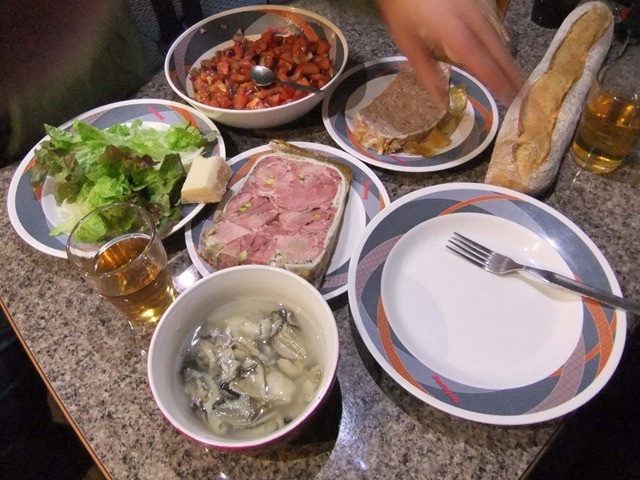 Roy had the oysters and Bernice the terrines and salad, with fresh bread and Pineau. We were off this morning with our plan firmly in hand from our friendly host. 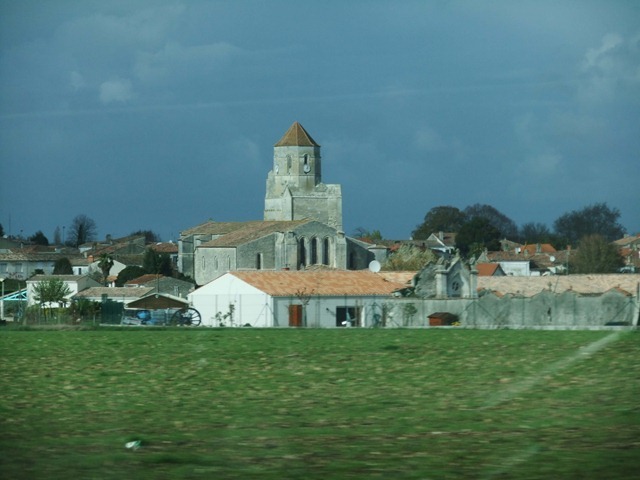 First it was off to Talmont-sur-Gironde, along the coast road and just a short 15 minutes away. We parked the camper in the parking area away from the village, as no traffic allowed and we walked in. First we came across the “Port”, after checking our map a few times, yes, indeed this was the port for the local fishermen. So if this is a port these must be the wharves, right? 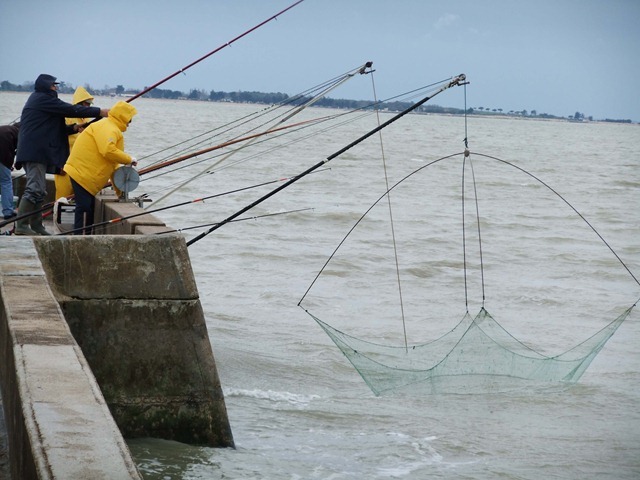 At the base of the ladders there were a half dozen small fishing boats. 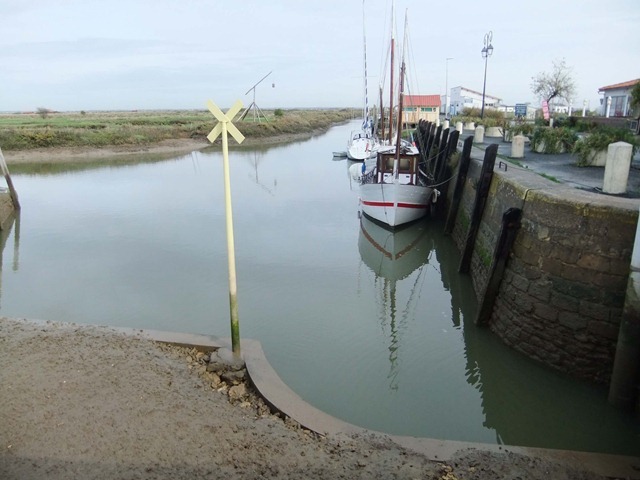 The tide was out when we arrived so the level of the water was some two to three metres below where it would be at full tide. 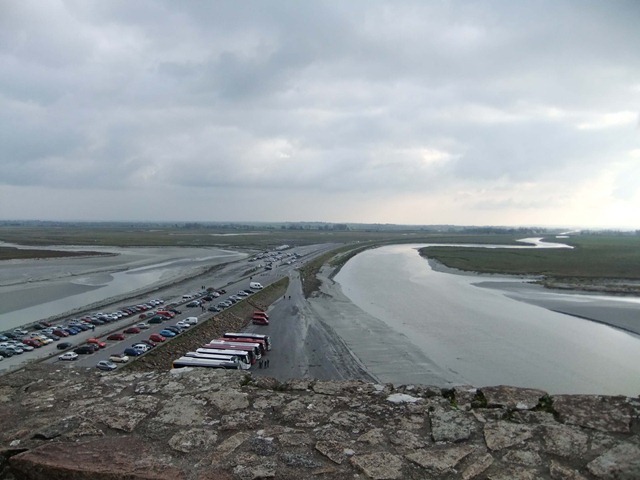 The mouth of the port opened into a relatively shallow bay in the Atlantic. 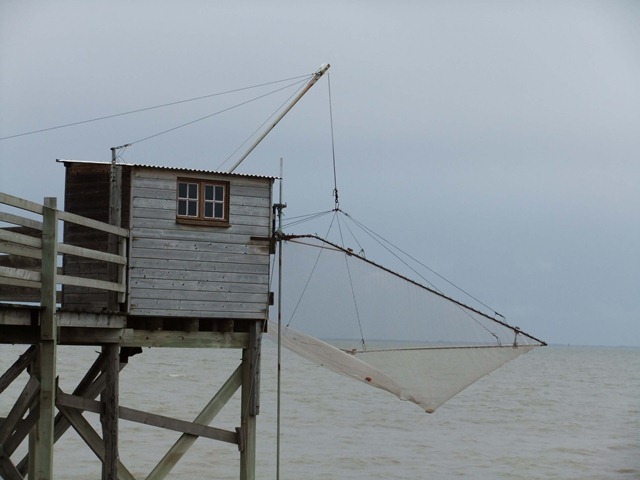 There was a picturesque line of fishing huts with dip nets which took our fancy at the far end of the bay. 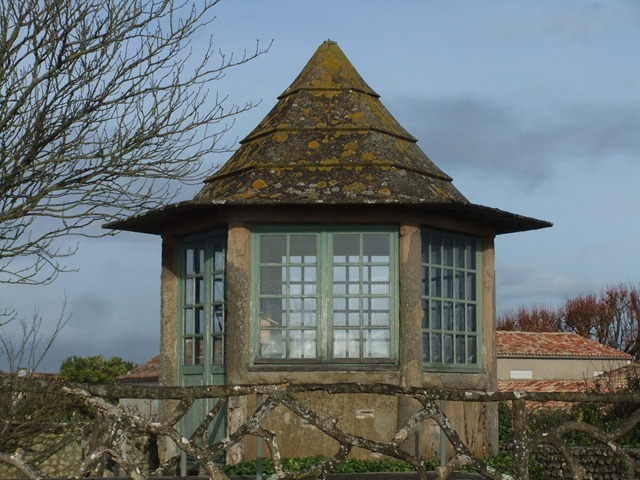 Seen on the way to the church was this lovely summer house in the back of the garden of a house overlooking the sea. 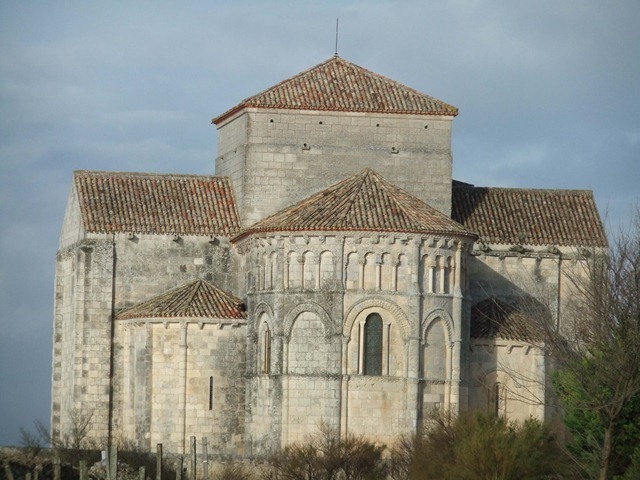 Then it was a walk around the edge of the village to see the Church of Saint Radagonde, built in the twelfth century. 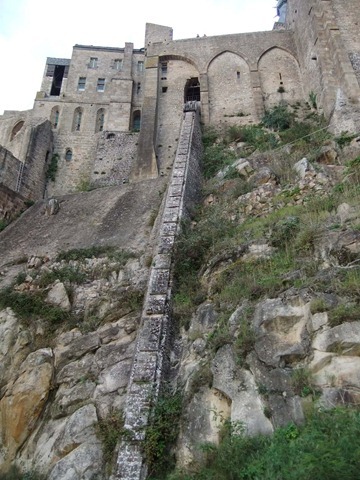 The church sits right on the cliff edge and is heavily fortified. 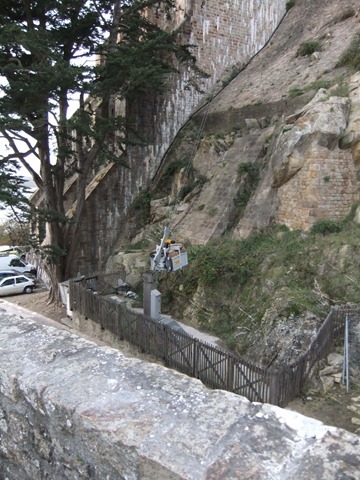 View from the base of the cliff looking up to the church. 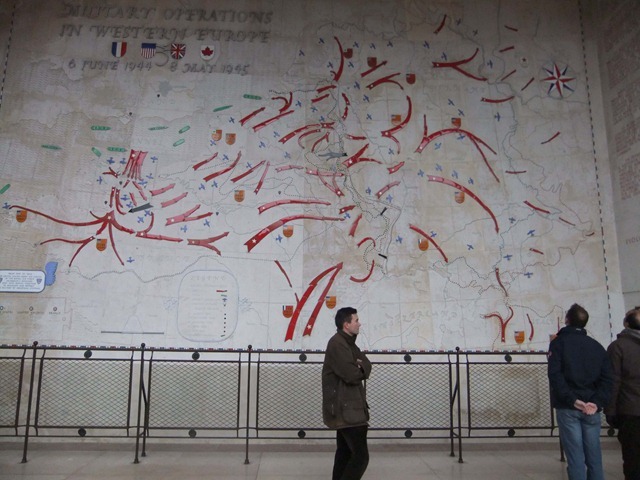 Note the person standing at the wall. 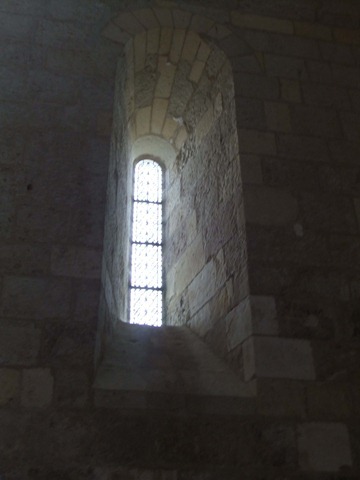 This picture of a window looking toward the sea gives some idea of the thickness of the seaward walls. 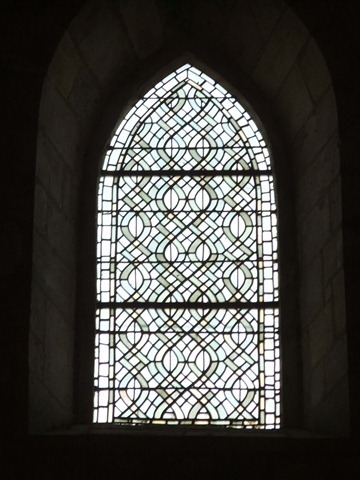 The church itself was very plain and unadorned on the inside, simple glass windows and wooden furniture. 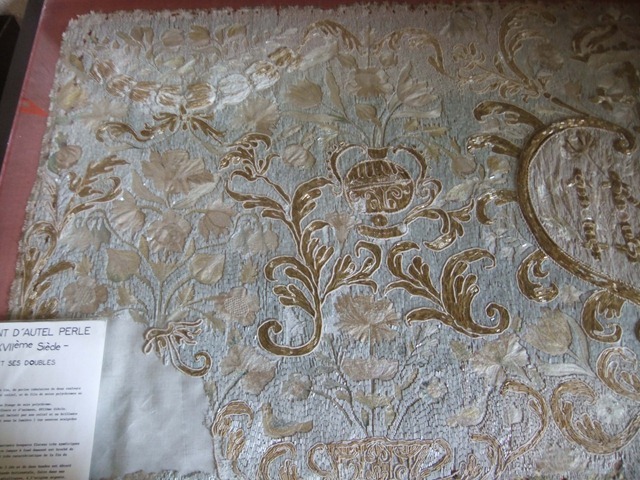 The most impressive piece in the interior was an embroidered alter cloth which was kept within a glass case. 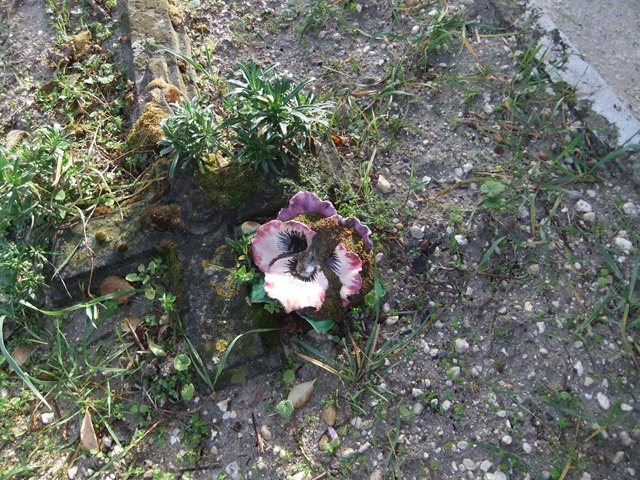 Outside was a cemetery, which afforded us the opportunity to comment. 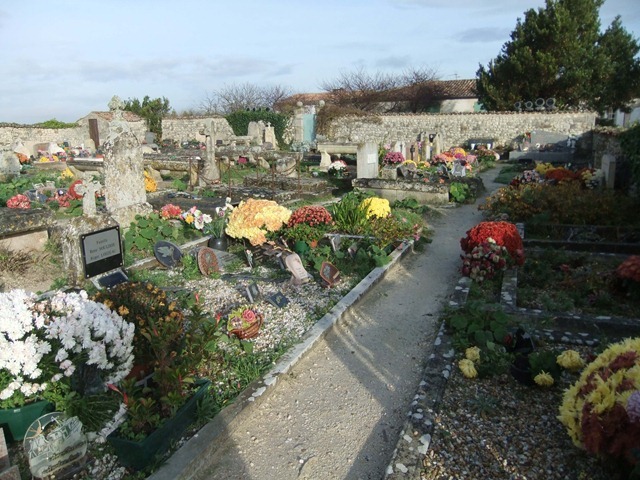 In all of the places we have been where there have been cemeteries it has been very noticeable that the French decorate the graves with large quantities of flowers, both artificial and real. 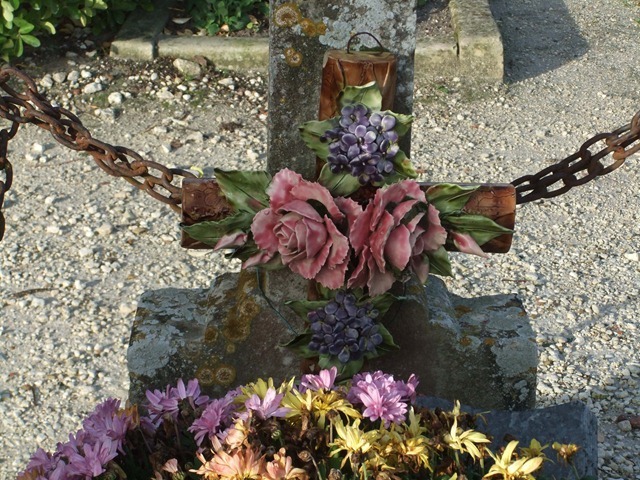 In fact in most larger towns we have often observed that there are flower markets opposite the gates to the cemetery. 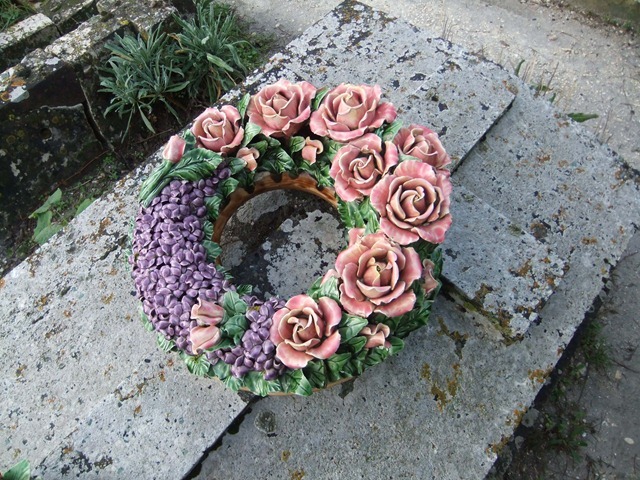 It is also evident that the placing of the flowers is not just an annual event, it seems as if they are continually renewed. 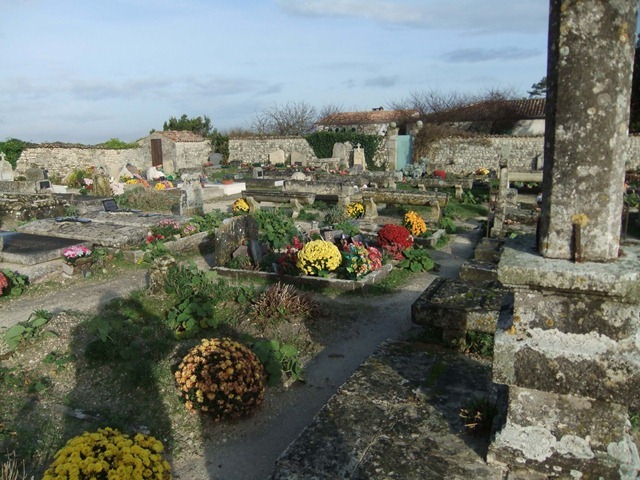 The effect is to make the cemeteries very colourful places. A saunter back through the village did not take too long as everything was closed up for the winter. It must be a thriving hub during the summer months as the car park apparently had over 700 spaces! From there we headed off to view Fa, a Gallo Roman ruin, but unfortunately it was closed to the public until the afternoon. They are still excavating the site so it would have been quite interesting to look around. Oh well, we have seen a few other ruins so far. 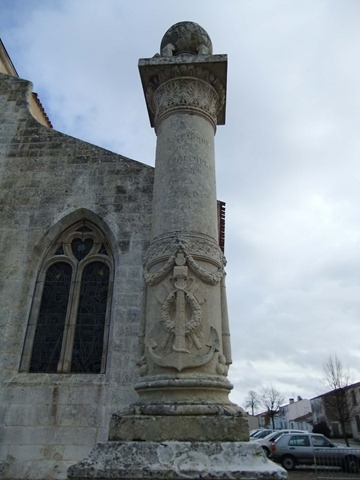 Then it was off to St Andre-de-Lidon as that is where we were told was a good place to do some serious Pineau des Charentes tasting, an aperitif made from adding unfermented grape juice to cognac, as well as cognac tasting. Unfortunately the place we headed to was closed and had moved much further away, but never to mind, there were plenty of others in the district. 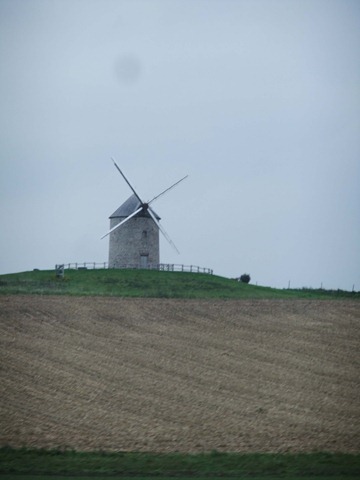 As well as close up view of the windmill spotted yesterday. 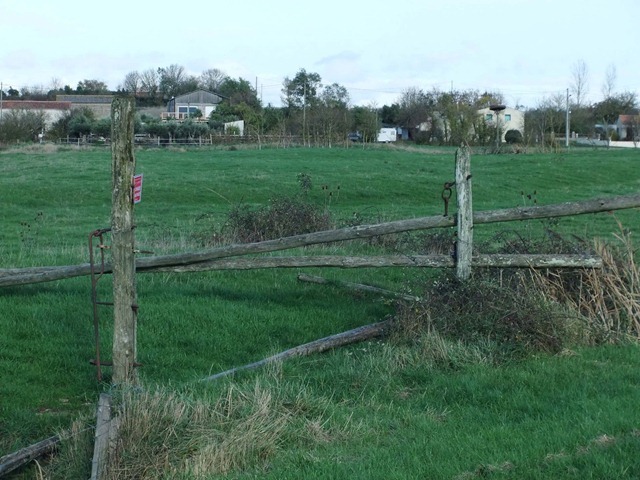 Also on our way we noticed the complete lack of fences over large stretches of the land. 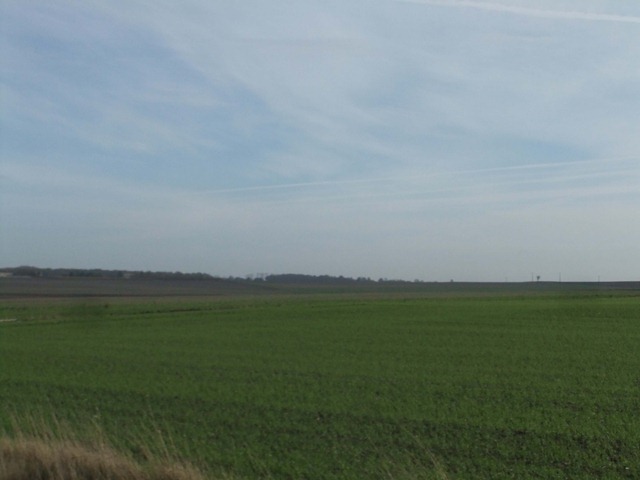 It was obvious that there were several farms in an area and yet there was no boundary fencing of any description. We duly found a cooperative distillery and tried both the red and the white Pineau as well as the 15yo and 25yo cognacs. We came away with a bottle of Blanc Pineau, a bottle of Armagnac (Plum/Prune cognac), and a few other goodies. Apparently Blanc Pineau is an excellent accompaniment to Fois gras! 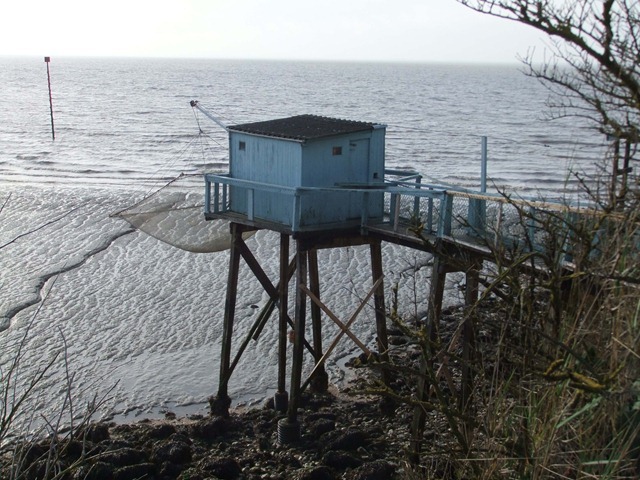 From there we were to head north to Mornac-sur-Seude, one of the villages along the large estuary which is an oyster farming area. 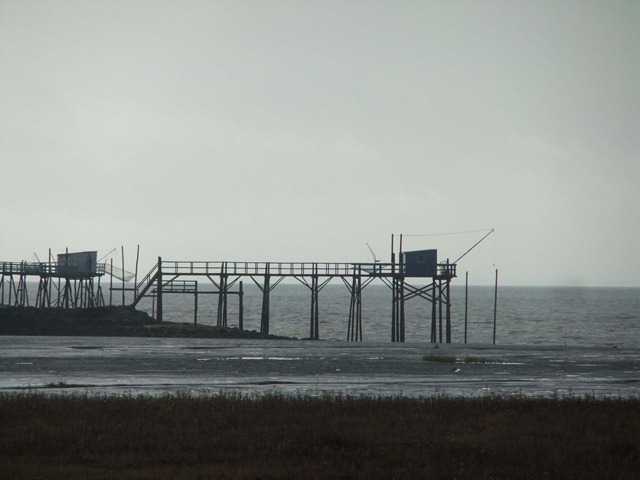 Apparently it used to be a mainly salt production area but now is dedicated to oysters. We got to the village in time for lunch. We arrived at the Port of the village. This one was very much the same size as the last but differently situated. 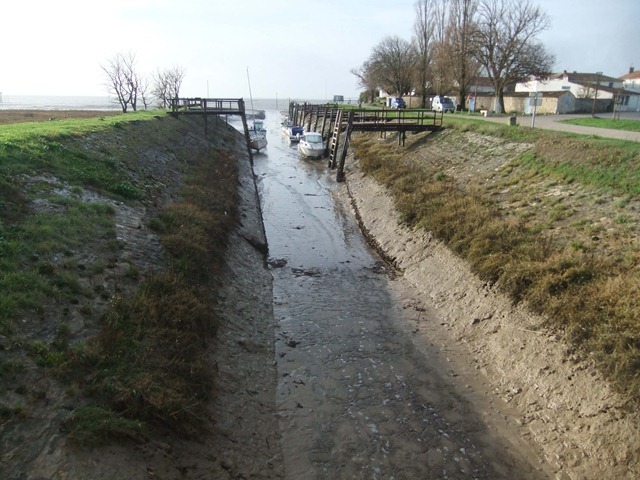 It was at least a kilometre from the sea along a narrow canal or drain. 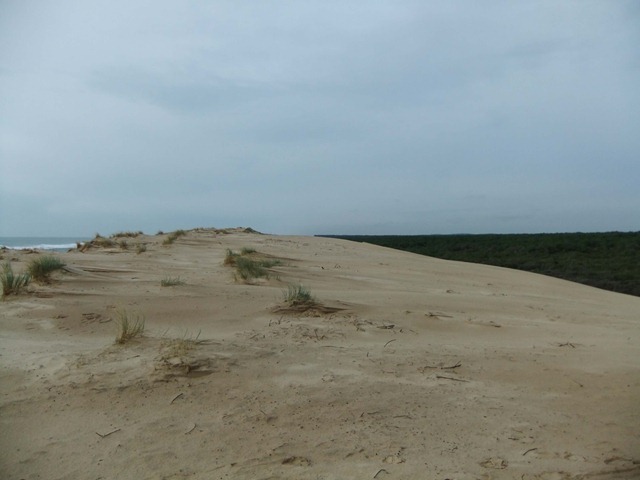 The whole area in which it is situated is a marshy swamp. 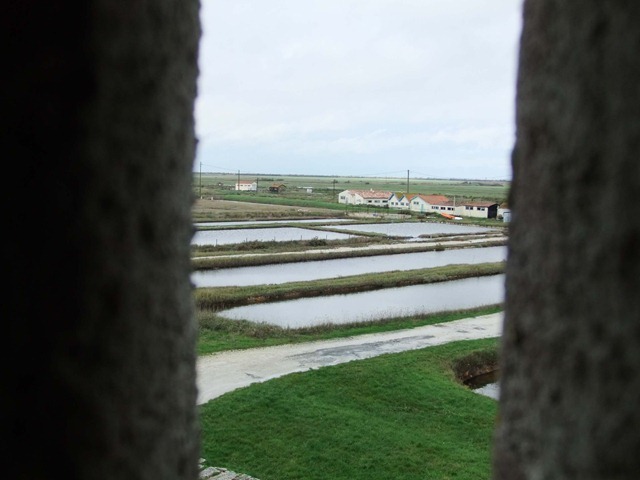 Originally drained and divided into salt pans it is now used primarily for oyster farming. 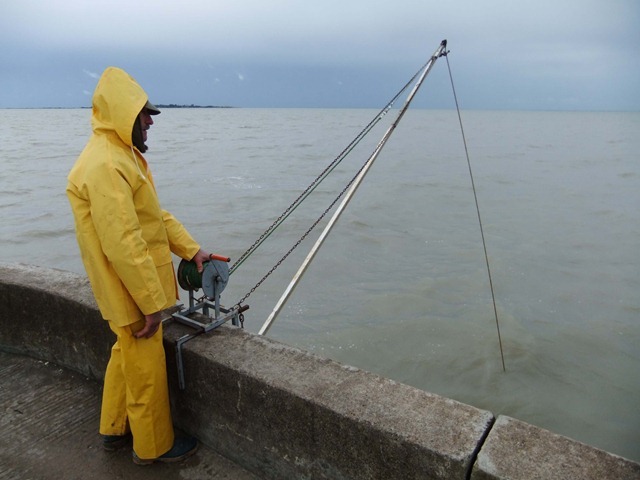 It did look a little larger after lunch with the tide in! 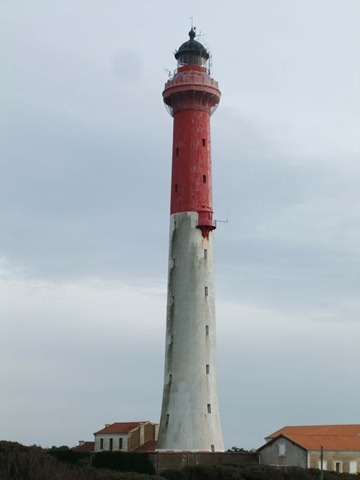 An interesting feature of the port is la Petit Phare or little lighthouse. This is a basket on the end of a pole holding a flashing light. 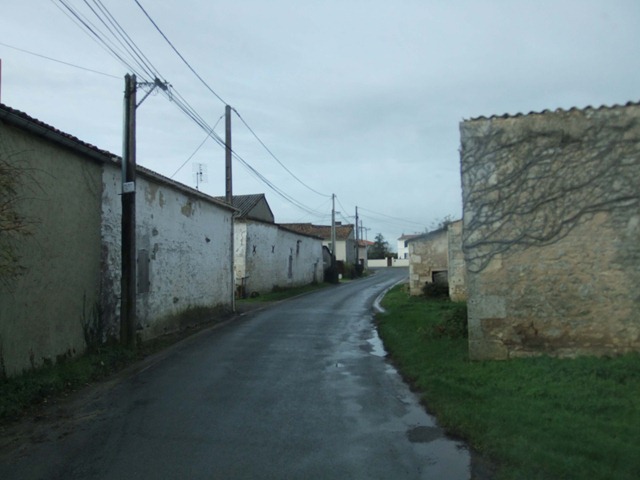 We made our way into the village for a look, but as it was winter and lunch time there was an air of abandonment about the place. 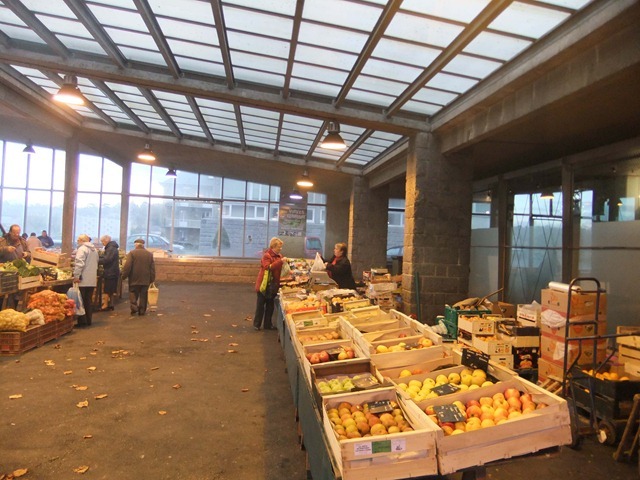 We did however come across this Market Hall. 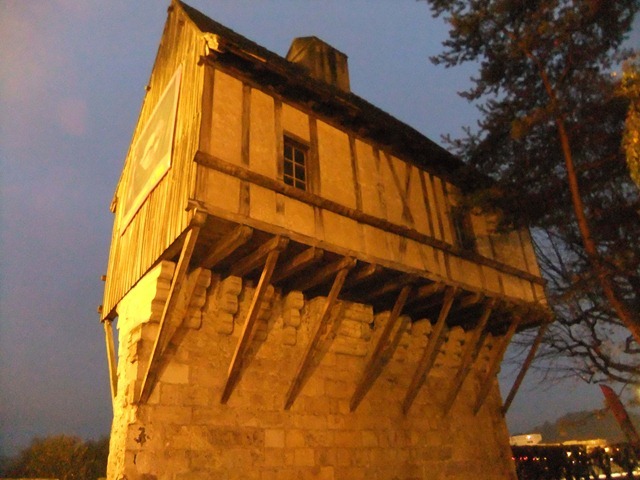 Built in about the twelfth century. However it is a bit like grandpas axe, having been rebuilt several times over the course of its history, but it is still used on market days. Finally we arrived at a restaurant and were seated ready for our meal. 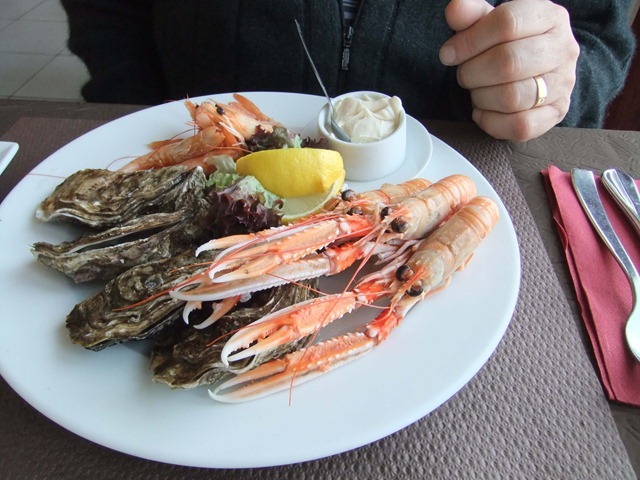 We asked the waitress if they served a selection of seafood, she very kindly pointed us in the direction of a restaurant just around the corner by the port. Now onto lunch, today just so happens to be “Beaujolais day” the day that the first of the Beaujolais are released and keenly sought after. 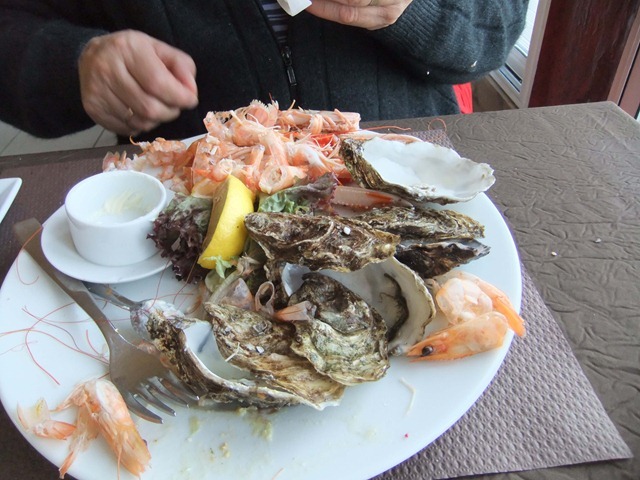 For lunch Roy had a platter put together by the chef of fresh oysters (in the shell), langoustines, and large shrimps. 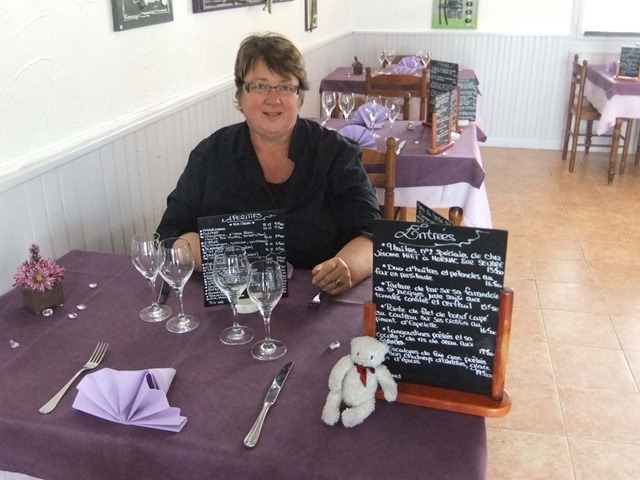 Bernice started with a scallop and cuttlefish salad, followed by monkfish very lightly cooked with a delicate sauce and we finished off the meal with tarte tatin (as the waiter said – well, you are in France Madame). 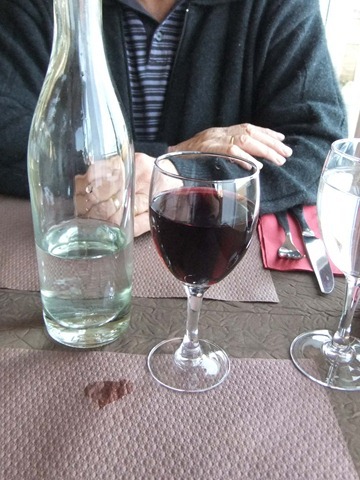 Bernice had a glass of Beaujolais to accompany her meal whilst Roy had a delicious local white. Mum and Dad, we hope that you enjoy the photos and don’t drool too much! After a relaxed lunch we headed off again, but first a quick call into the shop next door which just so happened to make sweets on site. They made Bois Casse which is a pulled sugar confectionary reminiscent of bark in looks (a regional speciality), so a quick sampling was done before we headed back to the van to continue on our route. 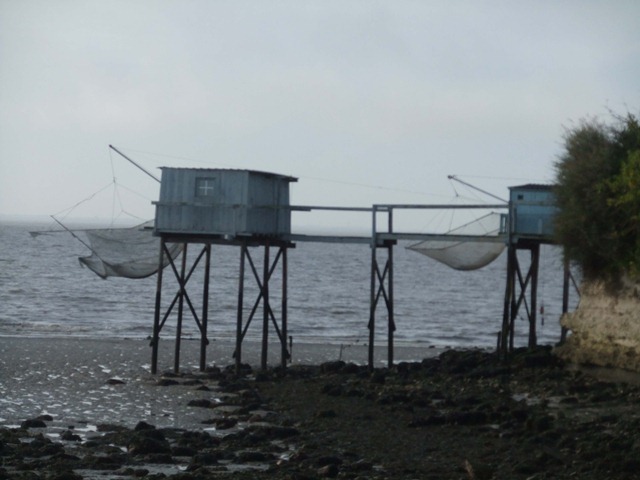 We drove around the peninsular back towards Royan, stopping here and there along the way. A great day today, tomorrow we head off armed with more maps and instructions on where to go, where we end up is anyone guess. 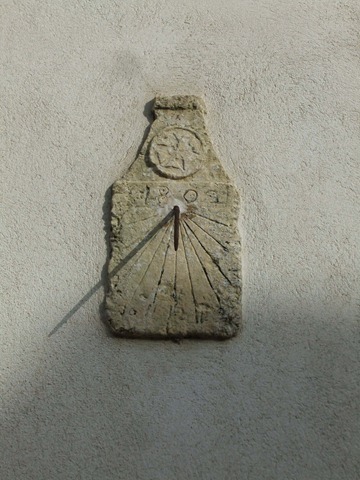 The obligatory sun dial 1809 model, and still working!! We woke to drizzle and overcast weather but it did look brighter on the horizon. 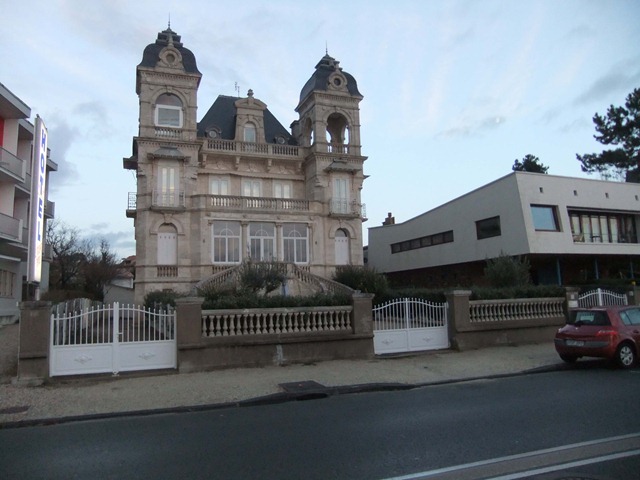 We were off and on our way to Royan, north of Bordeaux and on the Atlantic coast. 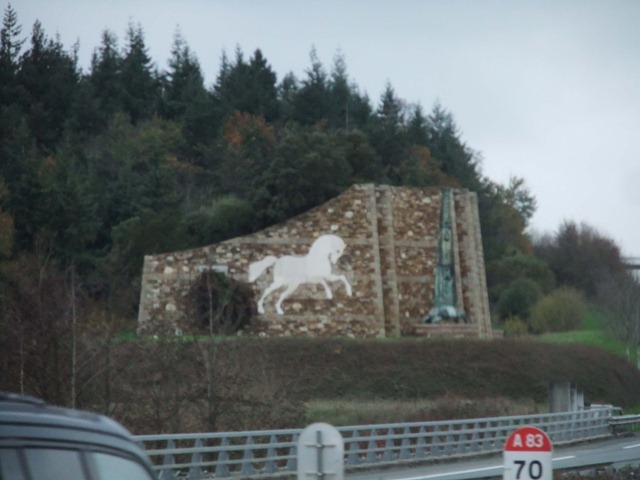 The drive today was through gentle rolling hills ranging from the oak covered hills of the Dordogne through into Bordeaux wine country. 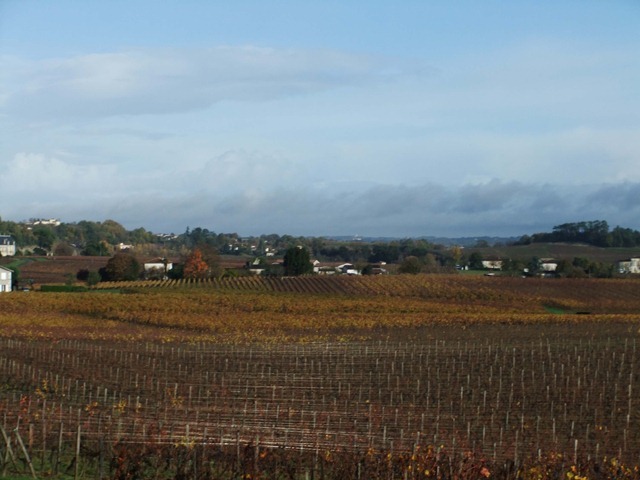 Oak forest as a background to the rolling foothills of Bordeaux. 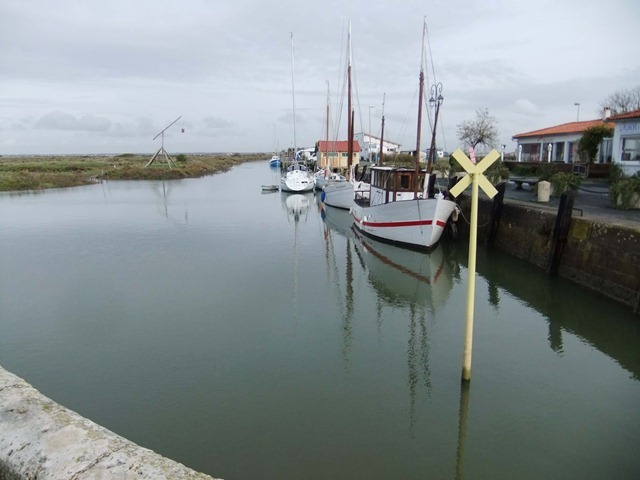 We programmed Heidi to take us to Royan (nice sounding name) as we found a camp site there that was open all year AND it had all the facilities we required. Along the way, just out of St Emillion (famous wine growing area), we found our trusty McD’s for our free wifi fix of the day. Roy had work stuff to sort out and send emails, so after an hour or so there we were on our way again. 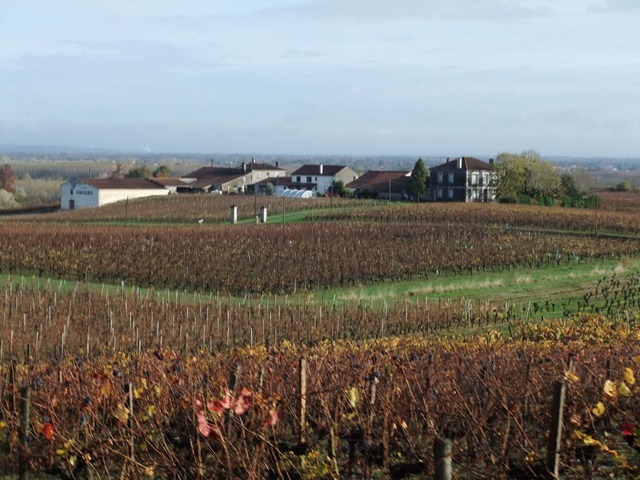 Our route varied between the Autoroute and back street quaint villages along with wineries. The clouds were disappearing and the sun was starting to shine, and it was a lot warmer that yesterday. 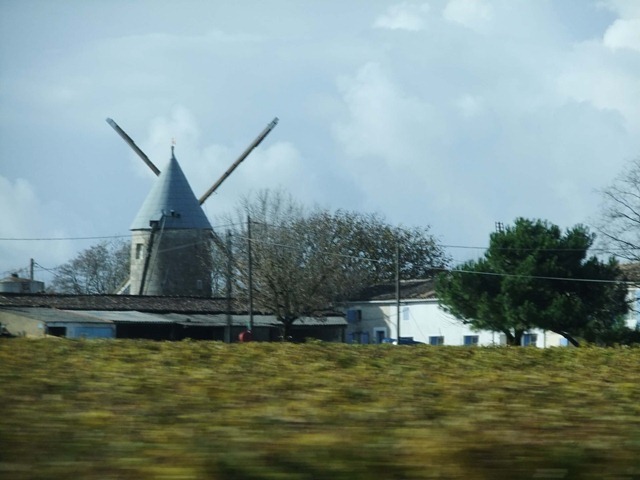 It was not long before we were heading towards Royan where we discovered that the wineries are now interspersed with distilleries, yes we are in Cognac country!! The plan for the day was to get to the camp site, check it out and then attend to all matters domestic related i.e. washing (clothes as well as ourselves! ), clean out the van, have a general tidy up as well as make sure everything is fully charged. That done, we have decided to stay here another day as there is soo much to do and see, oh, and taste! 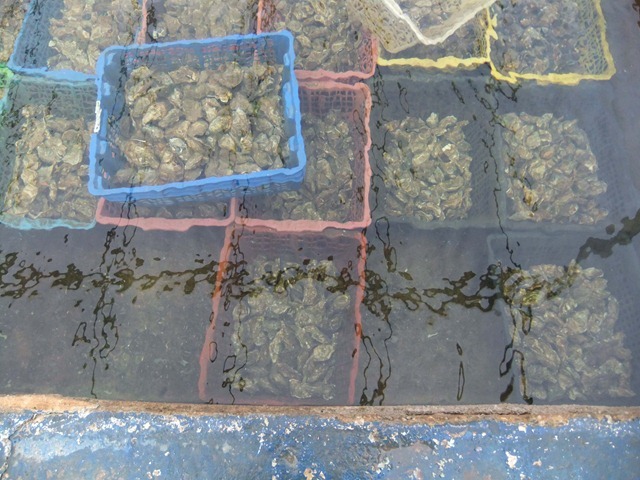 Along with the wineries and distilleries on the list for tomorrow, we have also found out that this is an oyster farming area….guess what we will be doing tomorrow? Roy went for his usual stroll before settling in for the evening. The promenade along the beachfront at Royan. 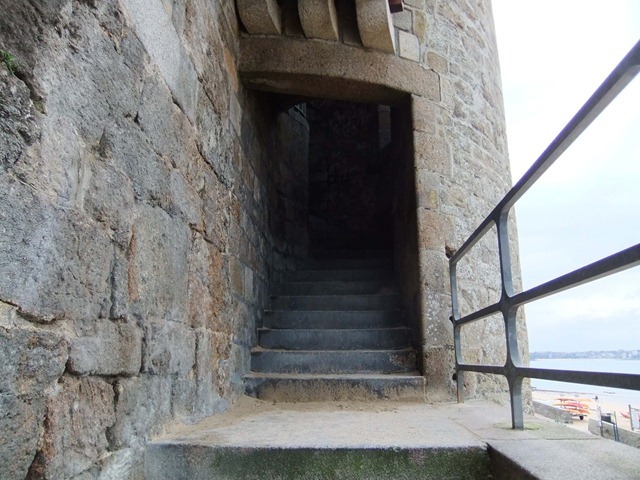 Bernice expressed an interest in going to a lighthouse that appeared in a number of publicity shots for the area. 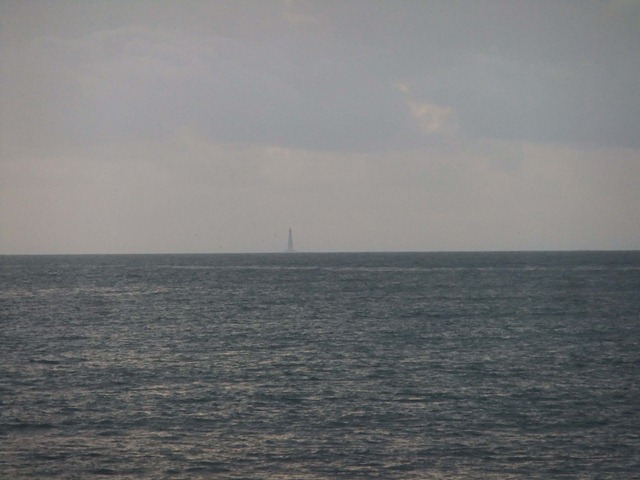 This may be as close as she gets as the lighthouse is in fact some miles off shore!!!! We have found ourselves a fantastic campsite, not only is it clean and tidy with great facilities, the owner is the real gem of the place. As we started doing our washing, he asked if we would like a clothes rack to dry the laundry (the weather was decidedly unpredictable) we said yes, then he asked if we needed a second rack, well, yes, that would be great. 10 minutes later he appeared with the second rack – a brand new one he had gone out to buy! 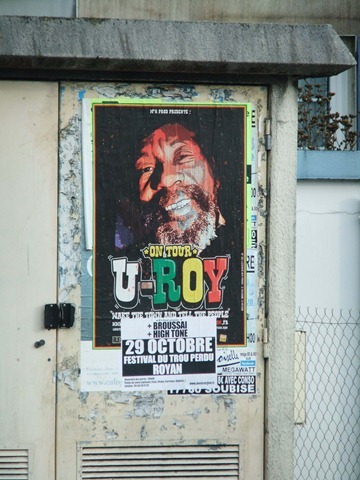 Roy went off to see him again this evening to tell him we would like to stay a second night and to see if he had any recommendations of what to see tomorrow. 45 minutes later we have not only tomorrow planned and organised, but maps, brochures, and highlighted spots of the best/must see places to view/taste/sample but also maps and brochures for our continued trip further north. All this was conducted in the usual manner of him speaking French at 100 miles an hour and our usual Franglaise. PS. 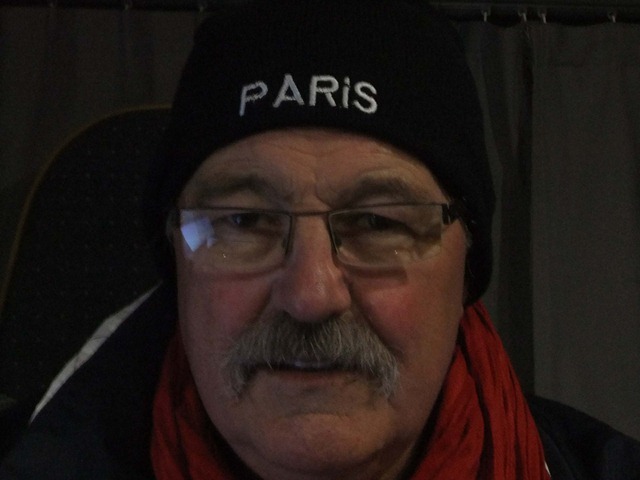 Have kept the larger font around the photos for you John – hopefully you can read them now!! That is exactly how the day started. Woke up to a very, very cold day…and we had run out of battery power which meant that the gas heating was not kicking in. Well, we have been parked in the same parking place with no hook up to power for the past couple of days. Roy drove the van to the other side of the parking place where the dump station etc was located, and it also had a 2Euro coin slot which would give us power for one hour. So we sat parked up for the next two hours recharging everything we possibly could. So much for our quick get away planned this morning. By this time it was 10am, we headed to McD’s on our way out of town so that Roy could email off some work he had been doing. 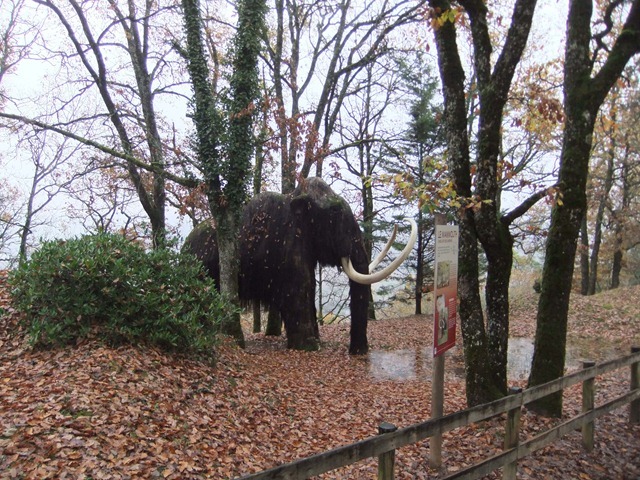 Next problem, he could not get the email to send as it was too large, so lots of fluffing around until we had had enough, gave up, and headed off to Lascaux. 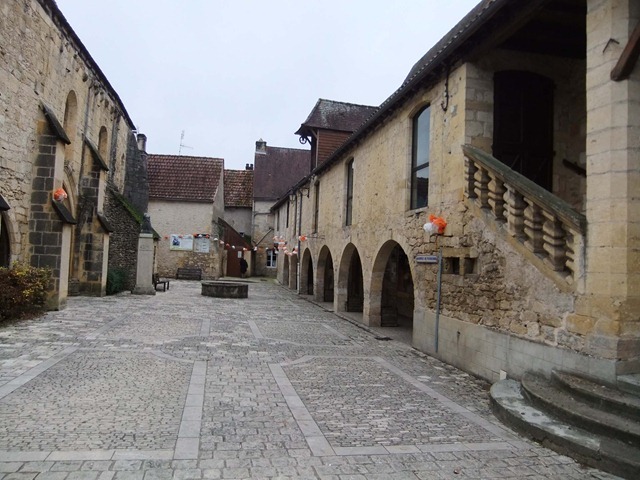 Got into Montignac which is the closest town to Lascaux right on lunch time, so everything was closed for the next two hours. Hmmm, off to Lascaux II where we thought we would have our lunch if the caves were closed for lunch and wait out the time. 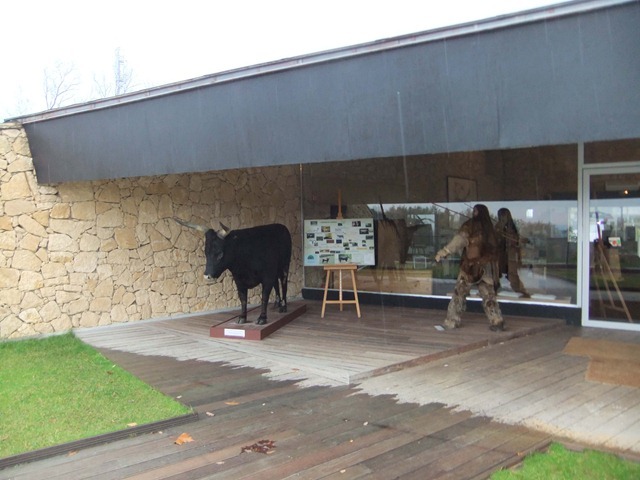 But on arrival at Lascaux II what did we discover? That the caves had closed two days earlier for the next three months! 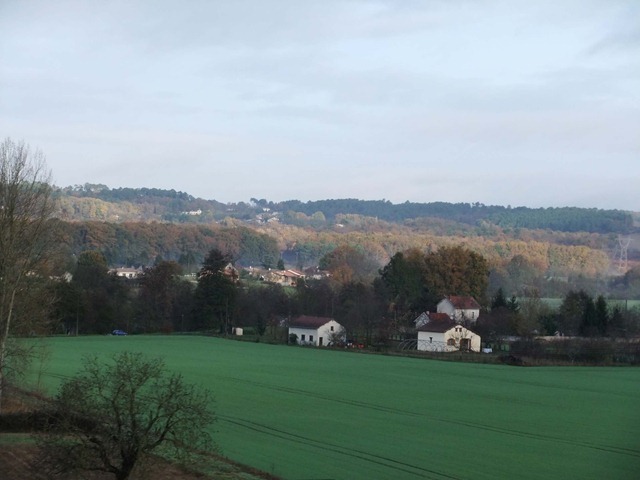 I should explain that one cannot visit the actual Lascaux caves, these are reserved for research and preservation of the original works. 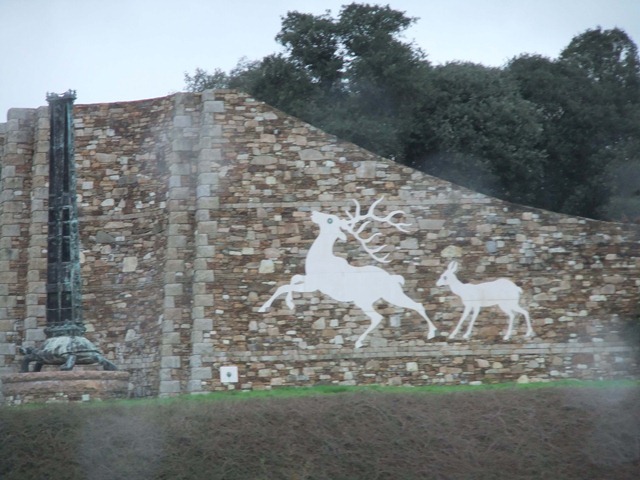 Lascaux II is a series of replica sections with attendant drawings and sculptures. By this time we were both pretty darned peeved. There was a sign up saying that we could visit the cave reconstruction at le Thot, 15 minutes away. Heidi was duly reprogrammed and off we set. Oh, and did we mention the weather? 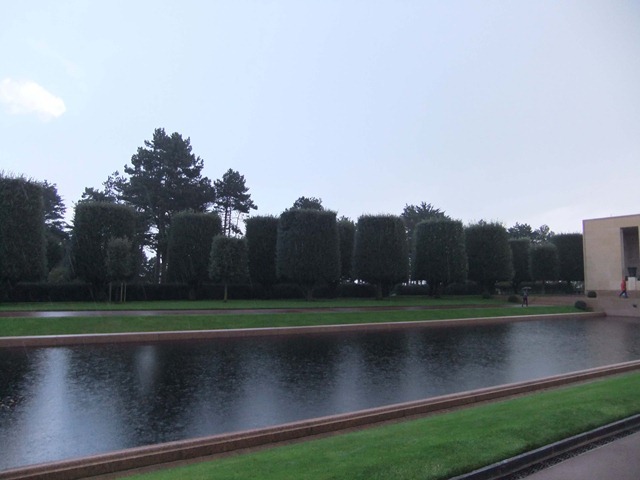 It was just plain miserable, wet and utterly freezing cold. Bernice had to search out her gloves, and thank goodness for thermals and for our Waimate purchases, before we left NZ, of possum/merino jackets. 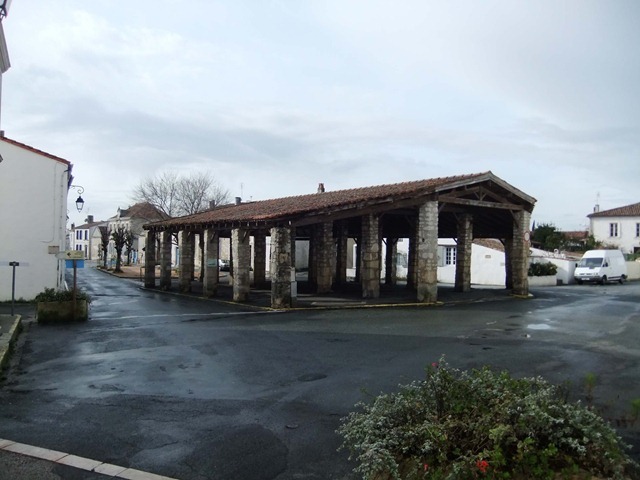 We duly arrived at le Thot, but of course it was closed for lunch, so we sat in the car park and made sure we had a delicious repast of stunning artisan bread, terrine de campagne, pickles, local cheeses with lots of hot tea to keep us warm. Simple, but oh so delicious. Once we got inside the complex though, were we very delighted that we found this wee treasure. 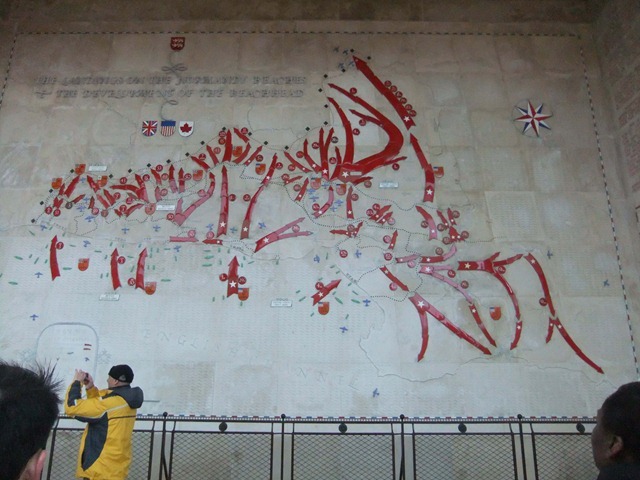 First you are taken through a complete reconstruction of parts of the cave walls complete with the drawings/painting. These had been created in moulds which were then painted and marked to identically represent a particular part of the cave and the drawings thereon. 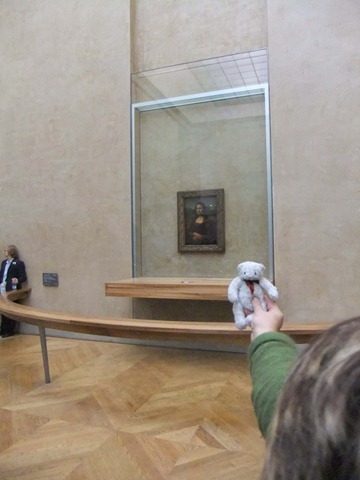 This is the same as at Lascaux II. At Le Thot they have three sections, none duplicated with those at Lascaux II, each at least 5 metres long by 3 metres high. These are presented first as you enter the underground section. There is a description of each which we were given an English translation of. The next part of the cave was dedicated to a series of dioramas each showing different facets of life in the caves based on discoveries at Lascaux. So there was paint making, drawing, bone carving and flint knapping. Then the most interesting and illuminating part. There were three theatres each projecting images onto the same size and shaped wall sections as you had not long before seen. They then proceeded to deconstruct and reconstruct each of the drawings. this illustrated clearly the layers that were involved in each, where they had been started, where they had overdrawn on previous images, where they had carved outlines before colouring, how various cave features had been used to accentuate aspects of the drawings. Oh and by the way did I mention that all of this was only available in French, also that it did not matter as the whole presentation was made abundantly clear by the way the images were being portrayed. 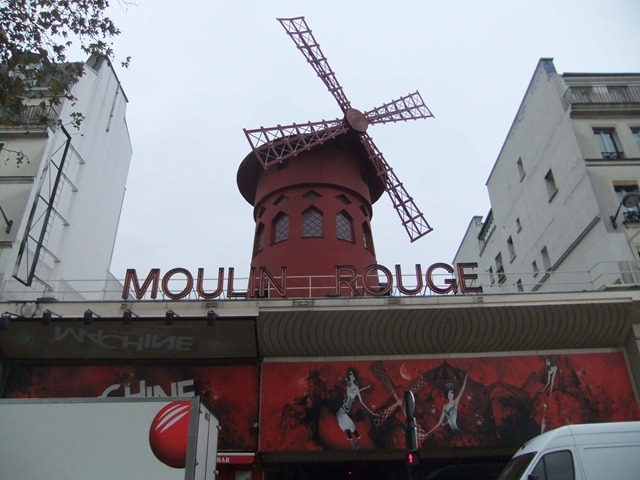 Unfortunately we could not photograph either the panels or the movies so memories and Google will have to suffice. Having been blown away by the “cave” we then went outside where they had built up a collection of animals representing the descendants of those pictured. 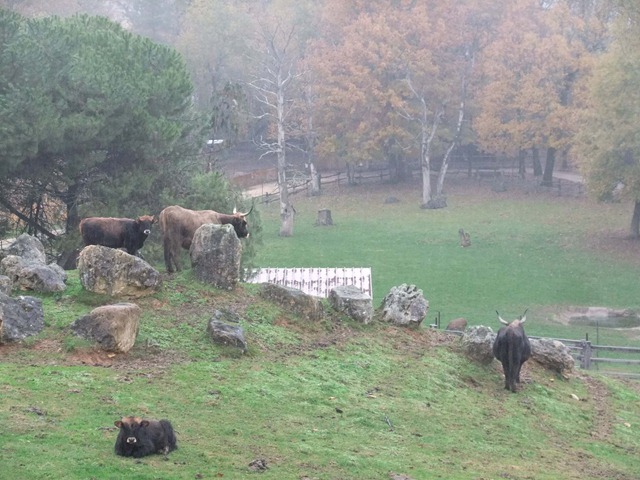 They had the usual deer and ibex, but also a breed of cattle that had been started by a German in the 1930s to try to produce a modern auroch which was depicted in the paintings. 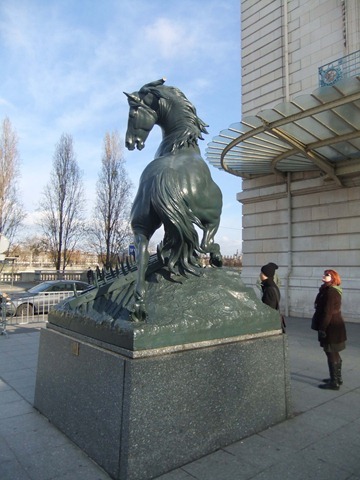 They also had a very very large mule similar to the depictions and a paderweski horse which people believe is a living replica of the early horses. People, observing two persons with umbrellas in the bitter cold and rain wandering around outside looking at animals doing their best to hide from the rain, must have wondered what they had struck. This is an interesting exhibit. 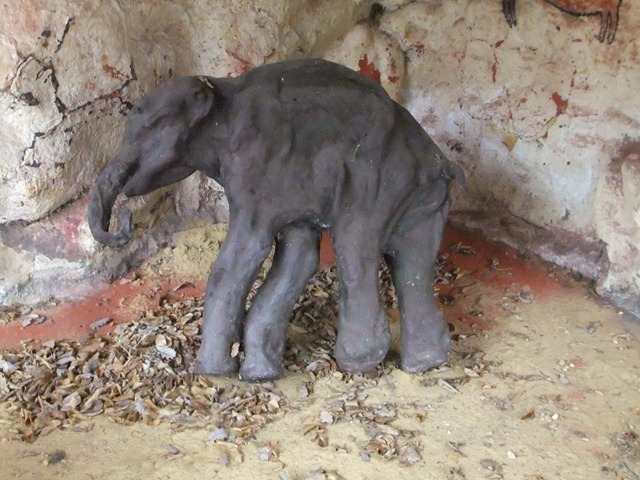 It is a cast of the mammoth calf found preserved in permafrost in Siberia. We have now seen several of these casts at various attractions. Happy now that we had seen and understood a bit more about prehistoric paintings, we programmed Heidi to take us to Perigueux, we were running short of places to stay that we could find that were open. Here we found a parking place specifically for campers. This one in particular was very well laid out and maintained and had a “warden” to collect our 5Euro parking fee. We felt that this is exactly what Oamaru could do with, a simple safe parking spot for campers that provides a waste dump, grey water dump and fresh water. We arrived in town just on dusk, Roy went for a walk into town while Bernice organised matters on the domestic front. 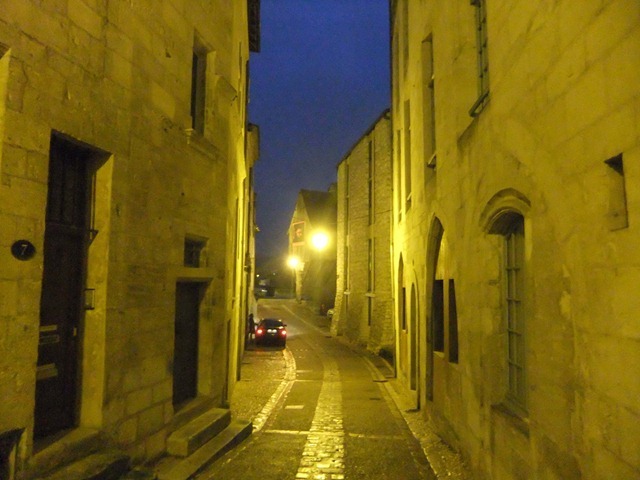 Perigaux street, sodium vapour lamps play havoc with colour!!! Although the day started off slowly, and it seemed we kept coming up against block walls, we did have a good day and we enjoyed ourselves. Tomorrow we head off for…?? ?